It has been our long-term goal for the last 20 years to expand our reach to most countries worldwide and have our products exported directly from our factory to our worldwide customers. After entering the Latin American markets of Brazil, Argentina and Peru achieving direct cooperations to Venezuela was a natural outcome. So, we are glad to announce that we have shipped our first orders to yet another country on the northern coast of South America, the legendary Venezuela. Also, we have been aware that our products were distributed in France many years now and have seen them included in many final projects, but our main goal has always been to have them export them to the French territory directly. After evaluating some important business contacts, we have established several important collaborations and we are at the moment producing a specialized product for luxurious apartment complexes in France. We will be again in your disposal at Wednesday 02.01.2019. We thank you very much for the good collaboration so far and we wish you a Happy New Year! We always believe in setting the bar even higher is every project that we implement and that is the reason why we always welcome new and challenging quotes from our international clients. 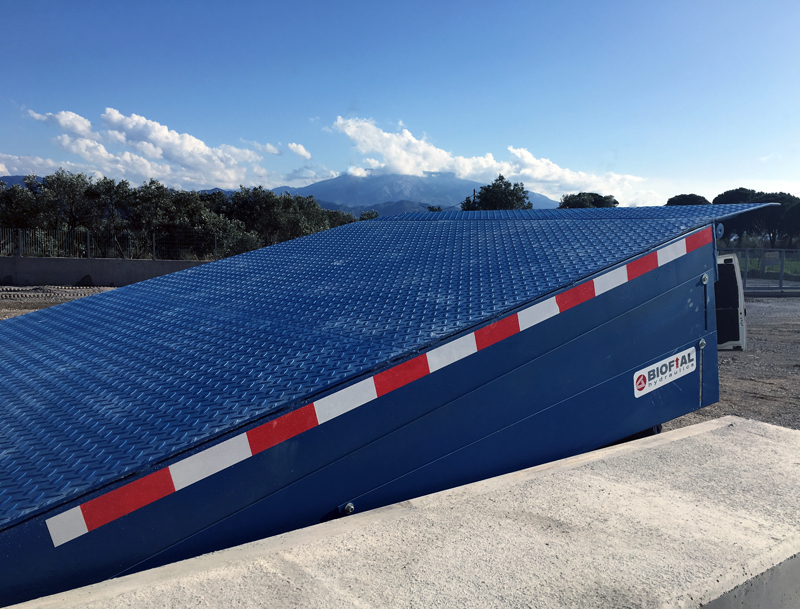 For example, this new hydraulic scissor platform was custom-made by BIOFIAL HYDRAULICS for a specialized project in Bosnia. The platform has dimensions of 2,80m × 5,50m and total height of 3,55m. It is designed to lift weight up to 3 tons in total. Before the delivery was made to our client so as to install it to site, it was tested in our establishment to make sure of its proper function and that there will operate exceptionally. Thanks to the high expertise and of our R&D department and the long-aged experience of our production department, this project is now performing unstoppably and excellently in one of the biggest industries in Bosnia. 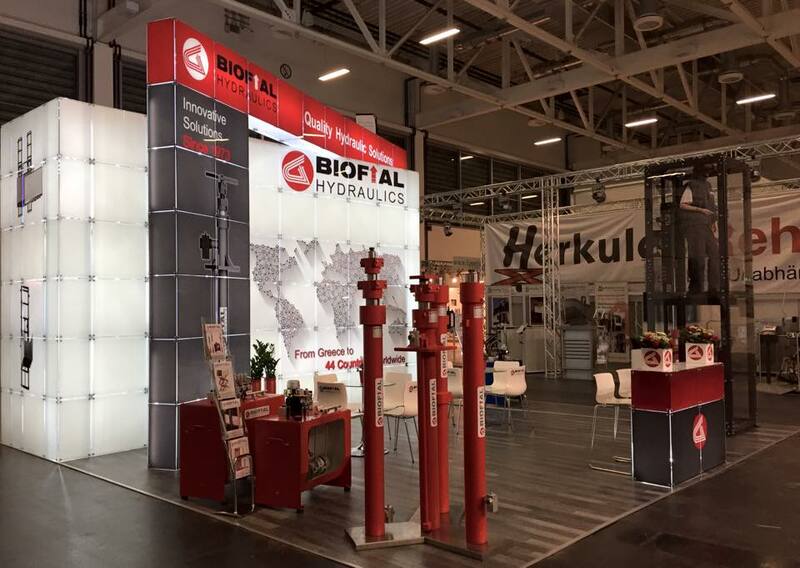 We have a lot planned ahead for 2019 as BIOFIAL HYDRAULICS and its team, are participating in two of the major international elevator exhibitions held in Europe. Our first appointment is for the 15th and 16th of May at the LIFTex INTERNATIONAL Exhibition which will take place in London, Great Britain. Since this will be our first attendance in this exhibition, we are looking forward to meeting customers from the Northern part of Europe and establishing new business contacts. 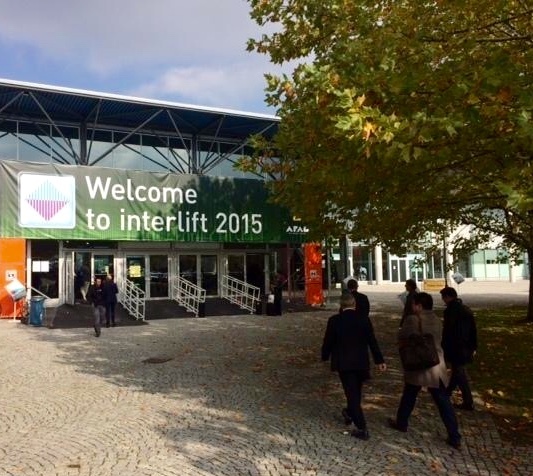 At the middle of October of the same year, the 2019 INTERLIFT Exhibition will take place in Augsburg, Germany and as always, it will be the most significant world meeting for the lift industry. 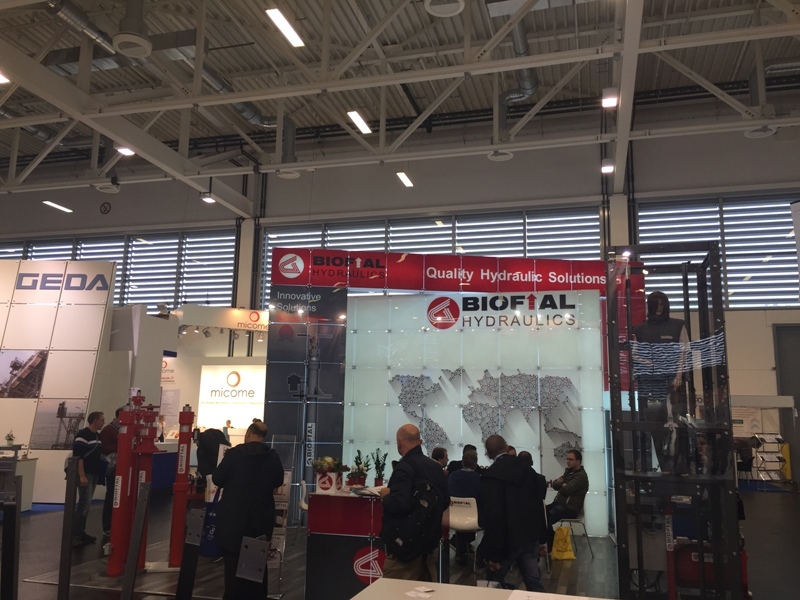 Every two years this exhibition attracts professionals from across the world and of course BIOFIAL HYDRAULICS could not miss it! 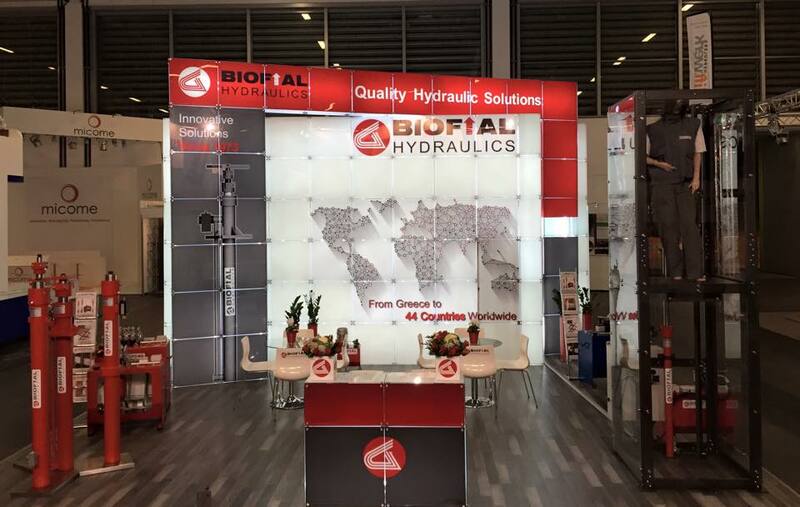 As we we have been doing for the past ten years, the BIOFIAL HYDRAULICS team will be present in Augsburg, to welcome our year old cooperators and meet potential ones. London or Augsburg? It’s your choice! We are certainly looking forward to meeting you in any of each or in both international lift events in Europe! We would like to inform you that, as we do every year, our company will be closed due to the summer holiday, for the period from 04.08.18 up to 19.08.18. In case you have any pending orders or you wish to place a new order, which you would like to be delivered until 02.08.18, we are kindly asking you to contact the BIOFIAL HYDRAULICS production department as soon as possible, so as to have the necessary time to assist you. Thank you for the cooperation so far! We wish you a happy and relaxing summer! Wir möchten Sie darüber informieren, dass unser Unternehmen auf Grund der Sommerferien geschlossen werden, für den Zeitraum vom 04.08.18 bis 19.08.18. Falls Sie noch nicht erledigten Aufträge oder Sie wollen einen neuen Auftrag zu vergeben, die Sie bis zum 02.08.18 geliefert werden möchten, möchten wir Sie bitten, die BIOFIAL HYDRAULICS Produktion so schnell wie möglich zu kontaktieren, um alle zu machen die notwendigen Vorkehrungen. Vielen Dank für die Zusammenarbeit so weit! Wir wünschen Ihnen einen schönen und erholsamen Sommer! Her sene olduğu gibi yaz tatili nedeniyle firmamızın 04.08.18 ve 19.08.18 tarihleri arasında kapalı olacağını bildirmek isteriz. 02.08.18 tarihine kadar teslim edilmesini istediğiniz halen verilmiş veya vermek istediğiniz yeni siparişleriniz varsa, size daha iyi servis verebilmemiz için BİOFİAL HYDRAULICS imalat departmanı ile en kısa zamanda kontağa geçmenizi rica ederiz. Sizlere mutlu ve huzurlu bir yaz dileriz. Мы хотели бы сообщить Вам, что наша компания будет закрыта из-за летних каникул, на период с 04.08.18 до 19.08.18. В случае, если у вас есть какие-либо отложенные ордера или вы хотите разместить новый заказ, который вы хотели бы, чтобы быть доставлены до 02.08.18, мы хотели бы попросить вас связаться с отделом производства BIOFIAL HYDRAULICS как можно скорее для того, чтобы все необходимые меры. Благодарим Вас за сотрудничество до сих пор! Мы желаем вам счастливого и безмятежного лета! Desideriamo informarvi che la nostra azienda sarà chiusa per le vacanze estive, per il periodo dal 04.08.18 fino al 19.08.18. Nel caso in cui avete ordini in corso o se si desidera effettuare un nuovo ordine, che si vorrebbe essere consegnati fino 02.08.18, vorremmo chiedere di contattare il reparto di produzione BIOFIAL HYDRAULICS il più presto possibile al fine di rendere tutto le disposizioni necessarie. Grazie per la collaborazione finora! Vi auguriamo una felice estate e rilassante! we thank you very much for the good collaboration & trust so far. with a lot of personal happiness and business success! Although having entered the world market for over 20 years now, we always work in the internationalization of our brand by trying to constantly expand our borders and promote our products to every corner of the world. 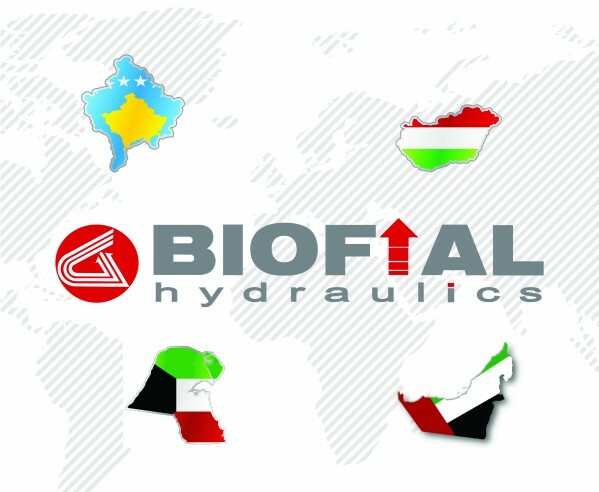 Thus we are happy to announce that in this semester BIOFIAL HYDRAULICS has successfully entered the markets of Lithuania, Peru and Qatar, supplying its quality hydraulic products directly to selected companies of the elevator industry. We believe that this is quite an achievement especially for our presence in South America, since such countries due to the distance, their special directives and the different business ethics, are not that easy to handle. Staying true to our commitments we will continue to grow our clientele and develop strong, advantageous, long-lasting cooperations around the globe. When standard products do not meet your requirements, BIOFIAL HYDRAULICS offers a variety of special developed products, so every customer can meet his needs! BIOFIAL HYDRAULICS knows that standard hydraulic products don’t always meet every customer’s, market’s or project’s needs in the international elevator industry. Hydraulic design and manufacturing is not a simple process. Very often, the ability to design and manufacture the exact product a customer needs, requires time and cost, that not many producers have the ability or the will to invest in order to satisfy the customers’ needs. This is the reason why very often, customers are being forced to choose from a range of standardized products that are already available. But as BIOFIAL HYDRAULICS has always been primarily a manufacturer of custom hydraulics products of high quality, this practically means that every standardized product offered can be modified, integrated and customized, so that we international customers will be offered tailor-made solutions, in most cases, in the premium cost that most manufacturers require for standardized products. With respect to the customer’s operating concept, our R & D department can offer several options of different component specifications, assemblies designed to specific mechanical or/and electrical needs, modifications of standard products, special packages, etc, so that all the special requirements will be met, while the compatibility with existing applications will be guaranteed and the development cost and time will be minimized. Also, BIOFIAL HYDRAULICS has all of the necessary testing facilities to aid in the development, design and manufacturing process, ensuring that everything produced has been tested to meet the requirements it was designed for. So, if you would like to have a specialized hydraulic product, part of a hydraulic elevator or a complete solution, you can contact us providing us with your exact requirements and we’ll be more than happy to work with you and meet your exact requirements. Feel free to challange our production abilities! Because … we DO hydraulics! A customized solution produced a few months ago is now installed in a public building in the United Arabic Emirates. 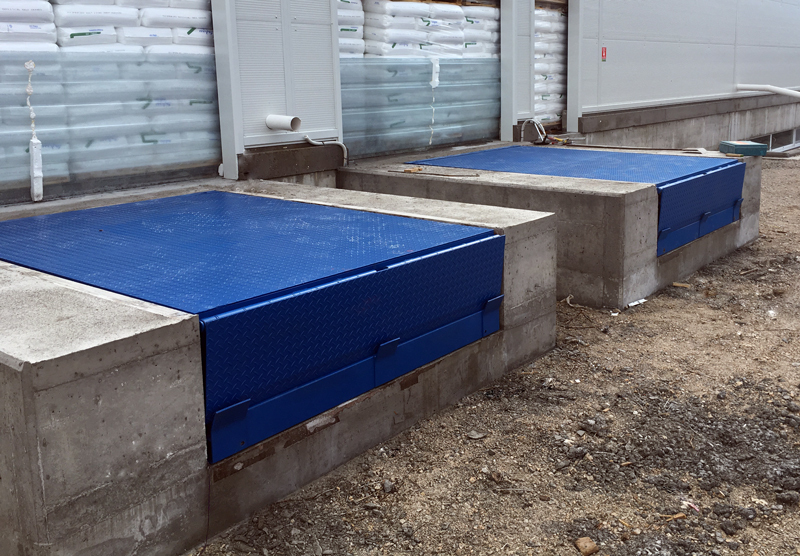 Since the power unit was placed in an open shaft, the customer requested besides the efficiency to take into account the esthetics of the installation. 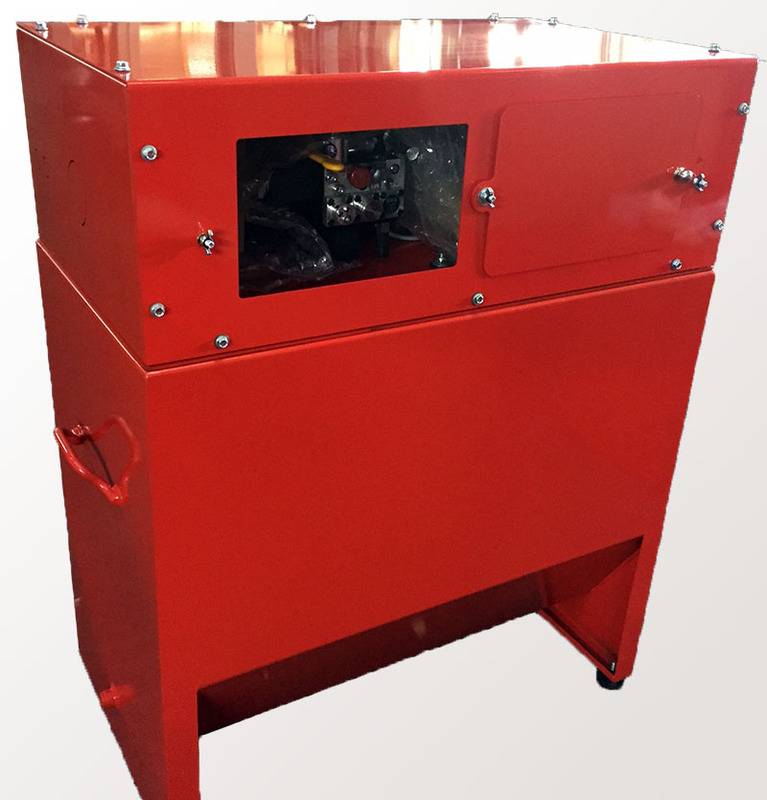 The result was highly satisfying for our client, as we were able to produce a power unit according to all the safety regulations, but also it could be placed in public display. A specialized project located in the U.S.A. market demanded to enclose the valve in a way that the maintenance would be easy. Auditors and maintenance personnel could easily have access to the control valve, but the public could not reach any of the core components of this ‘new generation’ power unit, that is inverter driven. It featured safety lock for this exact reason, making it able to be installed in an open space area. 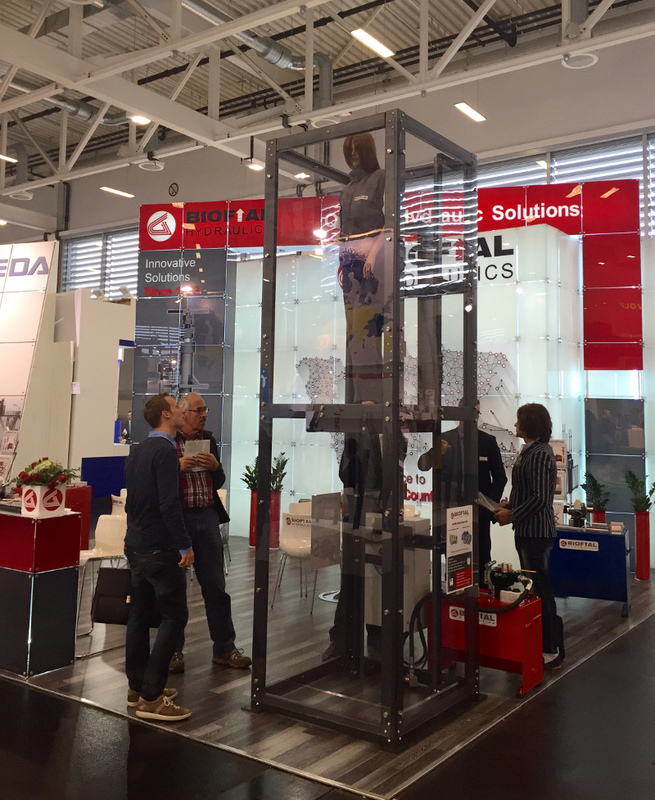 For one more time BIOFIAL HYRDAULICS participated in the most important international event of the global lift industry, the INTERLIFT 2017 International Elevator Exhibition that took place at 17th up to 20th of October in Augsburg, Germany. 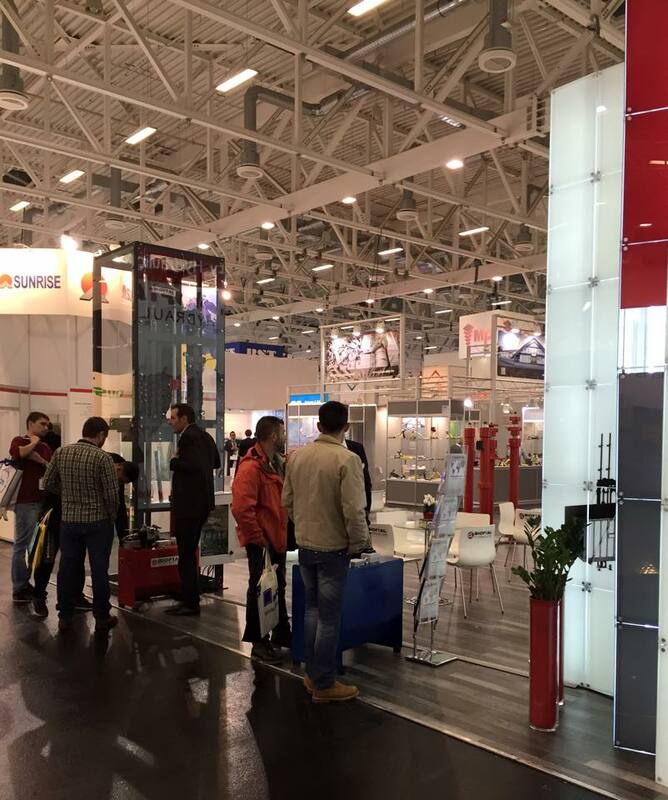 The exhibition was visited by more than 20.000 visitors and 550 exhibitors had the chance to demonstate their products. 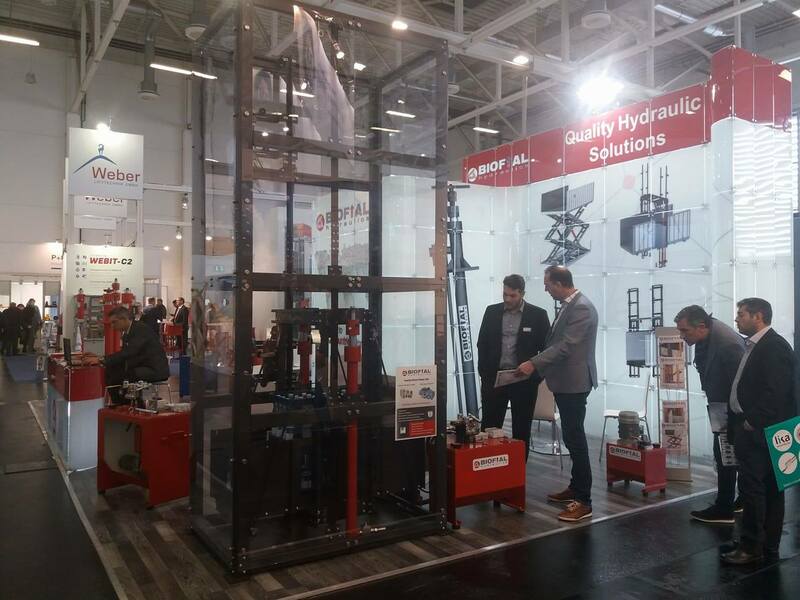 Our team presented the range of BIOFIAL HYDRAULICS’ premium quality hydraulic products of complete lifting solutions and parts, as well as its exceptional services, attracting the interest of numerous international visitors. We were pleased to meet with many of our existing worldwide cooperators -customers, suppliers, partners and friends-, and make new contacts with professionals from all over the world regarding new cooperations, new ideas and new projects. 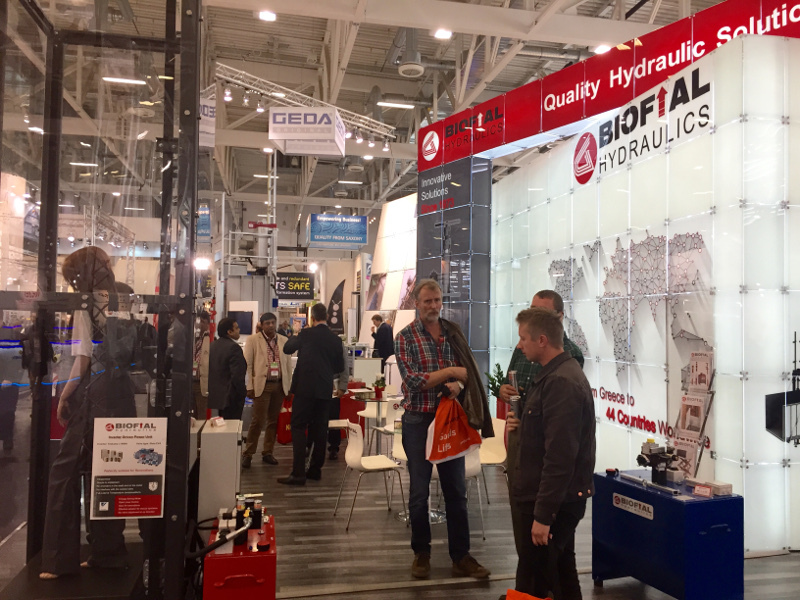 International visitors were impressed by the range of flexibility and the level of customization that BIOFIAL HYDRAULICS has the ability to provide, offering quality and competitive hydraulic solutions that fit to practically any project requirement. We renew our global appointment at INTERLIFT 2019 Exhibition, but we shall be in touch regarding our participation in other prestigious elevator events, as well as all our news and activities. We shall keep you updated – stay tuned on www.biofial.gr ! Having dedicated our efforts into manufacturing high quality hydraulic products offering our cooperators the highest customer relations and services sometimes might not be enough in order to build with our cooperators not only an efficient business relationship, but at the same time a safe and confident one. As we have been aware that there have been several malicious attempts to many companies that try to either infiltrate and steal information or confuse the clients into making deposits to false accounts, we feel the need to inform you that you may rest assured that here at BIOFIAL HYDRAULICS we take these issues seriously and apply all the necessary precautions in order to avoid such unwanted attempts. Our company practices all the latest computerization and data processing practices to protect the conversations and personal data from being intercepted. Our servers are being monitored 24/7 and we inspect each file as it arrives and run diagnostics every day. Our company will only communicate with you through our official email addresses under the domain of biofial.gr and never from a personal account. Our messages are mostly written within the same format and follow specific guidelines. The persons involved in every stage of our cooperation is known to you. So in case you receive a message that does not agree with both the above terms please forward it to us immediately and contact us in our official data or telephone number for confirmation. That way we can guarantee that both parties can be informed and our conversation will remain safe and confident. Another very busy but highly satisfying and rewarding day is almost coming to an end at the INTERLIFT 2017 exhibition. 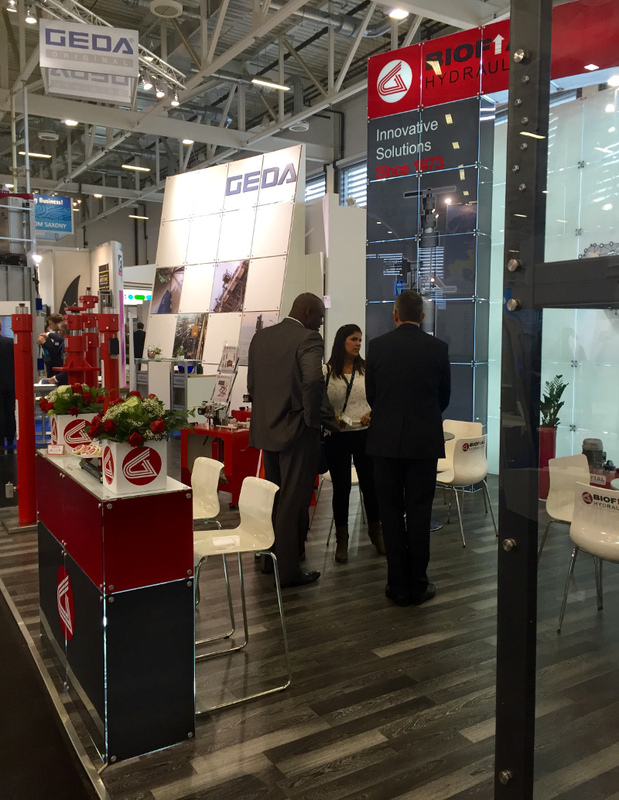 Today we had the pleasure to greet many of our existing clients and global cooperators who have honored us with their visit at our stand. Many of which we talk to everyday, but had not met them in person since our previous attendance at an international exhibition of this scale. 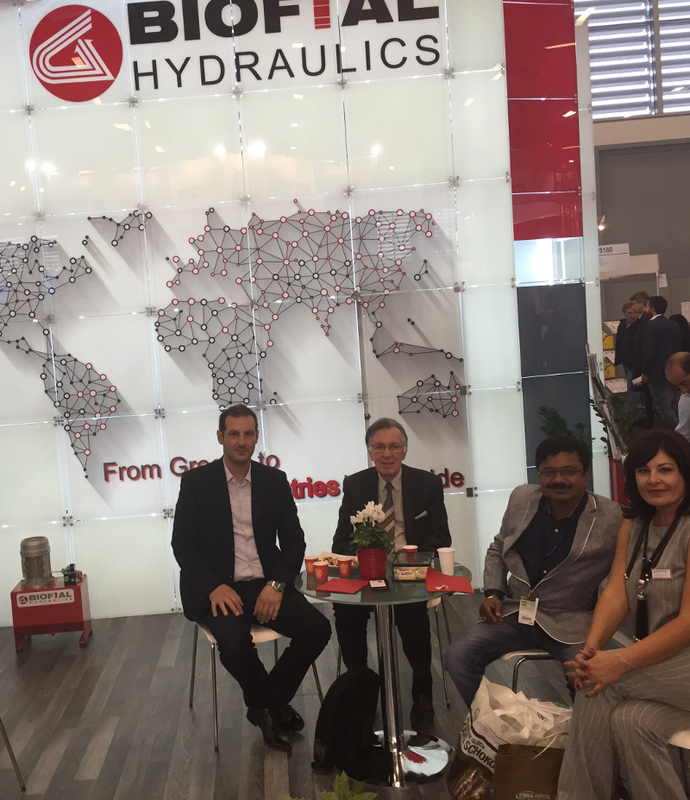 The day was full with meetings and will continuou to be for the remaining hours, mainly with interesting conversations about upcoming or existing projects and new developments in the field of hydraulics. 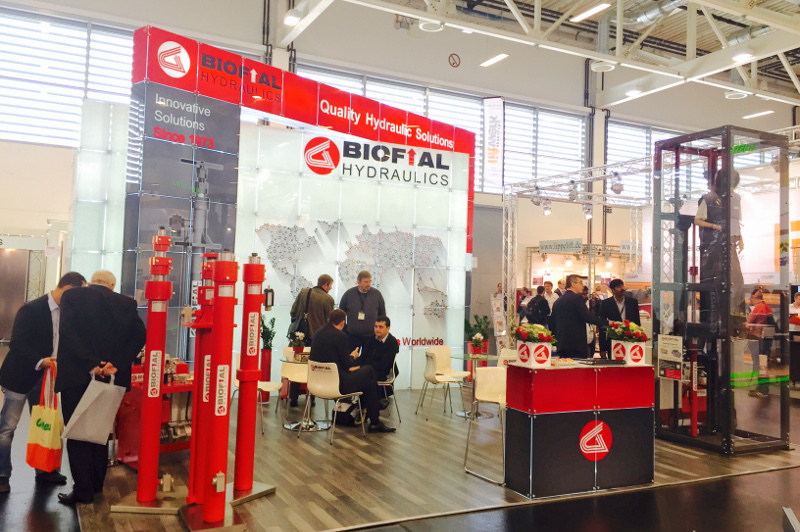 Have you had the chance to visit BIOFIAL HYDRAULICS stand this year at the INTERLIFT 2017 in Augsburg-Germany? 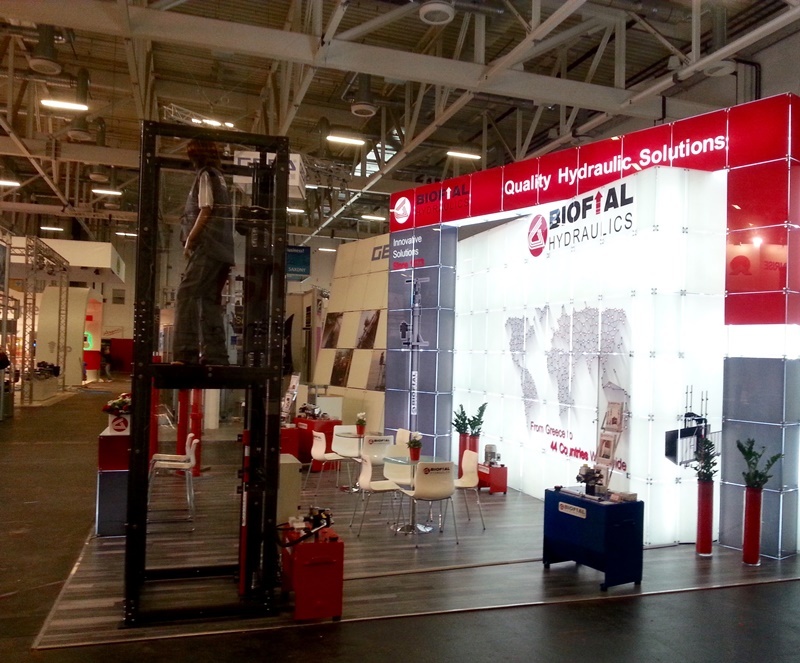 This year besides our distinctive hydraulic products, such as telescopic cylinders and power units, we are exhibiting a scaled hydraulic cargo platform, designed and manufactured by BIOFIAL HYDRAULICS which will be in constand operation during the fair. It operates with two telescopic cylinders and is also powered by a cutting edge inverter-driven power unit. 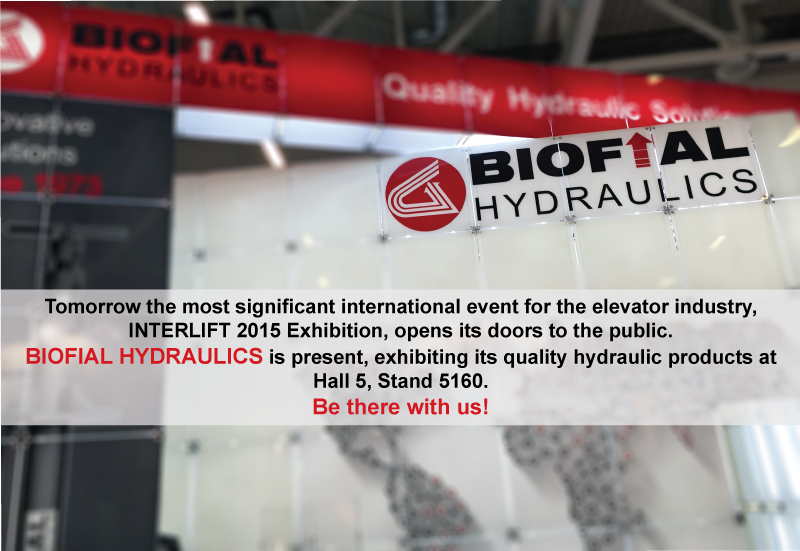 Join BIOFIAL HYDRAULICS at Interlift 2017, hall 5, stand 5030! Only a few days remain before the launch of the INTERLIFT 2017 International Exhibition in Augsburg – Germany. On the following Tuesday 17.10.17 everything will be set and ready in order to welcome all the international experts of the elevator industry. 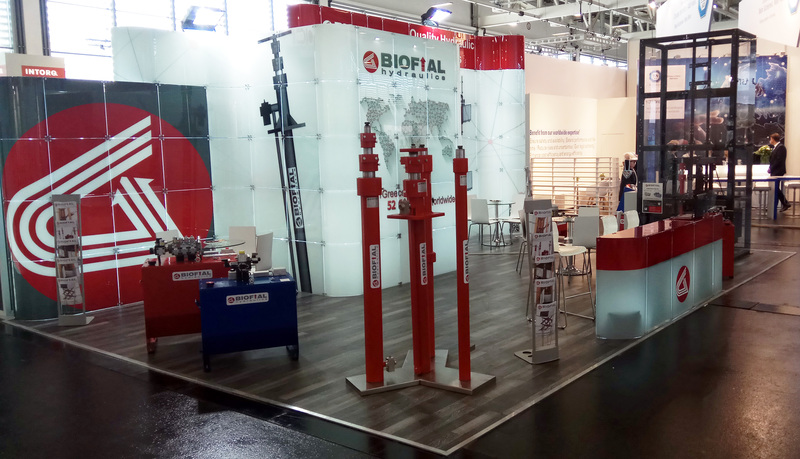 As we have mentioned in the past, BIOFIAL HYRAULICS team will be there at Hall 5 / Stand 5030 to welcome all of our international cooperators and showcase our premium quality hydraulic products exported in more than 50 countries worldwide and used in every possible lifting application. As every year, all of our representatives will be pleased to welcome any visitor at our stand and discuss the prospectus of building new cooperations and further develop the relations with current customers, suppliers, cooperators. Join INTERLIFT 2017, be there with BIOFIAL HYDRAULICS team! Stay tuned for more to follow…. 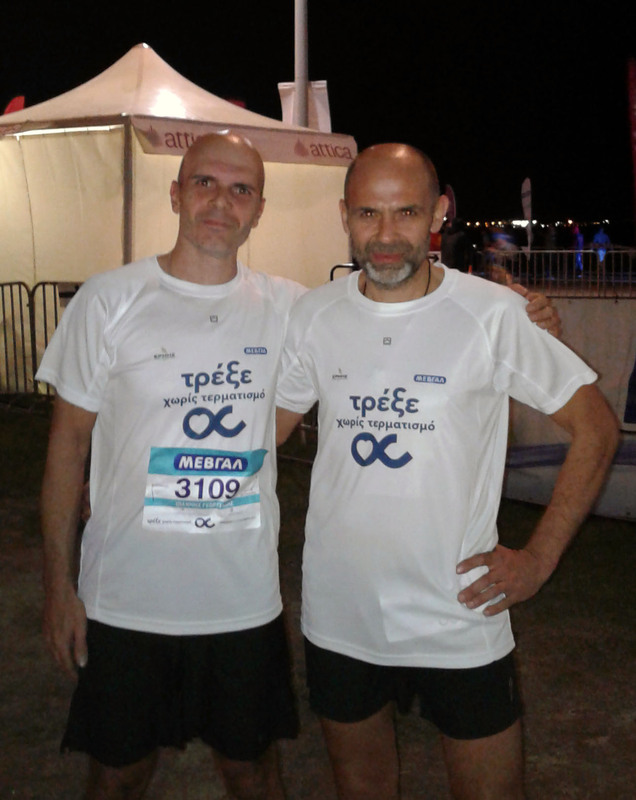 We fill proud to announce that we successfully participated in the 4th Marathon of Northern Greece “Run without Ending” 2017! 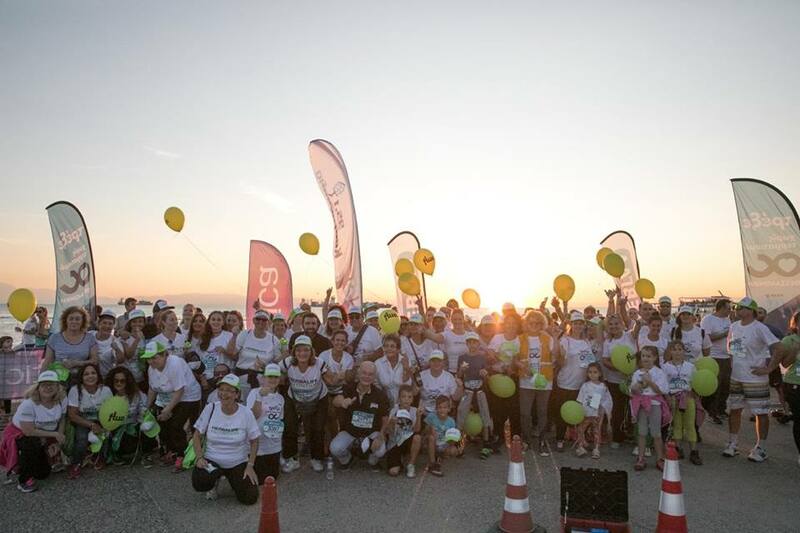 The race took place in the city of Thessaloniki and BIOFIAL HYDRULICS participated with a dynamic team of 25 people, comprised by members of our company, their families and friends. We ran 103 km in total which resulted in a donation for the charities that this event supported this year. 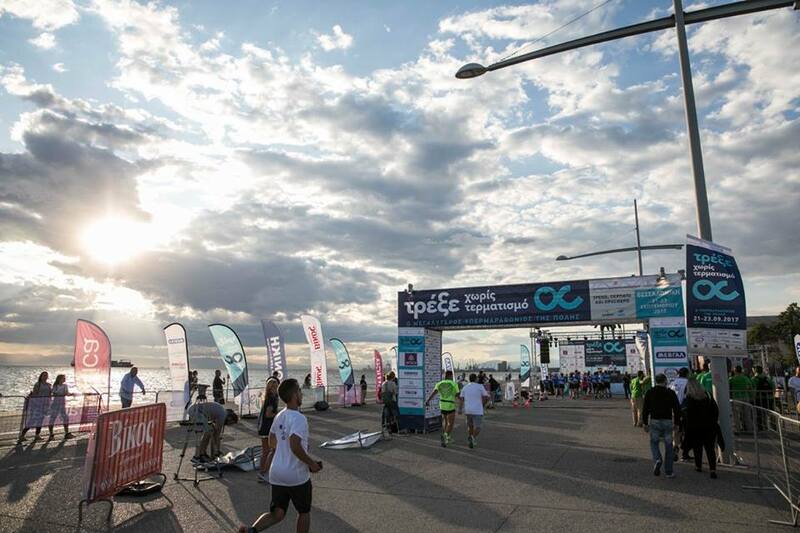 The athletic event “Run Without Ending” is a 50-hour race organized exclusively for charity, a race without time and mileage, whose mileage is converted into money (half a euro per kilometer) to support the work of children’s institutions and charity NGOs of the city, in this case. As we are an active supporter of the Association “Friends of Merimna Thessaloniki”, we were glad to participate in this event and assist the work of this foundation in every way that we can. Now are training for the next running in event that will be organized in our local community, so as to be even more fit and more socially active, ready to participate in such enjoyable and meaningful events…. 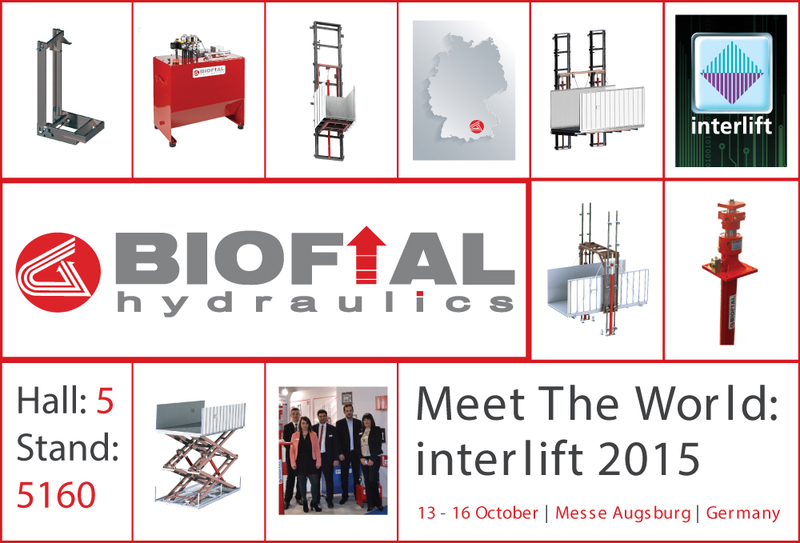 For the fifth consequent time BIOFIAL HYDRAULICS will be present in the most prestigious International Exhibition for the Elevator Industry, the INTERLIFT 2017, located at Augsburg – Germany. The exhibition will take place from Tuesday 17.10.17 up to Friday 20.10.17 at the Augsburg Trade Fair Centre and will be open each day from 09:00 to 18:00. 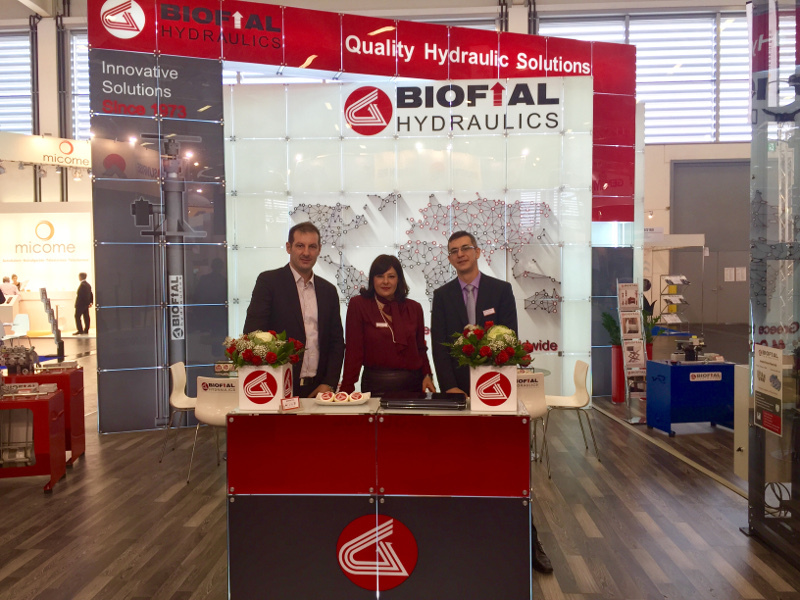 The team of BIOFIAL HYDRAULICS will be welcoming its international clients and cooperators, old and potential ones, as it always does. 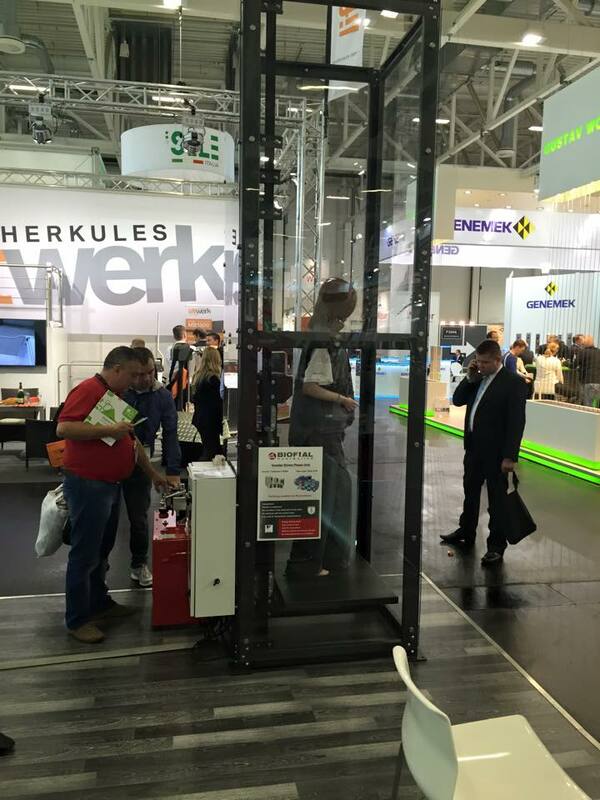 The world of Elevators, the global market of the sector, will be present in Augsburg. 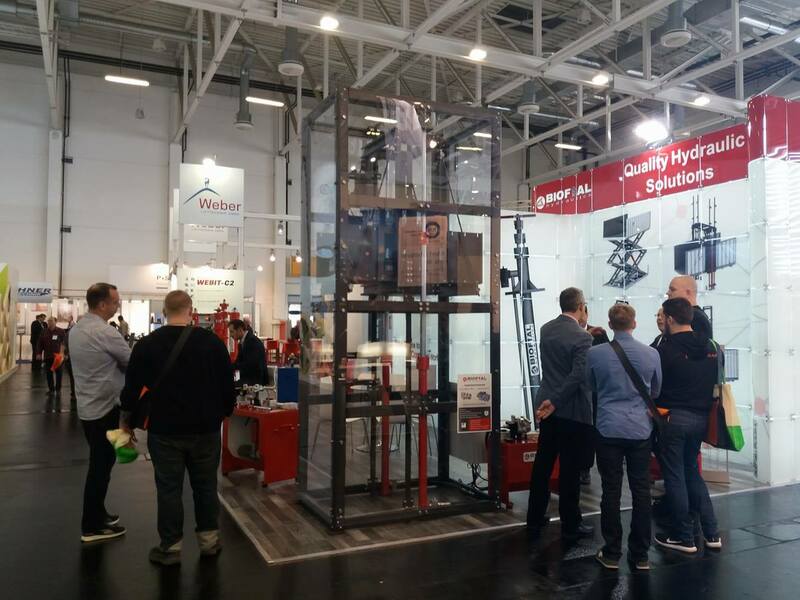 With more than 20.000 visitors from 100 countries and 55% of the visitors from countries outside Germany, Interlift is the place where the heart of the worldwide elevator market beats for these four days in the upcoming October. More than 550 exhibitors from more than 40 countries (70% of them from countries outside Germany) will be exhibiting the newest innovations and technologies of elevator industry in 43.000 m² exhibition space. 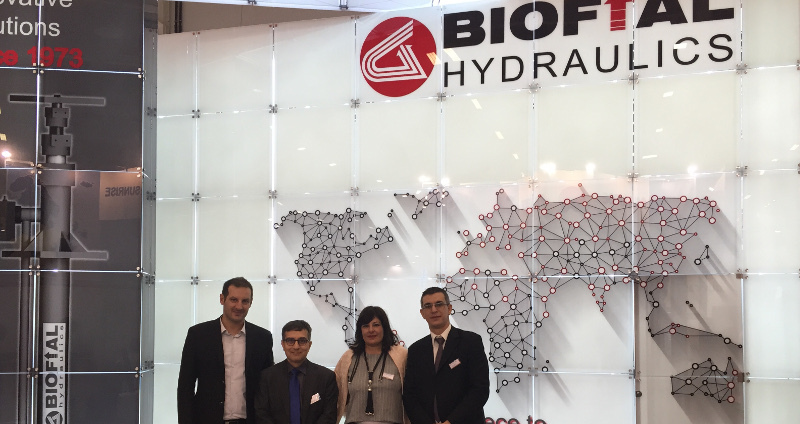 BIOFIAL HYDRAULICS cannot miss this great opportunity to meet with its international cooperators! 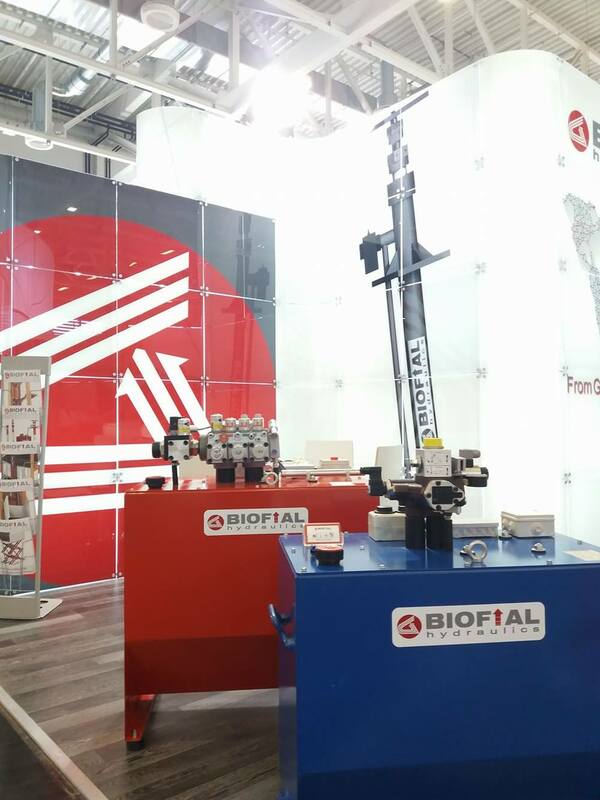 In case you wish to set an appointment in advance with our team or for any other help regarding your visit to 2017 INTERLIFT EXHIBITION, please do not hesitate to contact BIOFIAL HYDRAULICS. As we are always pleased to assist you, you can also follow this link and complete the online appointment registration form! 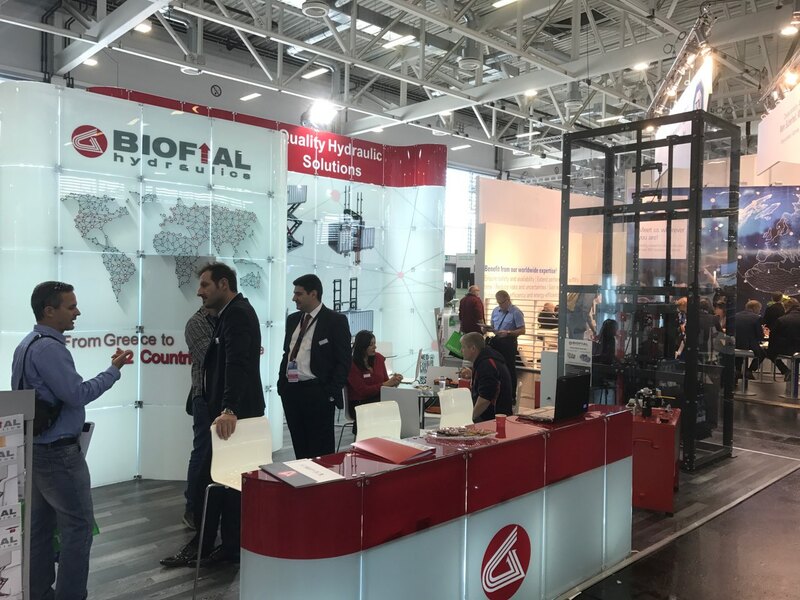 BIOFIAL HYRAULICS team will be there at Hall 5 / Stand 5030 to welcome all of our international cooperators and showcase our premium quality products. 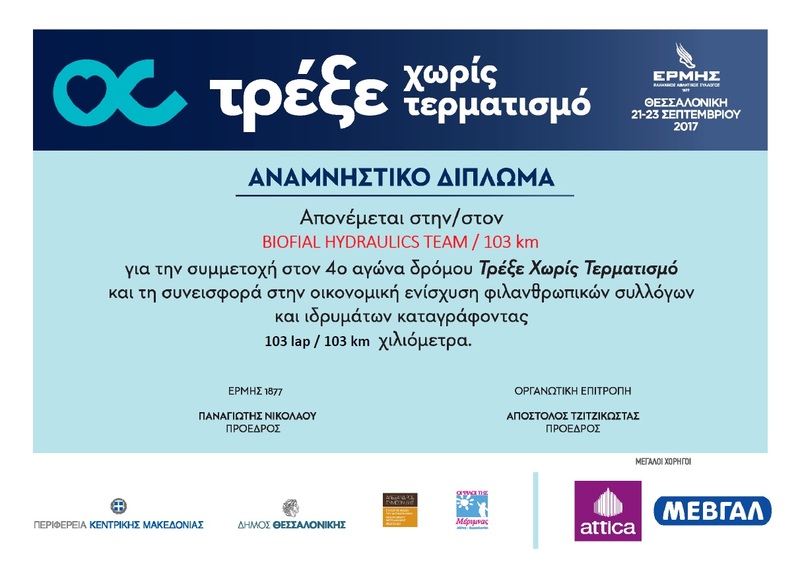 Given the value that we place in our company’s social responsibility and in order to enhance the charity work of our city, BIOFIAL HYDRAULICS team will participate in the 4th Marathon of Northern Greece “Run without Ending”. 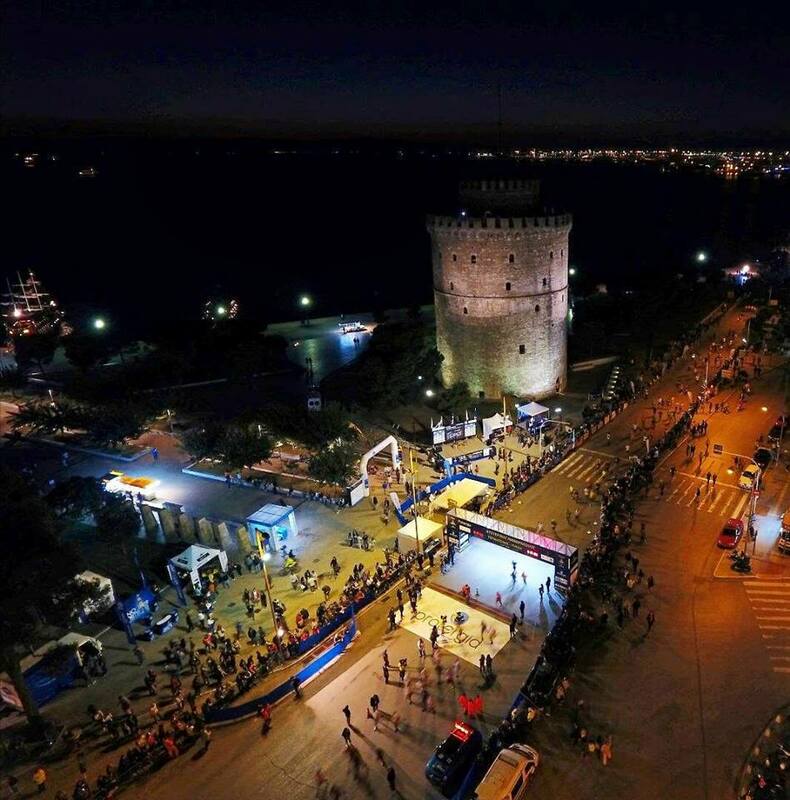 “Run Without Ending” is the first, largest and only supermarathon in Northern Greece, which is now a benchmark for the city of Thessaloniki, as this year is the 4th consecutive year that it is being organised in the weekend from September 21 to 23, 2017. 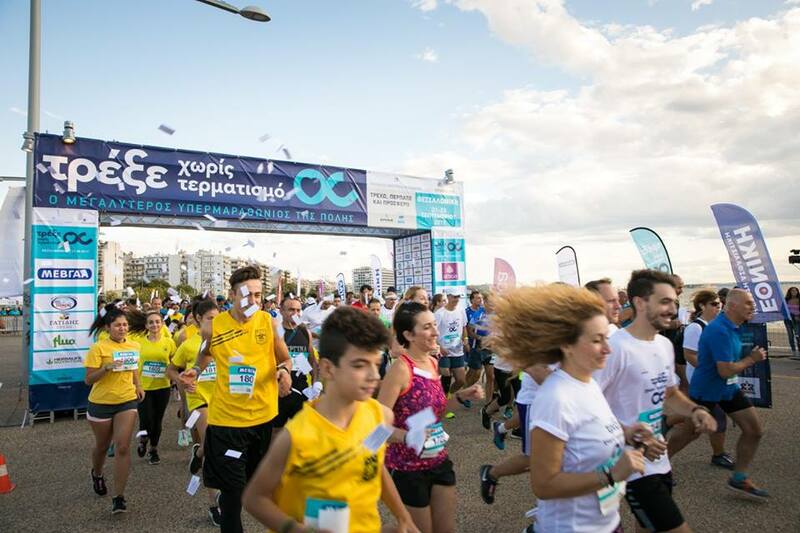 It is a 50-hour race exclusively for charity, a race without time and mileage, whose mileage is converted into money (half a euro per kilometer) to support the work of children’s institutions and charity NGOs of the city. BIOFIAL HYDRAULICS actively supporting in the recent years the work of the “Friends of Merimna Thessaloniki” Association, responded to this invitation / challenge and will participate with its team consisting of 25 people. We would like to inform you that, as we do every year, our company will be closed due to the summer holiday, for the period from 05.08.17 up to 20.08.17. 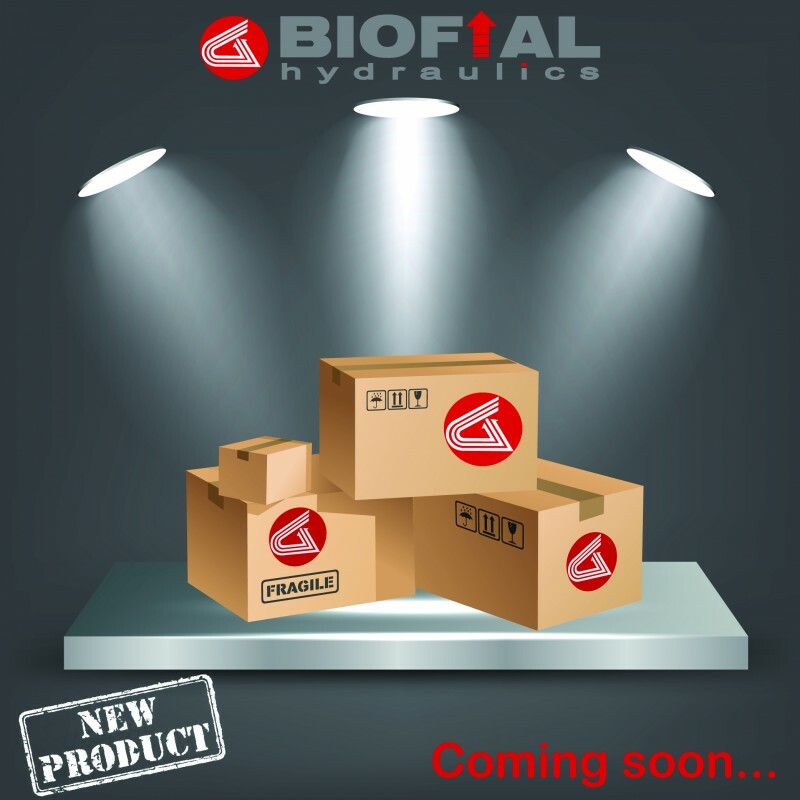 In case you have any pending orders or you wish to place a new order, which you would like to be delivered until 03.08.17, we are kindly asking you to contact the BIOFIAL HYDRAULICS production department as soon as possible, so as to have the necessary time to assist you. Wir möchten Sie darüber informieren, dass unser Unternehmen auf Grund der Sommerferien geschlossen werden, für den Zeitraum vom 05.08.17 bis 20.08.17. Falls Sie noch nicht erledigten Aufträge oder Sie wollen einen neuen Auftrag zu vergeben, die Sie bis zum 03.08.17 geliefert werden möchten, möchten wir Sie bitten, die BIOFIAL HYDRAULICS Produktion so schnell wie möglich zu kontaktieren, um alle zu machen die notwendigen Vorkehrungen. Her sene olduğu gibi yaz tatili nedeniyle firmamızın 05.08.17 ve 20.08.17 tarihleri arasında kapalı olacağını bildirmek isteriz. 03.08.17 tarihine kadar teslim edilmesini istediğiniz halen verilmiş veya vermek istediğiniz yeni siparişleriniz varsa, size daha iyi servis verebilmemiz için BİOFİAL HYDRAULICS imalat departmanı ile en kısa zamanda kontağa geçmenizi rica ederiz. Мы хотели бы сообщить Вам, что наша компания будет закрыта из-за летних каникул, на период с 05.08.17 до 20.08.17. В случае, если у вас есть какие-либо отложенные ордера или вы хотите разместить новый заказ, который вы хотели бы, чтобы быть доставлены до 03.08.17, мы хотели бы попросить вас связаться с отделом производства BIOFIAL HYDRAULICS как можно скорее для того, чтобы все необходимые меры. Desideriamo informarvi che la nostra azienda sarà chiusa per le vacanze estive, per il periodo dal 05.08.17 fino al 20.08.17. Nel caso in cui avete ordini in corso o se si desidera effettuare un nuovo ordine, che si vorrebbe essere consegnati fino 03.08.17, vorremmo chiedere di contattare il reparto di produzione BIOFIAL HYDRAULICS il più presto possibile al fine di rendere tutto le disposizioni necessarie. It is an honor for BIOFIAL HYDRAULICS to been asked to share its opinion and its experience in any professional media form that addresses to the global elevator community. In this occasion, Mrs. Fotini K. Hatziefstratiou (International Business Operations Coordinator & Financial Manager) on behalf of BIOFIAL HYDRAULICS, was questioned regarding the current economy situation of Greece and how this affects the business activity of BIOFIAL HYDRAULICS in the international elevator industry. In this interesting report on the Greek elevator market, BIOFIAL HYDRAULICS underlines the obstacles, the challenges, the practices and the perspectives related to the global market, as considered from the company’s point of view. 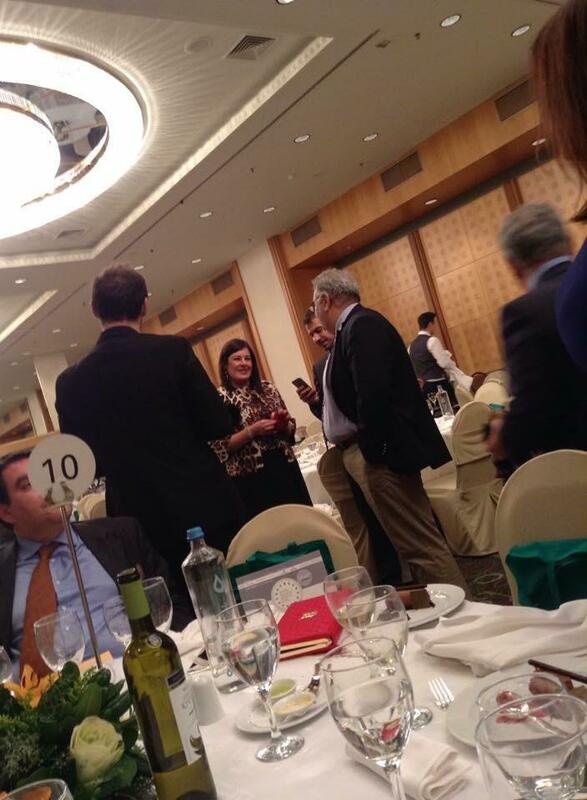 AyM: Greek economy is going through a very difficult situation. How has this affected the Greek elevators industry in general? B.H. : Indeed, the Greek economy is going through maybe the most challenging period of the past decades. As a result, the Greek lift industry, despite its strong international presence and its dynamics, could not be unaffected due to the fact that the Greek construction field has almost been “demolished”. The operation of elevator companies within the Greek territory is almost none existent and the obstacles that appear in the minimum activity that withstands, are too complicated to overcome them. But times change, bringing new conditions and creating different circumstances. In my opinion, the Greek lift industry must, and also can, withstand in this new era. AyM: And your company in particular? B.H. 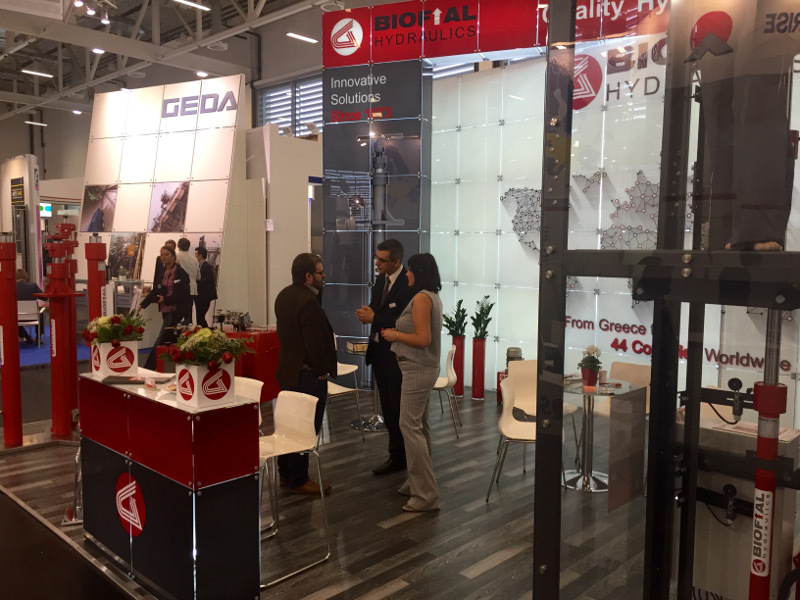 : It would be impossible for BIOFIAL HYDRAULICS not to be affected by all the negative outcomes that the Greek economic crisis imposes to any Greek company. But fortunately enough, in our occasion, the strategic of intensive export orientation & internalization we have applied, acts as a counterbalance to the various obstacles and allows the scale to balance out more evenly to any changes that are forced. The flexibility and the adaptive nature of our company allow the direct confrontation of any problems, with the most efficient means possible. The trust and loyalty of our old and new international customers, has been proven to be our most valuable asset in this difficult era. Also, the credibility and support that our international suppliers have shown to our company, has been equally important for our continuous and smooth operation. The result of the above factors has been the ongoing increase in BIOFIAL HYDRAULICS turnover, the continuous entry in new international markets and the steady uprising in our global clientele. New strategic cooperations with customers and suppliers on a global level have been formed the last years, stating that despite the unstable Greek economic environment, our company keeps marching ahead. AyM: Internalization seems to be the only possible opportunity for Greek elevators industries? What countries are the most important for the industry and why? B.H. 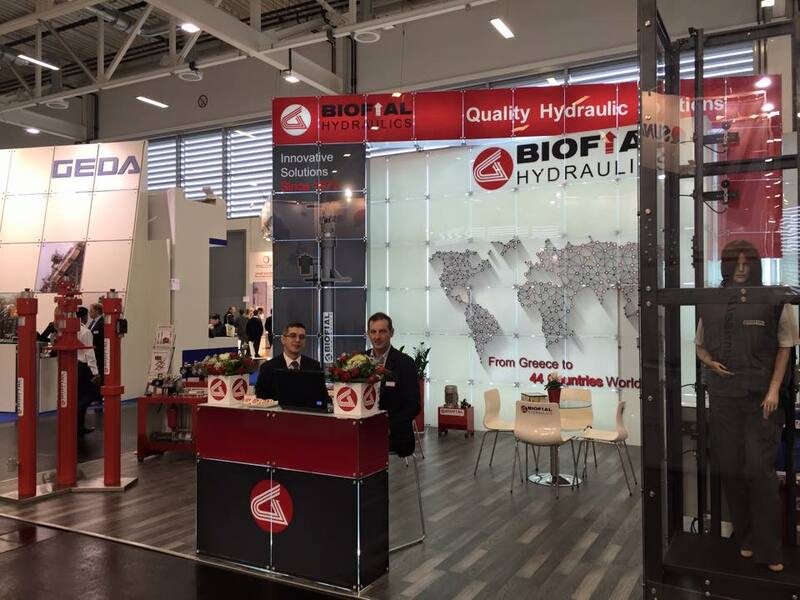 : For more than 2 decades the export experience of BIOFIAL HYDRAULICS clearly states that the extroversion is the only solution for the Greek elevator industries. The companies that have intensively reached for this goal and have made sufficient efforts to export their products in countries around the globe before the economic crisis appeared and continuing targeting in such actions, are the ones that can successfully withhold and face the devastating consequences of this crisis. Moreover, taking into account the political and economical evolutions that take place in a global scale, the dispersion in all the areas of the international elevator market is extremely important. For BIOFIAL HYDRAULICS that exports its products to 39 countries in the 5 continents, there is no comparison to more or less important markets. It needs no mentioning that markets that are going under development appear more appealing, but we consider that there is always potential in infiltrating and expanding further in many countries throughout the globe, since the majority of the Greek elevator industry, including BIOFIAL HYDRAULICS, manufactures premium quality products that are reliable and can stand with pretension even among the most demanding global markets. AyM: What are, in your opinion, the perspectives for Greek elevators industry at short medium term? B.H. : The Greek economy and of course the Greek elevator industry included, still have a long and rough way ahead. But in our opinion, this must be considered as a challenge and not as an obstruction. The companies that are equipped with dynamics, conscious internalization strategy, extraverted behavior and flexibility and at the same time are capable of producing supreme quality products, with advanced safety features and sufficient technical completeness, can have a positive gaze into the future. Therefore, the Greek elevator industry as a total, has to face a lot of obstacles and difficulties ahead that relate to the Greek unfavorable state, but has the means to overcome and preserve or even develop furthermore its significant presence in the European and the global market. AyM: Anything that you consider interesting for the elevators specialists Spanish readers. B.H. : BIOFIAL HYDRAULICS is known for its premium quality products and its capability to produce besides the standardized parts or complete hydraulic lift systems, custom made products according to the most demanding or specialized specifications of its international clientele. In this last year the company has been intensively involved in the Iberian peninsula. Also, it has an over a half decade of active presence in South America territory, in countries such as Argentina, Brazil, Mexico. 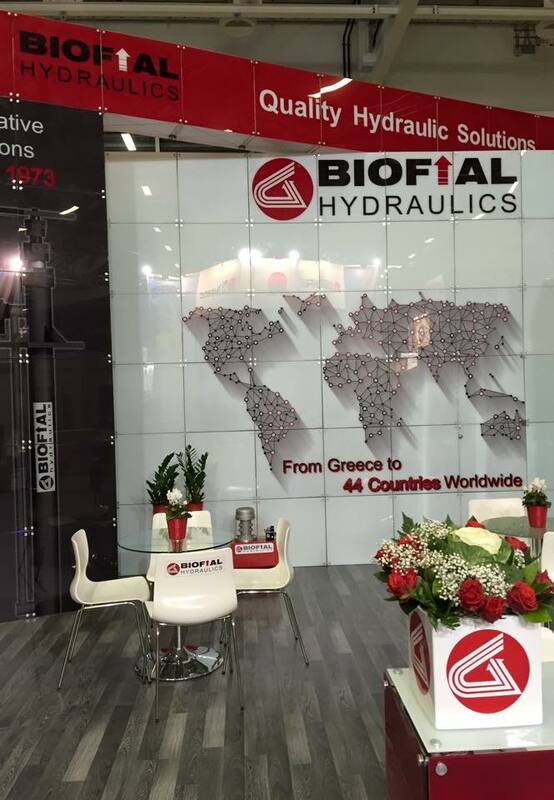 Finally we would like to mention that BIOFIAL HYDRAULICS has entered important new markets such as China and Russia and currently is consecrated in expanding in the USA market. Also in the following link you can visit the corresponding post on the “ASCENSORES y MONTACARGAS” Magazine official website. We would like to inform you that, as we do every year, our company will be closed due to the summer holiday, for the period from 06.08.16 up to 21.08.16. In case you have any pending orders or you wish to place a new order, which you would like to be delivered until 04.08.16, we are kindly asking you to contact the BIOFIAL HYDRAULICS production department as soon as possible, so as to have the necessary time to assist you. Wir möchten Sie darüber informieren, dass unser Unternehmen auf Grund der Sommerferien geschlossen werden, für den Zeitraum vom 06.08.16 bis 21.08.16. Falls Sie noch nicht erledigten Aufträge oder Sie wollen einen neuen Auftrag zu vergeben, die Sie bis zum 04.08.16 geliefert werden möchten, möchten wir Sie bitten, die BIOFIAL HYDRAULICS Produktion so schnell wie möglich zu kontaktieren, um alle zu machen die notwendigen Vorkehrungen. Her sene olduğu gibi yaz tatili nedeniyle firmamızın 06.08.16 ve 21.08.16 tarihleri arasında kapalı olacağını bildirmek isteriz. 04.08.16 tarihine kadar teslim edilmesini istediğiniz halen verilmiş veya vermek istediğiniz yeni siparişleriniz varsa, size daha iyi servis verebilmemiz için BİOFİAL HYDRAULICS imalat departmanı ile en kısa zamanda kontağa geçmenizi rica ederiz. Мы хотели бы сообщить Вам, что наша компания будет закрыта из-за летних каникул, на период с 06.08.16 до 21.08.16. В случае, если у вас есть какие-либо отложенные ордера или вы хотите разместить новый заказ, который вы хотели бы, чтобы быть доставлены до 04.08.16, мы хотели бы попросить вас связаться с отделом производства BIOFIAL HYDRAULICS как можно скорее для того, чтобы все необходимые меры. Desideriamo informarvi che la nostra azienda sarà chiusa per le vacanze estive, per il periodo dal 06.08.16 fino al 21.08.16. Nel caso in cui avete ordini in corso o se si desidera effettuare un nuovo ordine, che si vorrebbe essere consegnati fino 04.08.16, vorremmo chiedere di contattare il reparto di produzione BIOFIAL HYDRAULICS il più presto possibile al fine di rendere tutto le disposizioni necessarie. For the second subsiquant time KPMG Greece organizes the «2nd Family Business Forum», the only convensionin Greece which debates exclusively issues that concern Family Businesses. The forum will take place on Tuesday the 12th of April 2016 at the Divani Caravel hotel in Athens and is directed to entrepreneurs, owners, shareholders and members of the board and managers of family businesses. BIOFIAL S.A. will be represented to this significant convention by Mrs. Fotini K. Hatziefstratiou, Chief Financial Officer and Head of Exports, as a distinguished speaker. The speakers will analyze the important issues and trends for family businesses in the European and Greek markets, like Governance, Succession Planning Next Generation, Growth, Assurance και Exit Strategies. Mrs. Hatziefstratiou will actively participate in one of the two debate panels of the convension entitled “Coaching the young” which will be centered at the topic of succession in family businesses, requesting from the participant entrepreneurs to provide answers to polls which will take place at that time and address critical issues in the succession process. The Forum will feature keynote speakers, case studies, and speaker panels formed by prominent entrepreneurs and owners of large Greek family Businesses. 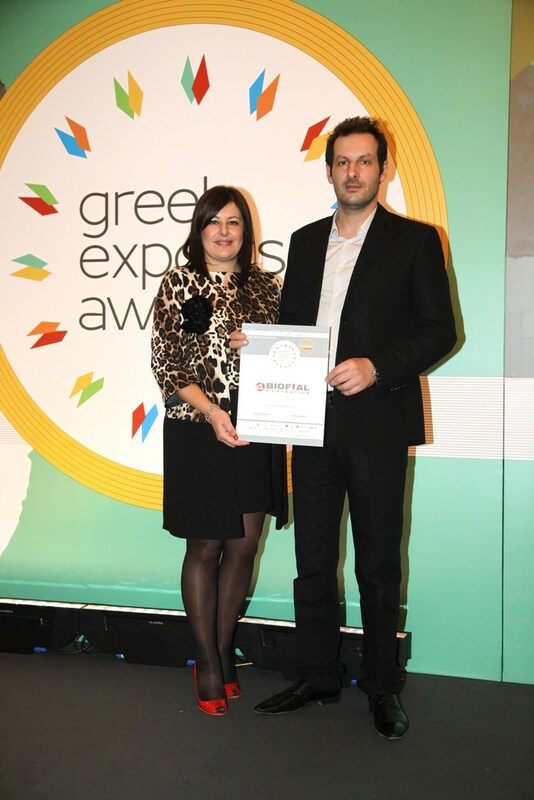 Alexandros Christodoulou, Sales Director, CHB Group. Furthermore, the conveners will be presented the findings of a pan European research on family businesses “Family Business Barometer 2016” as well as the findings of a new worldwide research “Global Tax Monitor” on Family Business tax issues. The panel of speakers will include the Alexis du Roy CEO, the Family Business Network International (FBN) – counting more than 9,100 individual members from over 3,000 family businesses across 58 countries and Dr. Rania Labaki, Professor of of Finance and Family Business at EDHEC Business School, Researcher and Academic Expert of NxG. Download here the forum’s agenda as well as the participation form. 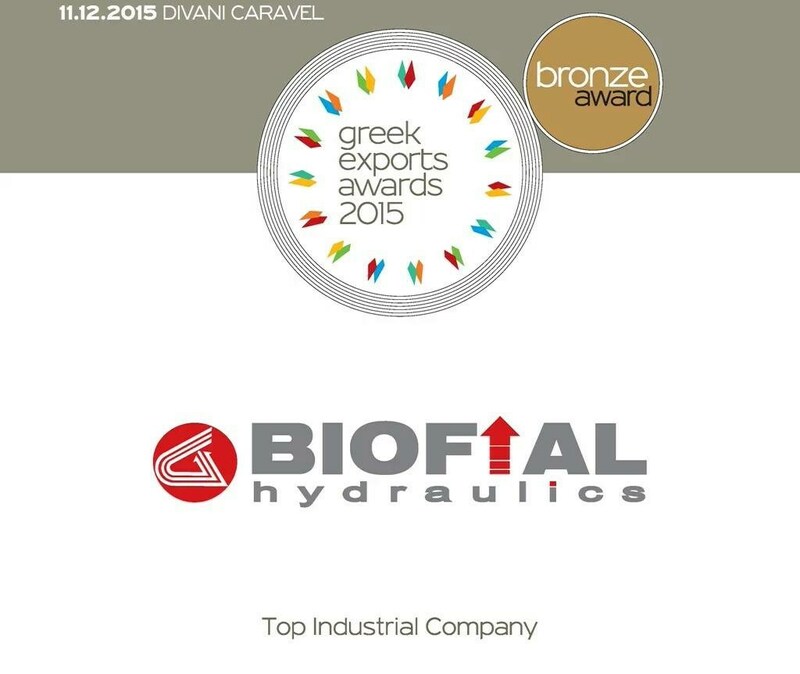 The Hydraulic Lift System Industry BIOFIAL HYDRAULICS was awarded with the Bronze award in the category of “Top Industrial Company” in this year’s Greek Export Awards 2015 for its performance in developing intense extrovert entrepreneurship. 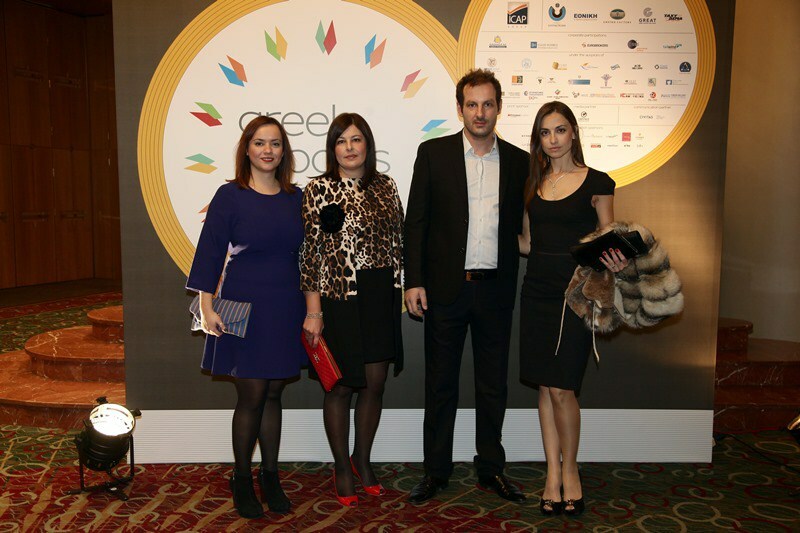 The nomination ceremony of the Greek Export Awards 2015, which were held for the 4th sequent year by the Union of Diplomatic Finance & Commercial Affairs Officers (ENDY OEY) of the Greek Ministry of Foreign Affairs and the publishing and conference organization Ethos Events, took place at Friday the 11th of December at the Divani Caravel Hotel in Athens, with significant distinctions among the largest Greek export companies, that basically support the Greek Economy. 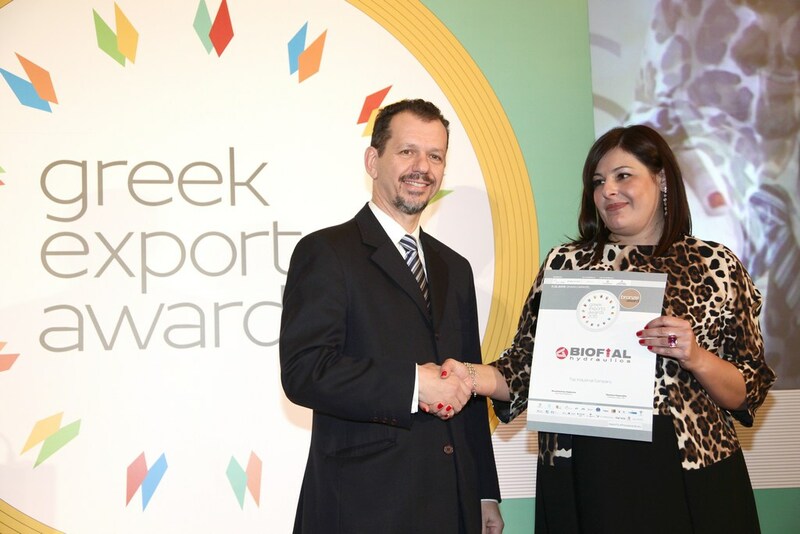 The award was received by the C.F.O and Business Operations Coordinator της BIOFIAL HYDRAULICS, Mrs. Fotini K. Hatziefstratiou, who stated: “This award stands as an act of moral vindicating for the people of BIOFIAL HYDRAULICS and therefore is dedicated to those who are a part of this flexible, effective and bonded team. 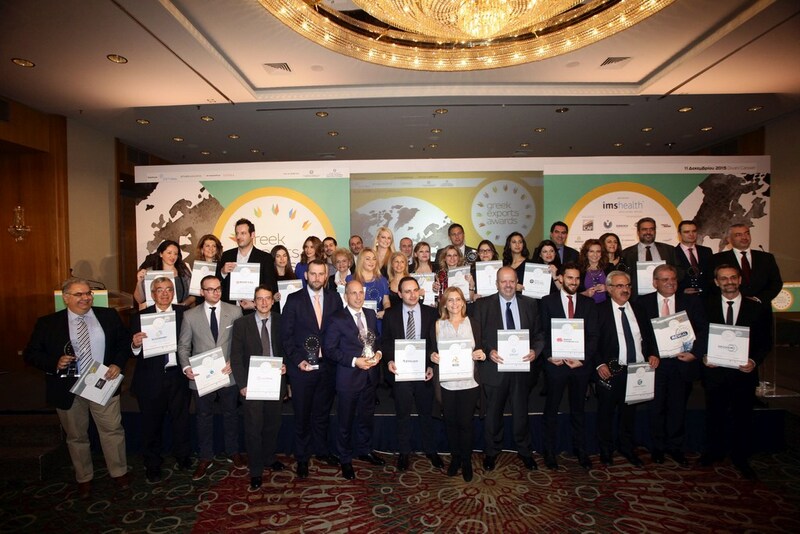 The administration representatives of the second generation of the company would like to point out, that this award first and foremost belongs to the founder of BIOFIAL HYDRAULICS, Mr. Hatziefstratiou A. Konstantinos. The Greek companies have to stand against multinational companies of uneven proportions that are founded in countries with stable economy and have a reputation in industrial production, which makes the competition extremely difficult. Also, they have to face another and even stronger obstacle: to compete and overcome their own image, the bad reputation that constantly follows our country in these past years. 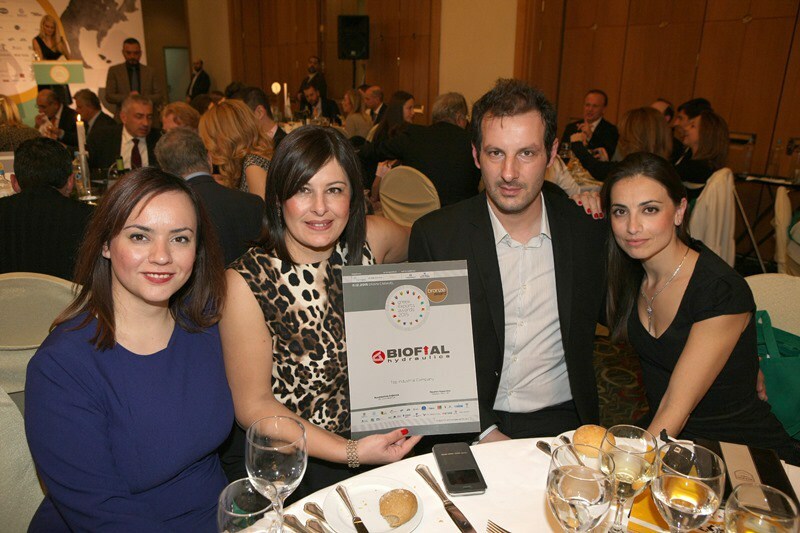 Despite all of the above, the BIOFIAL HYDRAULICS team is bond to continue their efforts, overcome these adversities and prove that the positive attitude of the Greek business and the Greek entrepreneur can subvert the negativity and project the most positive aspects of the Greek economy: Premium Greek products, business ethics and dignity”. 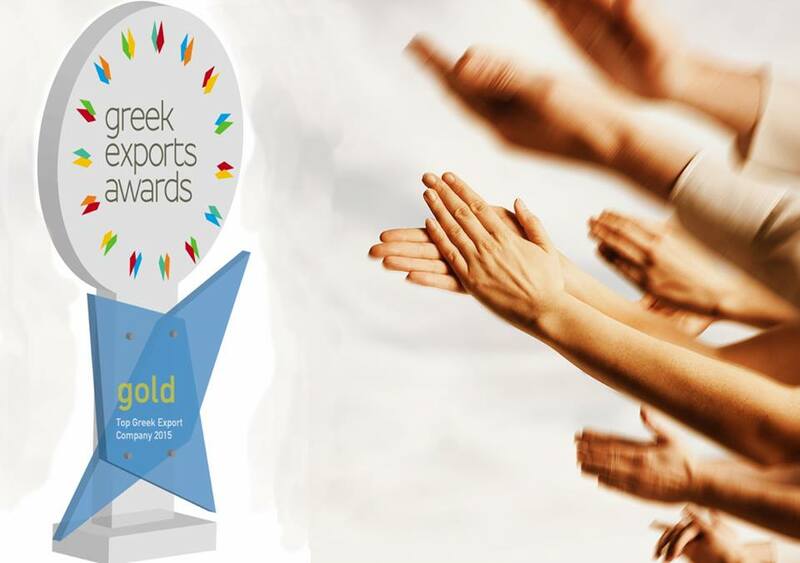 H purpose for organizing the Greek Export Awards 2015 is the reward of excellence in the export division of the in domestic business community. 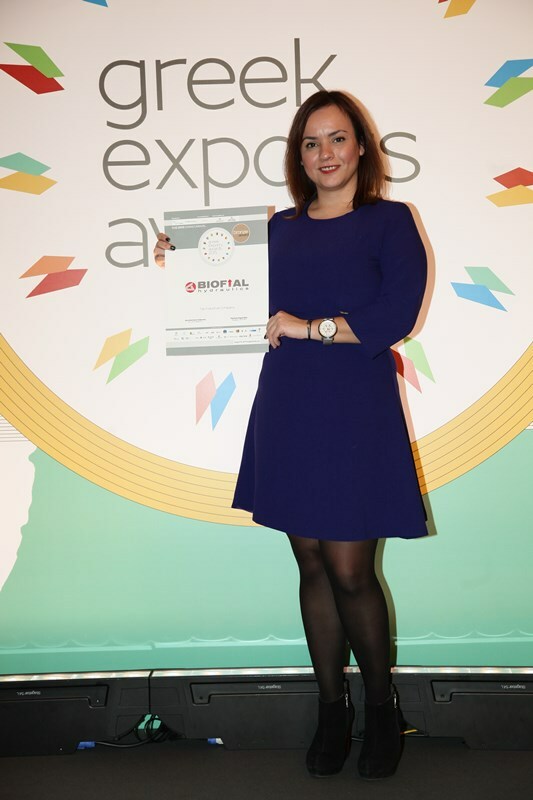 Therefore the award that BIOFIAL HYDRAULICS was nominated and won, justifies the strategic decision to invest in the extrovert activity of the company. It is worth mentioning that the company, which started its operation more than four decades ago and is established in Thessaloniki, today manufactures and distributes its premium quality and innovative hydraulic products at 44 countries worldwide, at five continents, from N. Zealand to India and from Brazil to China. The award ceremony, which held speeches by the Secretary-General of the ministry of Economy Mr. Ilias Ksanthakos, the Emeritus Professor of the National Technical University of Athens Mr. Theodosios Tasios. Mr. Tsanetos Karantsis President of the Union of Diplomatic Finance & Commercial Affairs Officers (ENDY OEY) and Mr. Konstantinos Ouzounis CEO of Ethos Media, the ceremony was presented by the reporter of SKAI channel Ms. Anna Bousdoukou and was attended by more than 400 executives of the Greek industry. This press release was republished by the Greek blogs Thessbomb & Mywaypress. 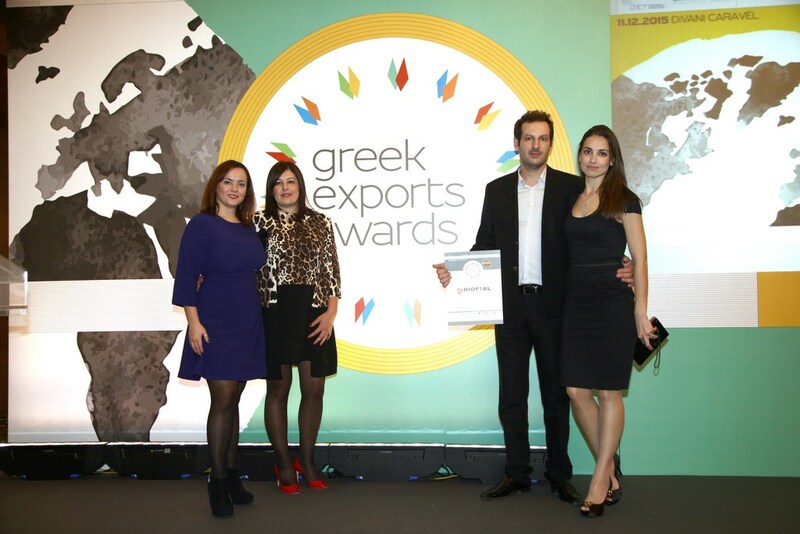 We are proud to announce that BIOFIAL HYDRAULICS is this year candidate in the most prestigious awards for the Greek export activity, the “Greek Export Awards 2015”, at the category Top Industrial Export Company, held for the 4th sequent year by the Union of Diplomatic Finance & Commercial Affairs Officers (ENDY OEY) of the Greek Ministry of Foreign Affairs and the publishing and conference organization Ethos Events. 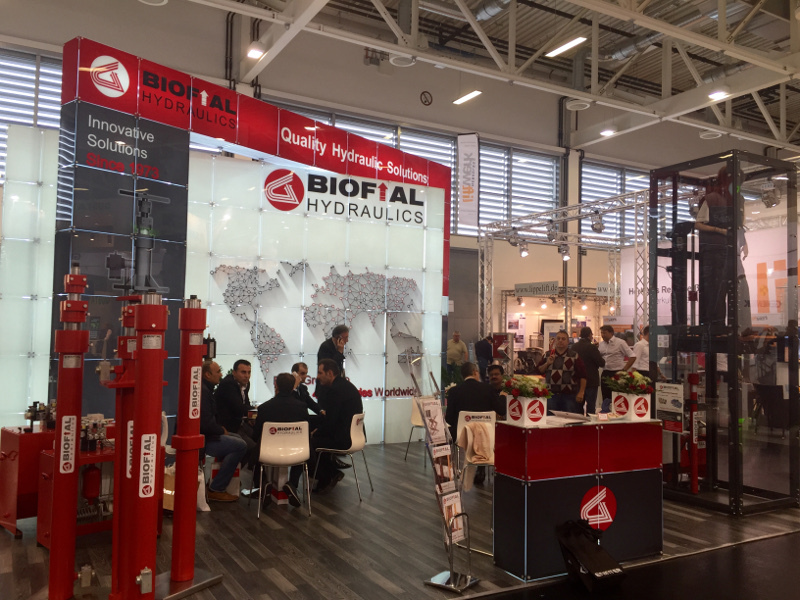 After a successful 25 year presence in the international markets and having significant activity in more than 44 countries worldwide, the participation alone, but also the possibility of a distinction, is the best moral reward for the BIOFIAL HYDRAULICS team. 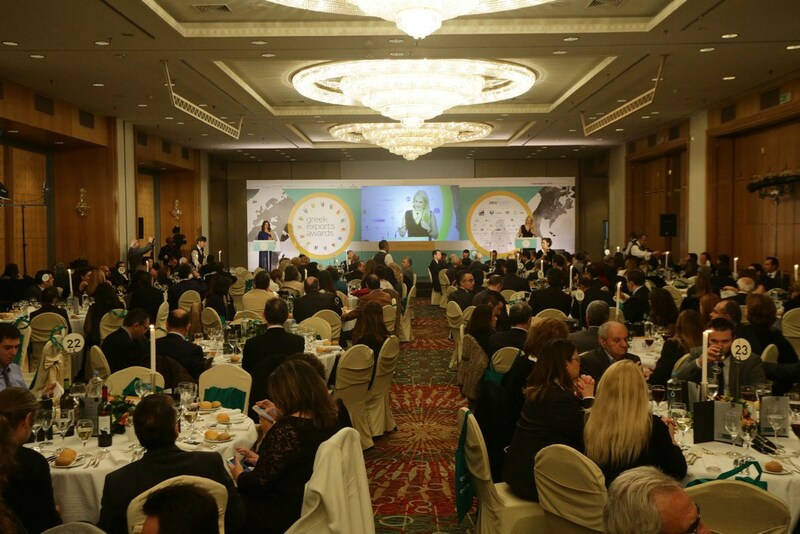 The award ceremony and the announcement of the results will be held at the 11th of December 2015 at the Divani Caravel Hotel located in Athens, in the presence of the most influential representatives of the economical and commercial background of the country. The BIOFIAL HYDRAULICS team will be present, participating in an institution that rewards the uprising business activity, its people, their ideas and the collaborations among the top exporting companies of Greece, but also supporting its own participation for a distinction. Stay tuned for more to come…. 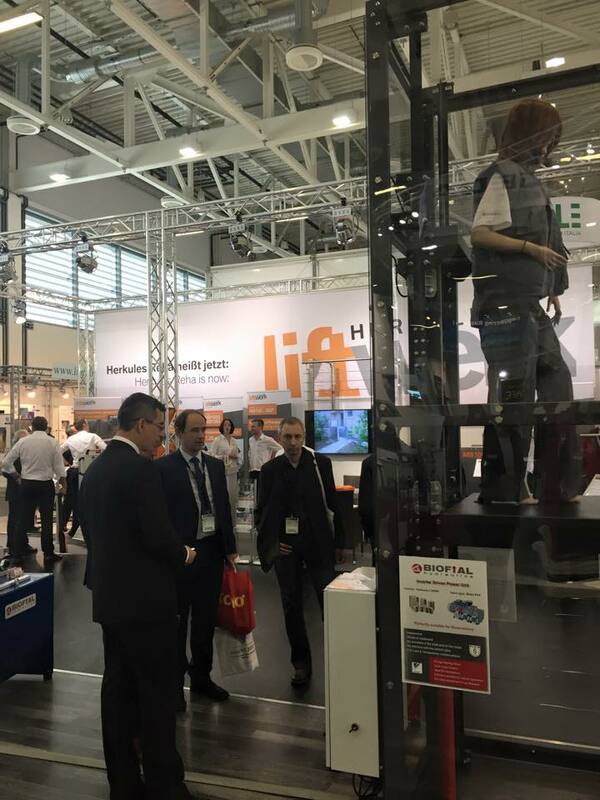 For the third subsequent time BIOFIAL HYRDAULICS has participated in the most important international event of the global lift industry, the INTERLIFT 2015 International Elevator Exhibition that took place at 13th up to 16th of October in Augsburg, Germany! A participation that was completely successful and in harmony with what our company presents. 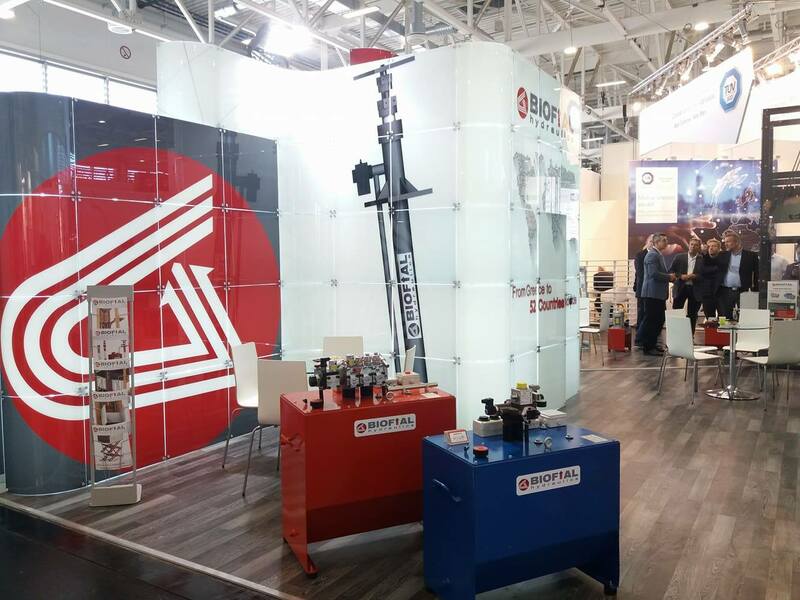 Our team presented the total range of BIOFIAL HYDRAULICS’ premium quality hydraulic products and complete lifting solutions, attracting the interest of numerous international visitors and gaining lot of positive feedback. Applying the most innovative technologies that reduce energy consumption and significantly increase efficiency of elevators, visitors had the chance to see a scaled down BIOFIAL HYDRAULIC elevator, with a two-staged telescopic cylinder, an inverter-driven power unit and a miniature car frame in real operation. Too many international visitors, too many business appointments, too many hours of interesting discussions, too many new ideas and plans in our agenda. Once again the exhibition was an experience we enjoyed, as it gave us the opportunity to meet with our long term cooperators and further develop our business relations with representatives from companies all around the world. 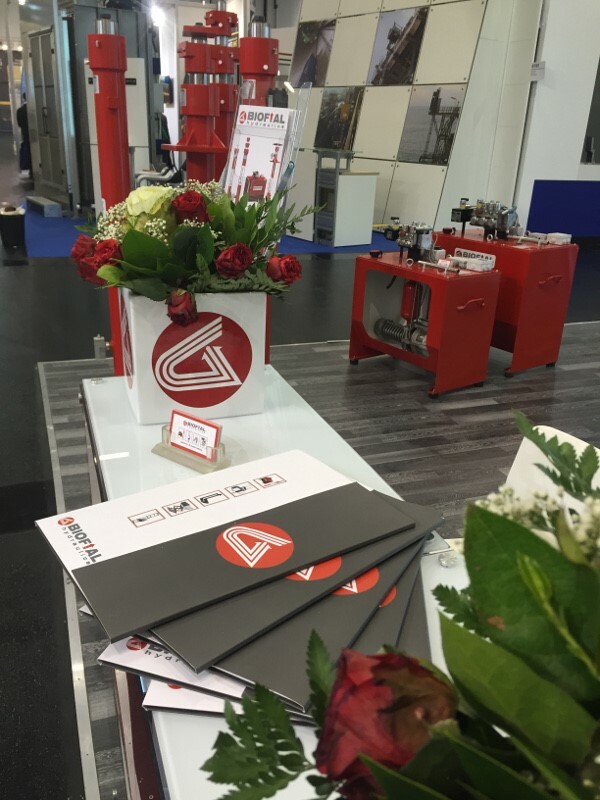 We would like to thank each and every one who has visited us in INTERLIFT 2015! 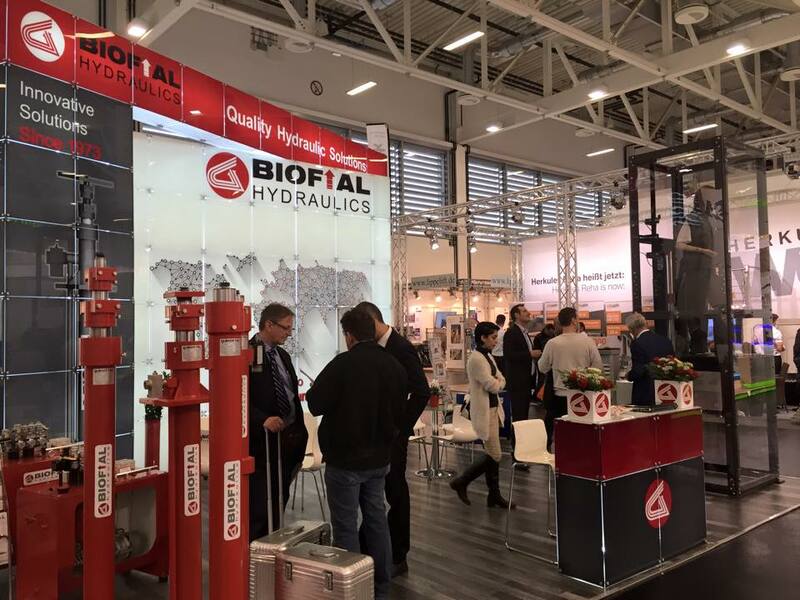 We thank all our worldwide partners, the existing and the potential ones, customers or suppliers that honored us with their presence again this year, as the personal and direct communication is always a top priority for BIOFIAL HYDRAULICS. We also thank you for all the positive feedback, for all the ongoing support, for sharing with us your ideas and for the commitment and trust on what we do! 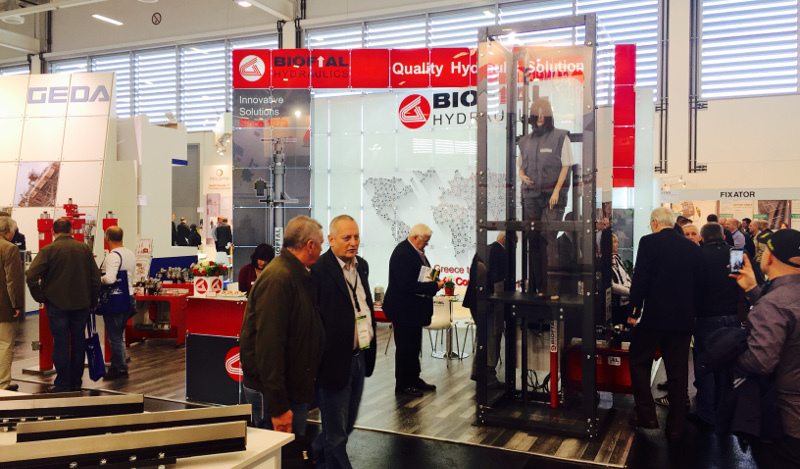 We renew our global appointment to INTERLIFT 2017 Exhibition, but hope to see you sooner at the next big international elevator event that BIOFIAL HYDRAULICS will attend. We shall keep you updated – stay tuned on www.biofial.gr ! 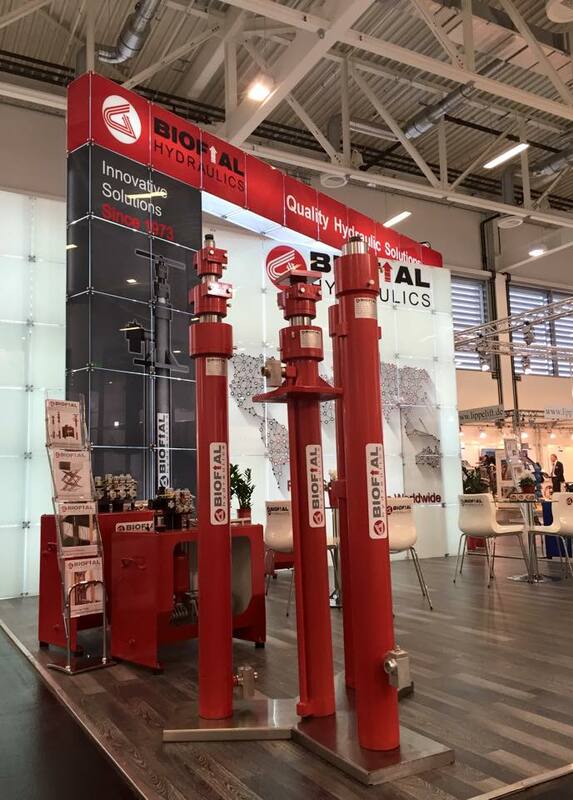 As reaching higher expectations is BIOFIAL HYDRAULICS’ challenge, we are always in your disposal to provide you with the most qualitative hydraulic lifting solutions, along with the most prompt and friendly assistance. This press release was republished by the Greek blogs Thessbomb, Mywaypress & Ελεύθερη Ζώνη. 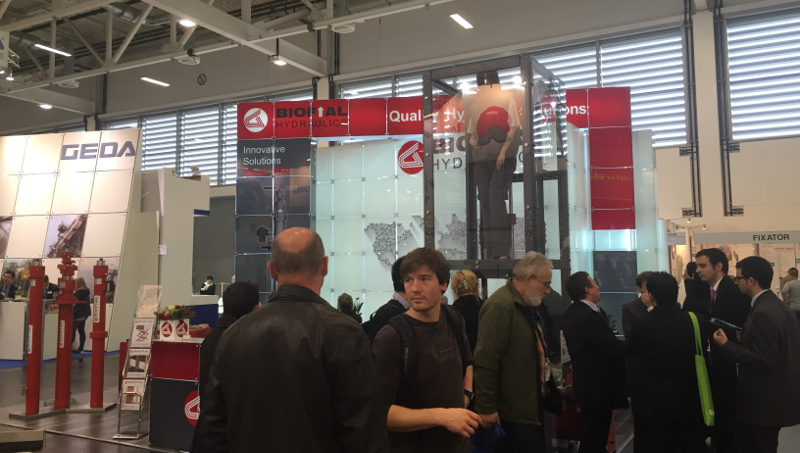 The third day of the INTERLIFT 2015 international exhibition was very busy for BIOFIAL HYDRAULICS! Too many appointments, too many visitors, too many hours of interesting discussions. 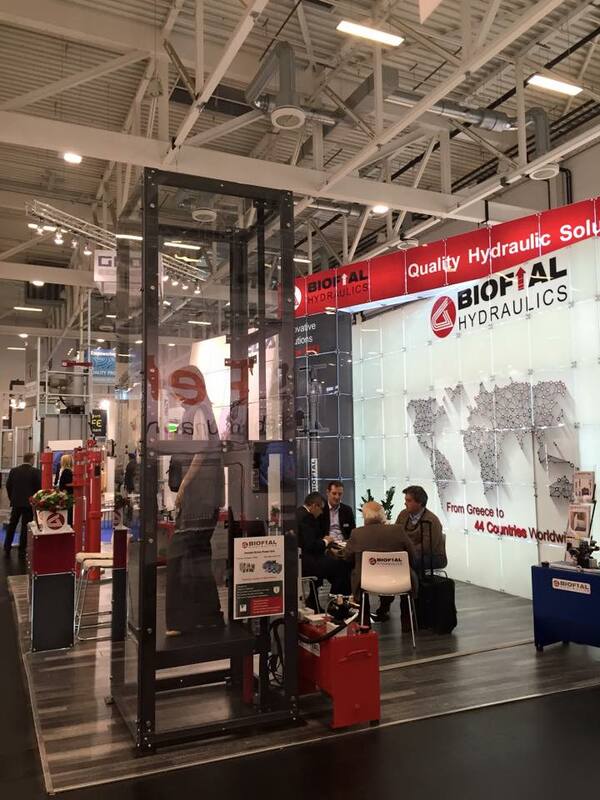 Honored by the trust of our existing customers, satisfied by the intense interest shown by the new business contacts and pleased by the positive feedback received, with new ideas and new plans in its agenda, BIOFIAL HYDRAULICS team will also be in your disposal today, the last day of INTERLIFT 2015 International Elevator Exhibition, at Hall 5 – Stand 5160! Are you ready for the last day? 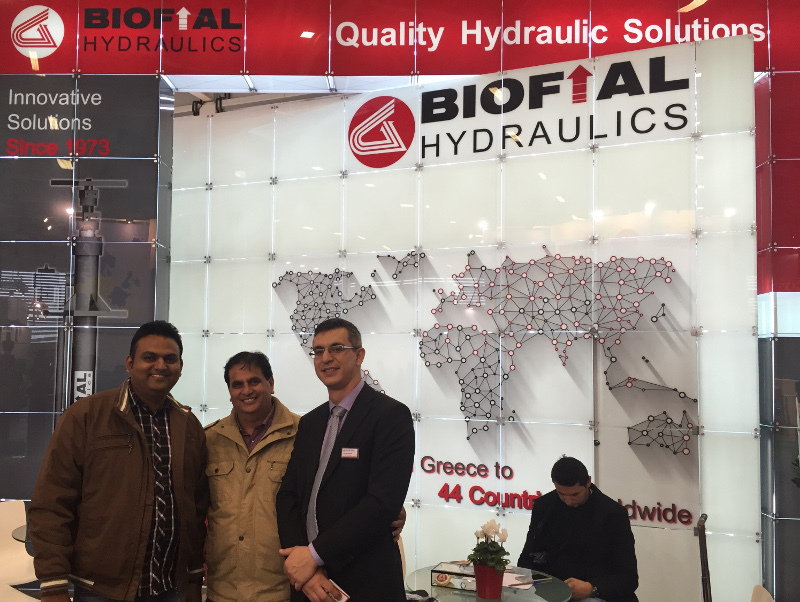 BIOFIAL HYDRAULICS team is certainly is…. We would like to thank our international clients and cooperators for honoring us with their presence in our stand, as this year the turnout has excided our expectations. Also this has been a perfect opportunity to contact in person with business acquaintances that we have had and find ways to further develop our cooperation. Having met with people throughout the globe that are familiar with our products gives us gratification and makes us reach even further to bigger and more demanding products and projects. 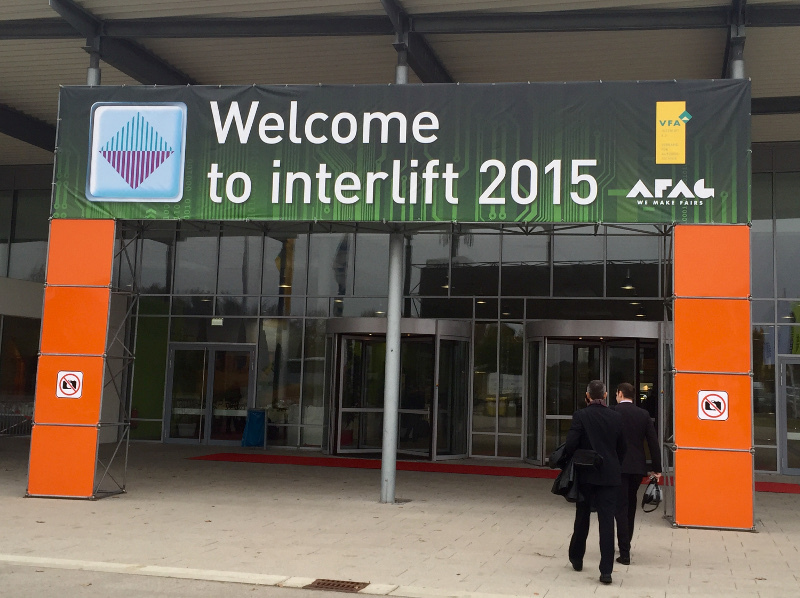 Have you visited us in INTERLIFT 2015 in Augsburg-Germany? Have you met our team? Have you seen our stand yet? 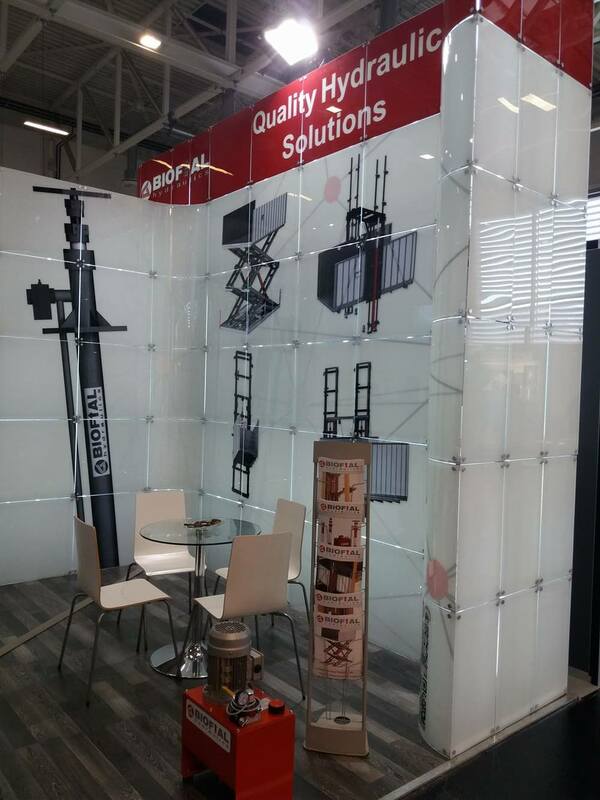 Bringing innovative solutions to the elevator industry, we have constructed our stand in a way that reflects our vision. 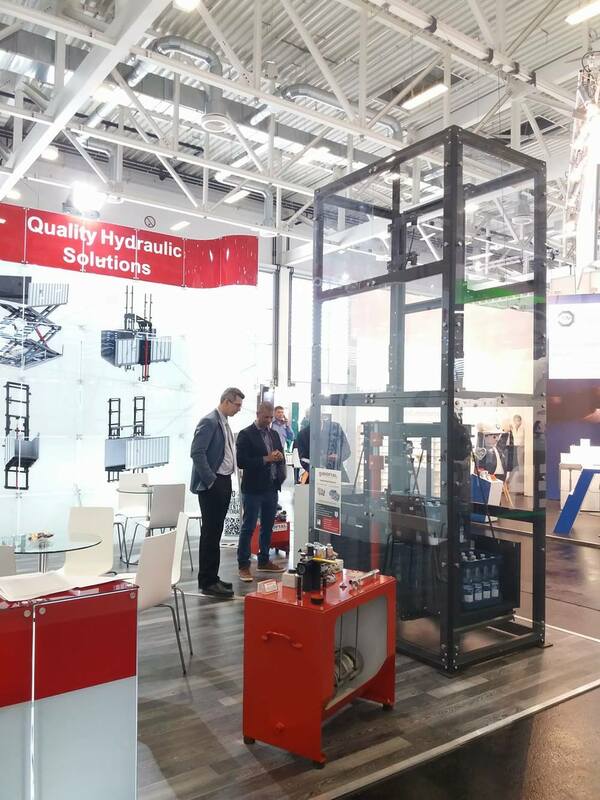 It features our distinctive hydraulic products and also at our stand is presented for the first time a hydraulic elevator which is powered by a cutting edge inverter-driven power unit. 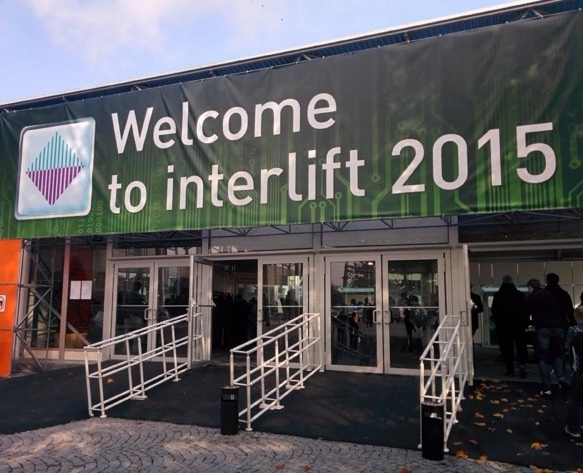 Join us at the INTERLIFT 2015 exhibition till Friday 16/10/15! 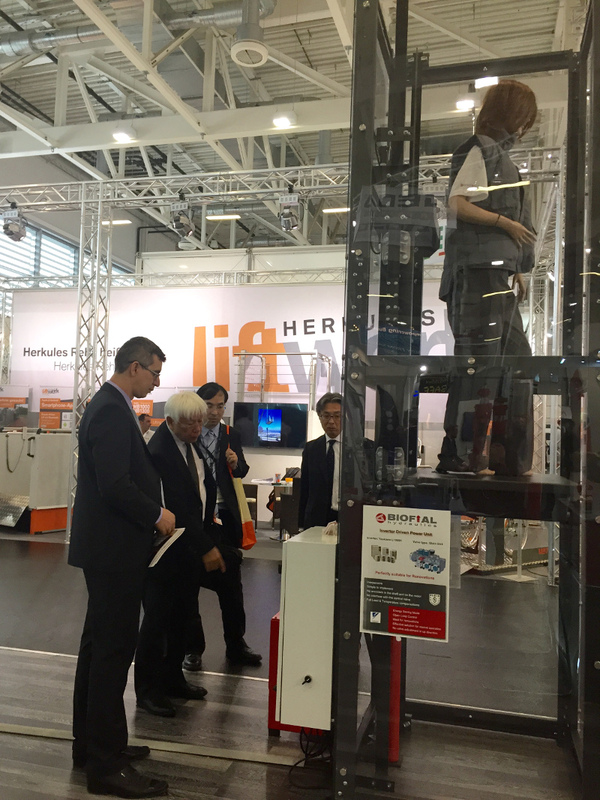 Once more BIOFIAL HYRDAULICS participates in Europe’s most important exhibition of the Elevator Industry, the INTERLIFT 2015! 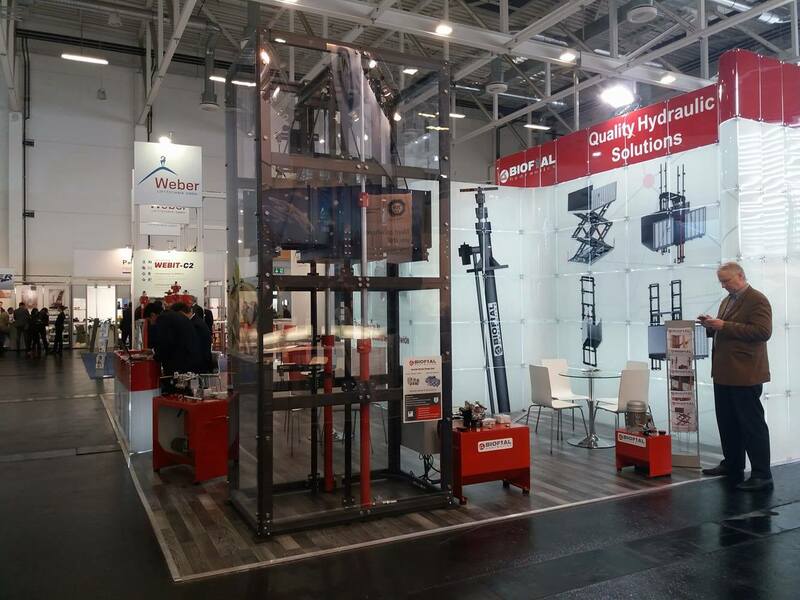 BIOFIAL HYDRAULICS team is in Augsburg-Germany is exhibiting its premium quality products in the INTERLIFT 2015 Exhibition, anticipating for our foreign customers and cooperators in Hall 5 / Stand 5160. 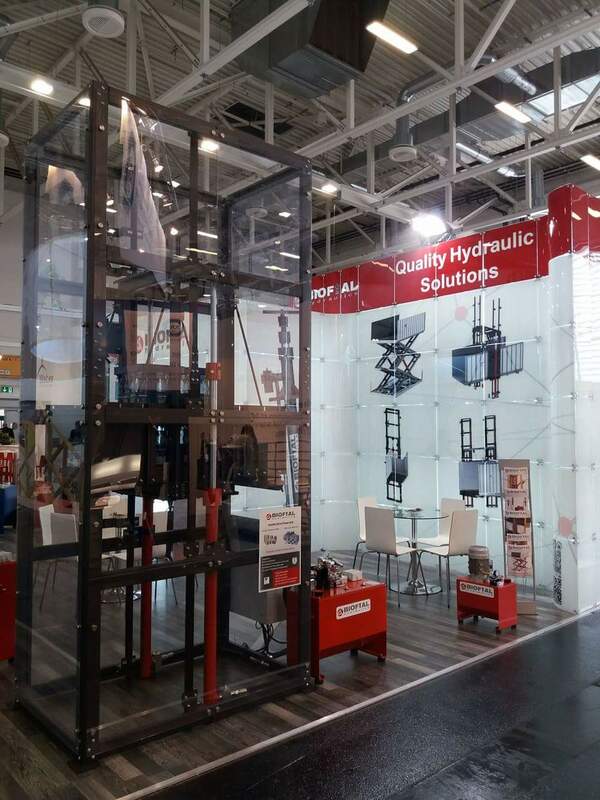 For the fourth consequent time BIOFIAL HYDRAULICS will be present in the most prestigious International Exhibition for the Elevator Industry, the INTERLIFT 2015, located at Augsburg – Germany. The exhibition will take place from Tuesday 13.10.15 up to Friday 16.10.15 at the Augsburg Trade Fair Centre and will be open each day from 09:00 to 18:00. 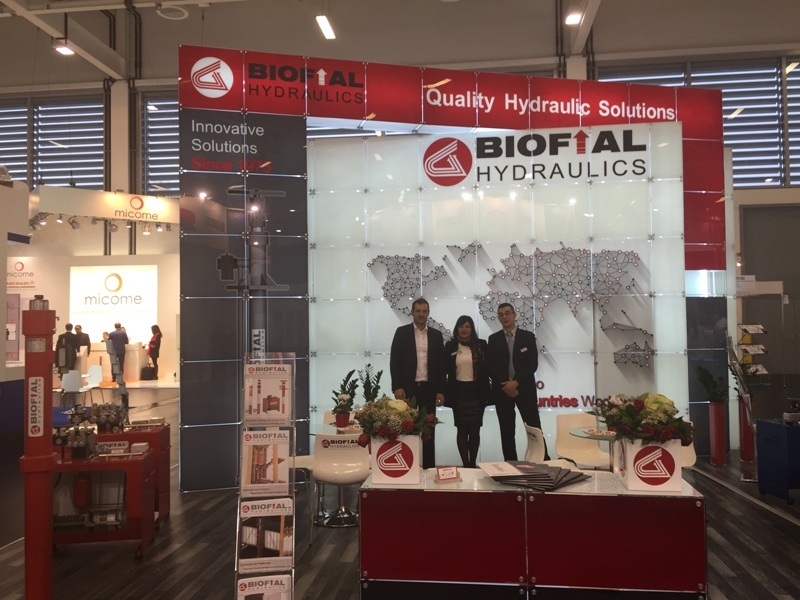 The team of BIOFIAL HYDRAULICS will be welcoming its international clients and cooperators, old and potential ones, as it always does. 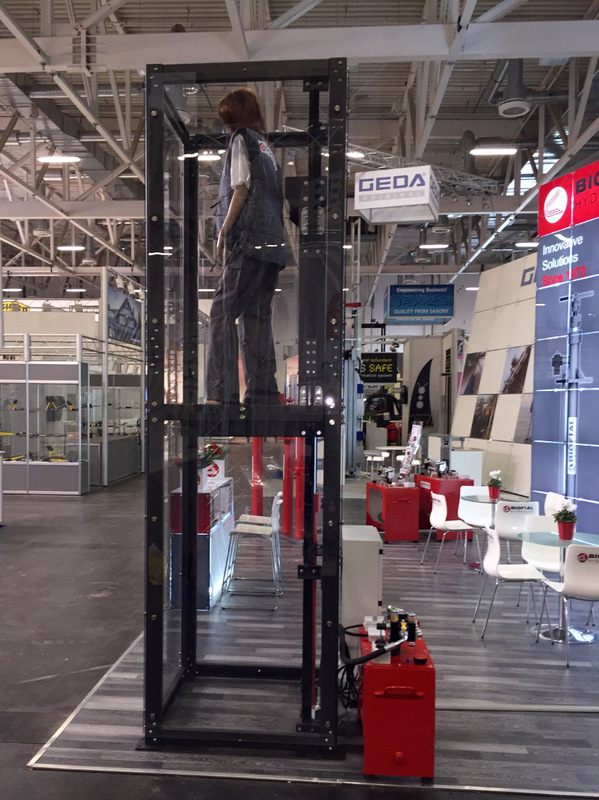 In our stand this year the visitors will have the chance to see a scaled down BIOFIAL hydraulic elevator in real operation. The hydraulic elevator presented will include a two-staged telescopic cylinder, an inverter-driven power unit and a car frame all manufactured by BIOFIAL HYDRAULICS with the use of the most innovative technologies in hydraulics, that reduce the energy consumption and significantly increase the efficiency of the elevator. 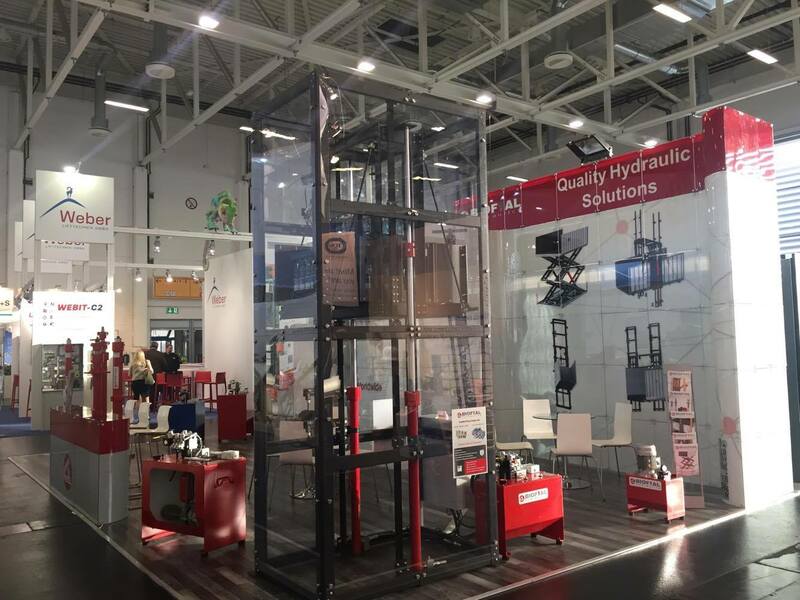 In case you wish to set an appointment in advance with our team or for any other help regarding your visit to 2015 INTERLIFT EXHIBITION, please do not hesitate to contact BIOFIAL HYDRAULICS. As we are always pleased to assist you, you can also follow this link and complete the online appointment registration form! Three new markets have been added to the BIOFIAL HYDRAULICS export activity map! We welcome Russia, Spain and Philippines to our international clientele! Having entered most European countries with direct exports of almost all the range of our products, one of the most difficult and most competitive markets has been Russia. 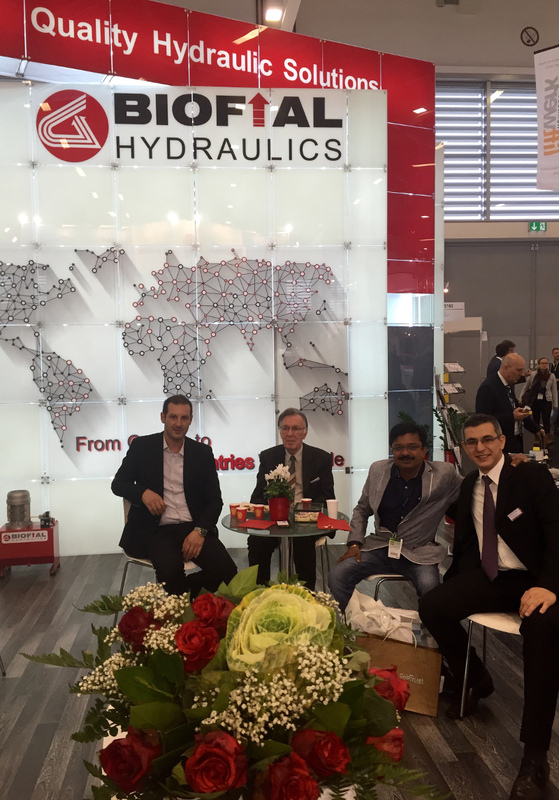 We have always had strong business relations with them and had our products featured in specialized projects through our clients, but now we are proud to announce that BIOFIAL HYDRAULICS products are directly exported to Russia. The Iberian Peninsula, has been on the path to sustainable growth of its economy and thus has attracted the interest of the manufacturing industry lately. We have had several requests from Spain and Portugal in the past years, but had not succeeded into obtaining key-customers until now. The last months, a respected Spanish elevator industry has started installing the BIOFIAL HYDRAULICS’ premium quality products to a variety of hydraulic elevator applications. Philippines and many other countries in Southeast Asia and the Pacific Ocean area have always had strong interest in the European elevator industry. Having a renown brand name and having already entered the near-by China growing market, has resulted in BIOFIAL HYDRAULICS entering now the Philippines market directly, with potentials of further entrance to other neighbor Southeast Asia countries. 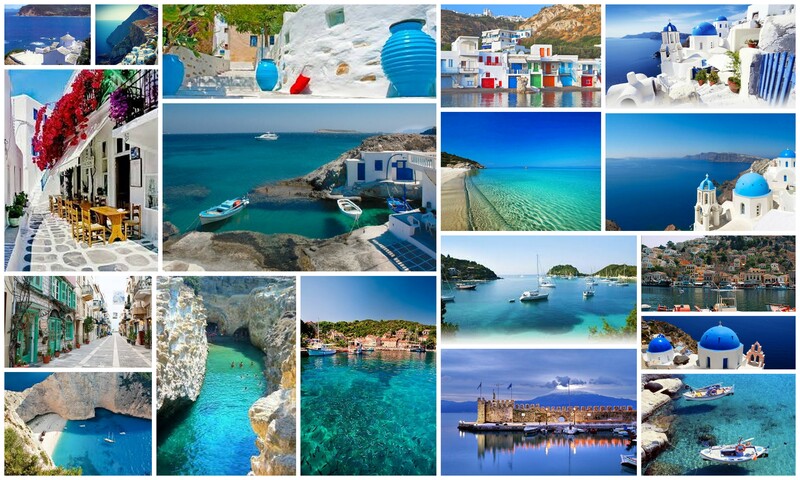 We feel happy and honored to state that now, the BIOFIAL HYDRAULICS products are been exported from Greece to 44 countries worldwide! 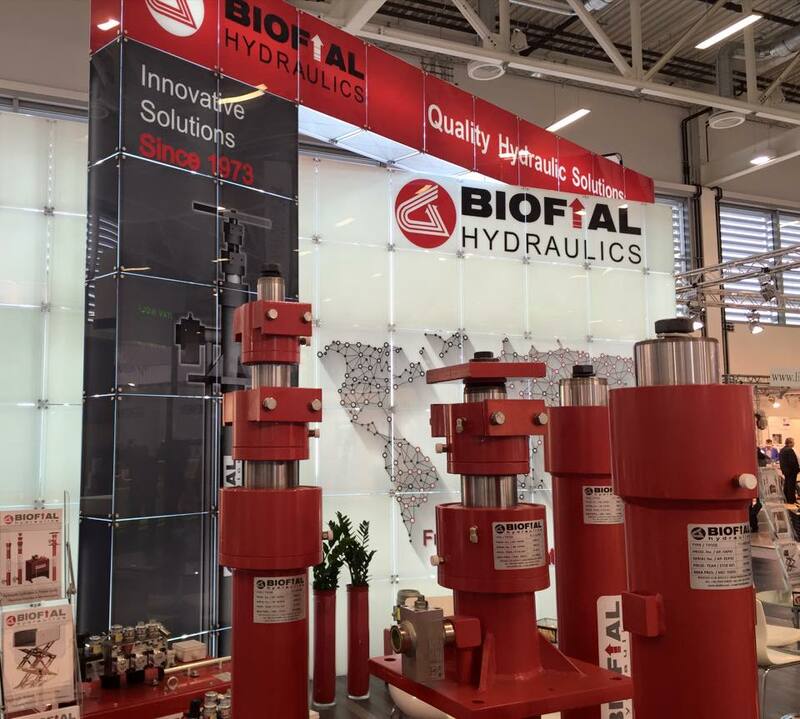 We believe that having standardized products may be a convenient solution for many manufacturing industries, but being able to produce any custom-made application is a factor that sets BIOFIAL HYDRAULICS apart from the other global competition of the industry. The challenge to build some robust project that will fit 100% the client’s needs is something that we always find alluring and stimulating. That has been our trade mark from the establishment of the company 42 years ago: to provide reliable hydraulic solutions where others cannot, in the shortest delivery time and in moderate cost. The following hydraulic scissor platform for example, is designed and manufactured for heavy cargo lifting. It can load cargos up to 3 tons of net weight and can travel 4,6 meters in height. The dimensions of the platform are 5,5m length and 2,5m width. 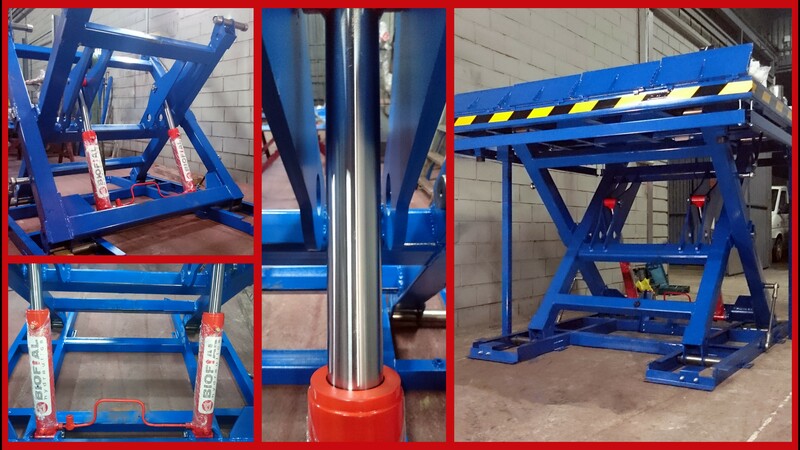 The whole machine has been implemented by BIOFIAL HYDRAULICS, from the hydraulic parts (cylinders and the power unit), to the metal parts (platform and metal construction), for an important international customer that trusts us throughout the years for all the special projects that he installs. 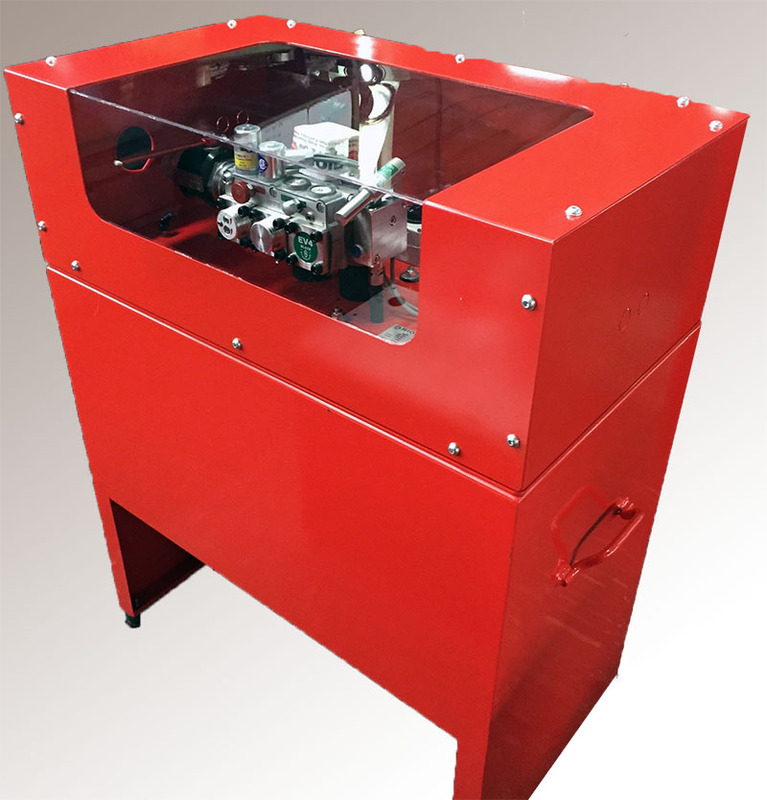 So to conclude, we can with any doubt manufacture standardized hydraulic products for lifting applications, as other companies do, but we are one of the few industries in global scale, that can undertake completely customized hydraulic projects for any specifications and without any limitations. The contemporary architecture of the buildings in urban centers and the various spatial restrictions that occur because of it, create several complicated challenges that the vertical movement industry has to face, not only in theory, but in practice, meaning the actual implementation of such projects. BIOFIAL HYDRAULICS has the scientific and technical knowledge, the know-how and the experience of 42 years of executing such projects. Οur technical department considers it a challenge when we receive an inquiry for a project that is set apart from the standardized series and requires specialized planning. So, we are proud to present our latest customized special hydraulic car parking project, which operates only by hydraulic movement in both axis, vertically and horizontally and it is studied, calculated, designed and manufactured exclusively by BIOFIAL HYDRAULICS. In this occasion, the challenge given by our customer, was to create a hydraulic vehicle parking platform that would move not only vertically, but would execute horizontal offset to the car loaded. Meaning, it would load and move the vehicle from position 0 to -1 and place it in position -2 with the use of hydraulics. And as a matter of fact, in this customized project, the horizontal movement was longer than the vertical. Maybe it is not easy for the average user to understand the significance of constructing a vertical lifting project that operates only by the use of hydraulic movement, when most of the manufacturers will have chosen to implement such a project with mechanical assistance. But during the installation and the year-old operation of machinery, this is a factor that makes the difference. It also increases the safety factor of the whole installation, thus making it more secure for the car and its driver-user. The first part of the project is something that we are implementing very often in vehicle parking systems applications. The motion is set by the use of two opposed hydraulic cylinders positioned in the frame of the construction that make the vertical movement. 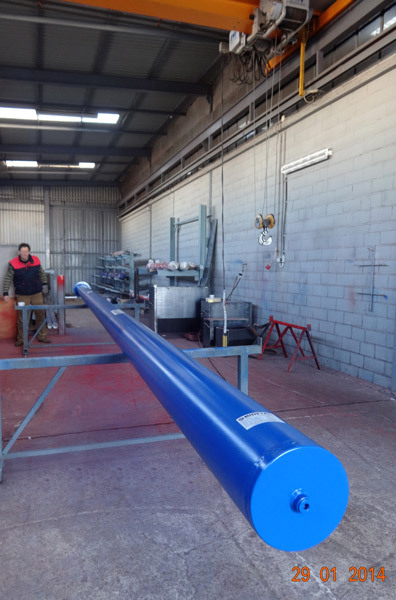 In this kind of applications the suspension is usually indirect, due to the small travel of the platform, but since BIOFIAL HYDRAULICS specializes in the manufacturing of exceptional quality telescopic cylinders, we are able to produce even 3-staged synchronized telescopic cylinders that travel over 10m so as to achieve the required height. For the second part of the movement, in the horizontal axis, most companies would use electrical motors and other mechanical parts in order to achieve the horizontal offset, but for BIOFIAL HYDRAULICS this was not a choice. 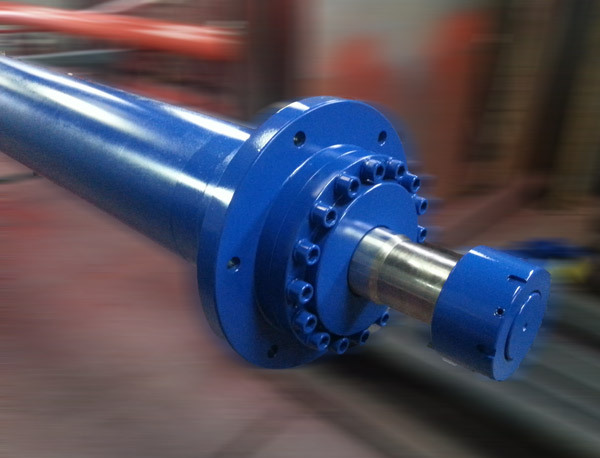 We manufactured a double acting hydraulic cylinder that is normally used for other kind of industrial applications and customized its specifications to fit the needs of this specific project. The result was a seamless hydraulic project that uses 2 twin hydraulic cylinders, 1 double-acting cylinder and 2 power units that were placed in a customized platform. This combination operates perfectly as a joint hydraulic lifting system, which is regulated by an automated customized control panel that sets everything into motion. The production of such projects is the main cause that we truly enjoy our field of expertise, since it makes us challenge our experience in finding ways to successfully implement these kind of constructions, using only quality customized hydraulic products that we design and manufacture. It is not a coincidence that when such inquiries occur in a market around the globe, many different companies from the same market apply to BIOFIAL HYDRAULICS seeking for trustable solutions. So, we have every reason to claim that we DO hydraulics with actual evidence! The Chinese market has always been a target for our export department, due to the fact that China is one of the largest and most fast growing markets in the world. But as you might already know, BIOFIAL HYDRAULICS products are distinguished because they are produced for custom made applications, under the most demanding specifications and this fact can make them stand out from other solutions. So, we are very proud to announce that BIOFIAL HYDRAULICS products can now be found in installations in China! We consider this a great achievement that will increase our company’s brand awareness massively and open new possibilities for further cooperations and business contacts in the Eastern part of the globe. When most companies import from China, WE are exporting our products directly to China! 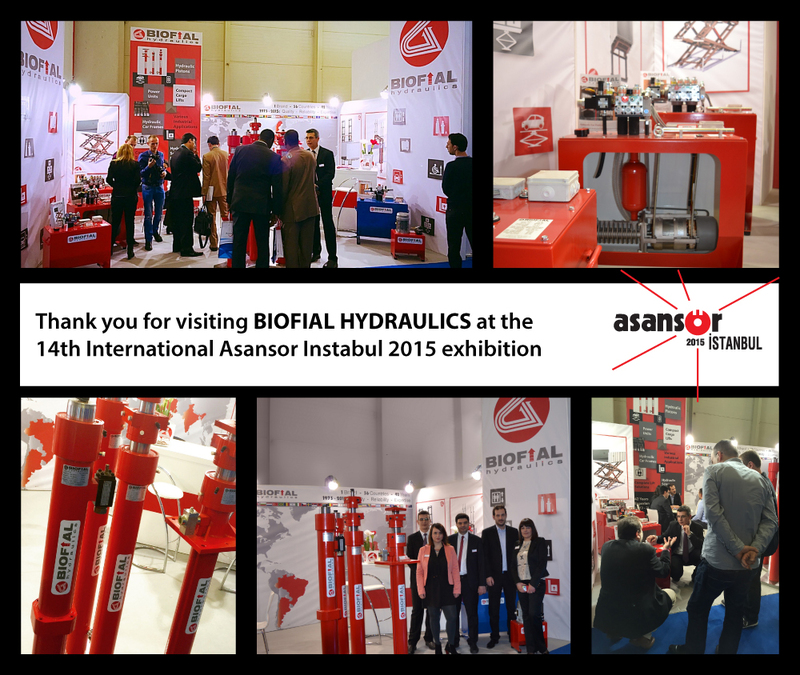 For the second subsequent time BIOFIAL HYRDAULICS has participated in one of the most important international exhibitions of the global lift industry, the 14th International ASANSOR ISTANBUL 2015 Exhibition! 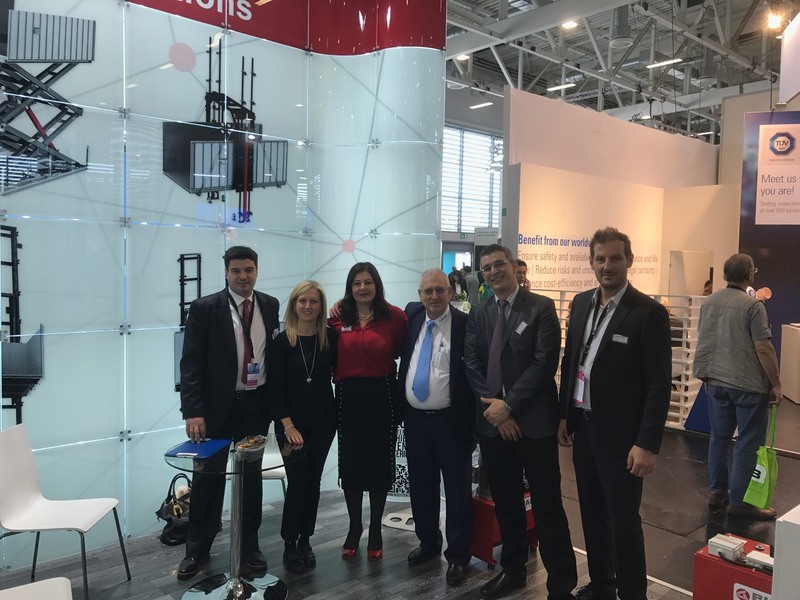 Our team presented the total range of BIOFIAL HYDRAULICS premium quality products, attracting the interest of numerous international visitors and gaining lot of positive feedback. 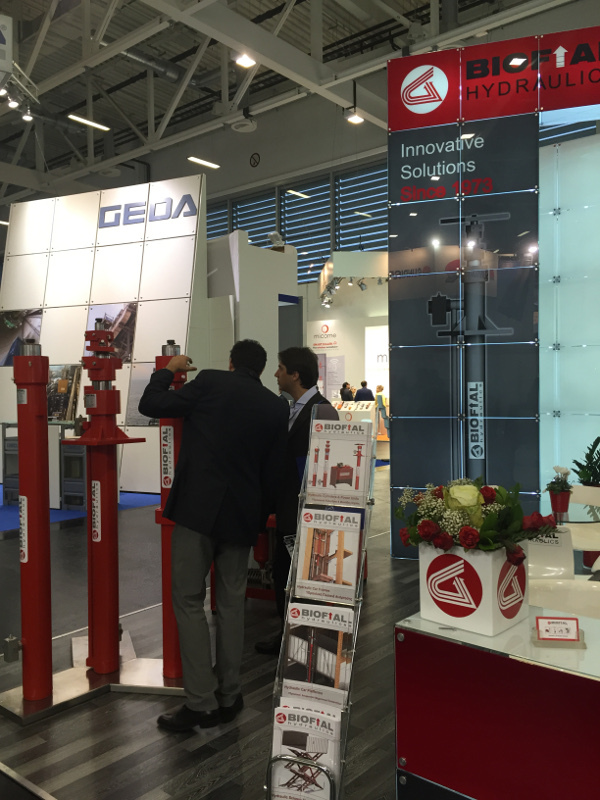 This was our forth participation in an elevator exhibition of global range and from all the comments and remarks received, we are most grateful that our brand name has gained a lot of awareness and that BIOFIAL HYDRAULICS is now characterized as a trustable partner by its cooperators. We would like to thank each and every one who has visited us in the 14th International ASANSOR ISTANBUL 2015 in Turkey at our stand No. 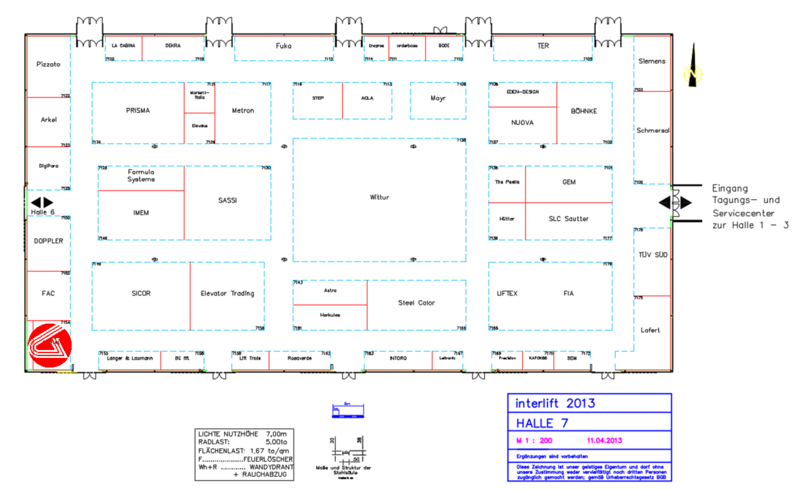 A-52, located in Hall 12. Once again the exhibition was a wonderful experience, as it gave us the opportunity to meet with our long term cooperators and further develop our business relations with representatives from companies all around the world. 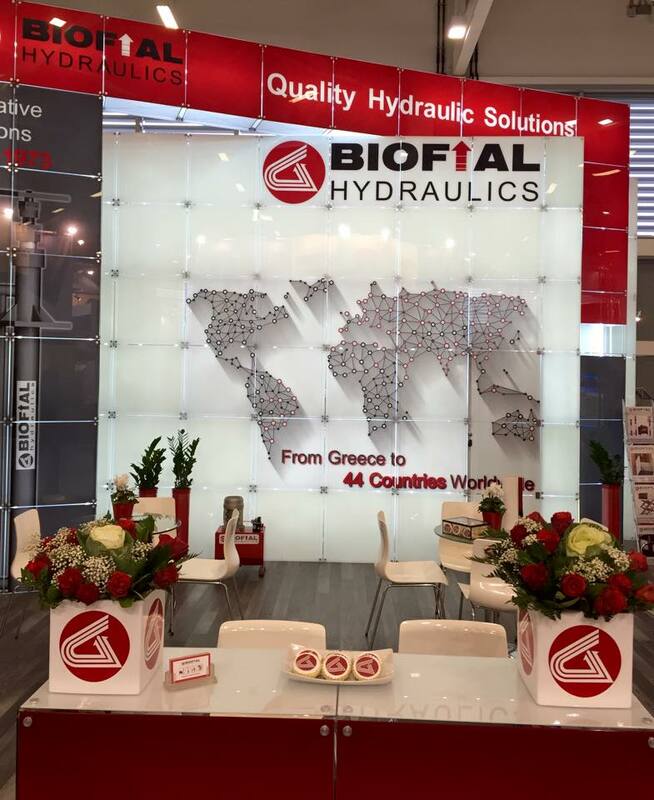 We would like to say a special thanks to all our worldwide partners, the existing and the potential ones, customers or suppliers, that honored us with their presence again this year, as the personal and direct communication is always a top priority for BIOFIAL HYDRAULICS. Concluding, our participation was completely successful and in harmony with our company’s settle but yet notable presence in the field. 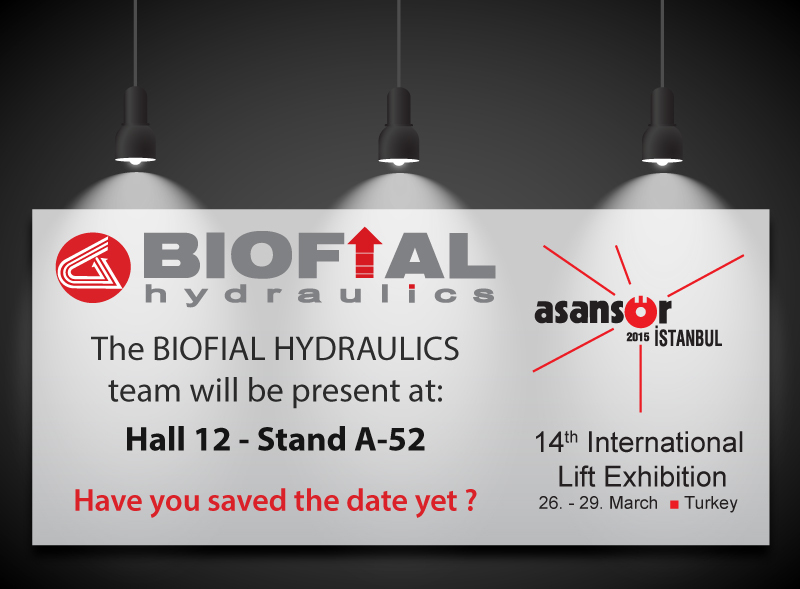 We renew our commitment to participate at the ASANSOR ISTANBUL 2017 Exhibition, but hope to see you sooner at the next big international exhibition that BIOFIAL HYDRAULICS will participate: the 2015 INTERLIFT Exhibition that will take place in Augsburg, Germany this October! Till then, we are always in your disposal to provide you with the most qualitative hydraulic lifting solutions, the most prompt and friendly assistance, along with the most competitive economical terms. Having an active and constantly expanding export activity, is something that we have worked hard for. This is proved by the fact that one can find BIOFIAL HYDRAULICS products in countries that appear on every side of the globe. And it also consists proof that our products, due to their premium quality, can stand in every market worldwide, can be installed in any application, can perform in any condition. Entering new regions and exporting our products directly to every continent and country has been a goal from the establishment of the company until today. Over the past few months we have developed strong business contacts that allowed our premium quality products to travel 15.200 km in order to reach their destination. So, we are proud and happy to announce that since last month, we have entered our farthest market yet: New Zealand! By entering this new market we have also established our brand name in the east hemisphere and have raised a lot of awareness for BIOFIAL HYDRAULICS and its wide range of applications in the field of hydraulics. 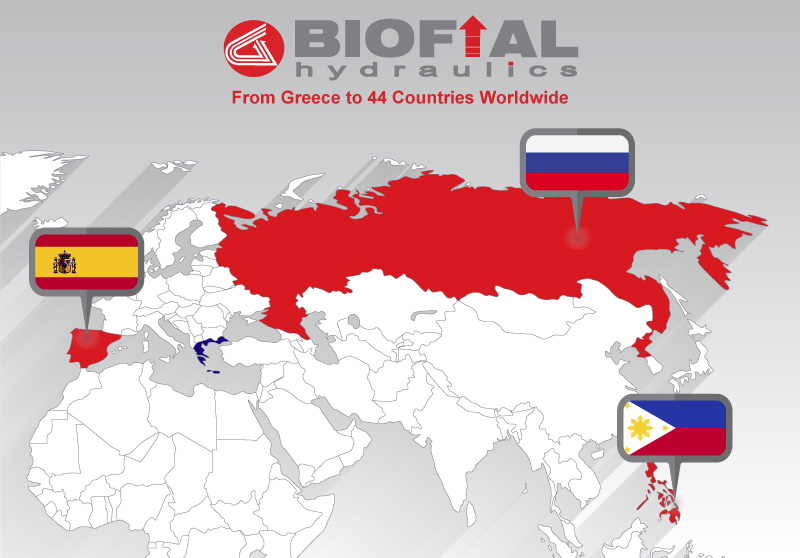 Today, the BIOFIAL HYDRAULICS products are being exporting directly in 36 countries, in all the 5 continents of the globe and thus, we thank you for your trust and your preference! 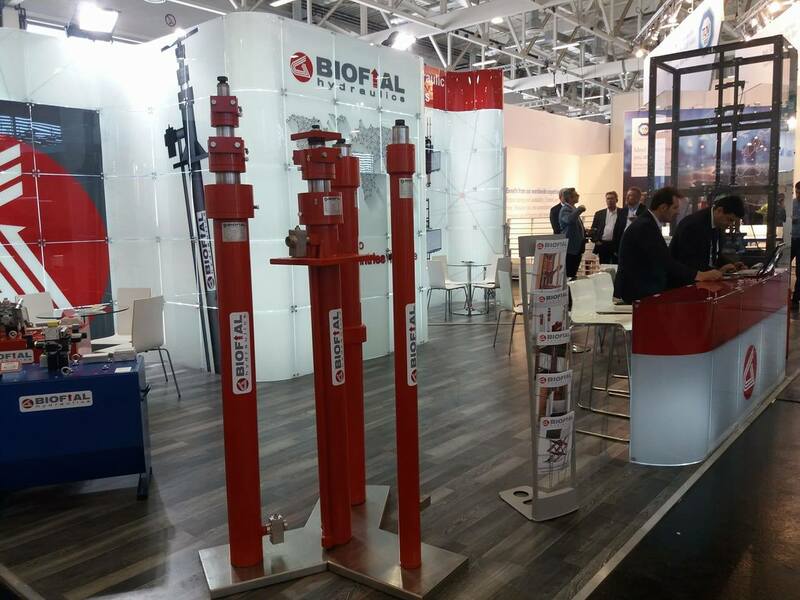 BIOFIAL HYDRAULICS has always been known for the premium quality of its products and the excellent service, along with the direct and open communication that develops with its clients. This diptych differentiates BIOFIAL HYDRAULICS from the completion that exists in the international market. But are you informed about our delivery time? Do you know what “express delivery” means for us? BIOFIAL HYDRAULICS has the ability to offer to its clients complete solutions to their inquiries in less than 24 hours after receiving their request. Our offers include thorough planning of the project, with all the specifications included, even plan views and technical drawings. We want and we can offer to all of our cooperators the best fitted solutions for their quotations. 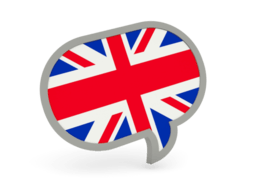 This is why, in many cases we reply back with different alternative proposals, equally suitable and safe, in order to offer to our customers the choice that they prefer. So, in every inquiry we receive, we can state with confidence that our reply consists of not only an economical proposal, but of a complete project study of pure customization. Some say they make fast deliveries in their standardized products. We GUARANTEE express delivery! And we guarantee express delivery not only for the standardized products, but most importantly, for the pure tailored-made products according to any customers’ specifications. From the moment that we receive the confirmation of a project, it is forwarded in the engineering department for all the final calculations and from there in manufacturing department within the same day. Having a 42 year-old experience in standardized and customized hydraulic product manufacturing process, has equipped us with the ability to produce hydraulic products, components (power units, pistons, car slings, etc) or complete solutions (cargo lifts, scissor platforms, car lifts, etc) in a minimum time frame that other companies need for the delivery of their standardized products. This explains why our international clients refer directly to BIOFIAL HYDRAULICS when they need the best quality in special tailored projects, guaranteed to be delivered in the shortest possible time period. 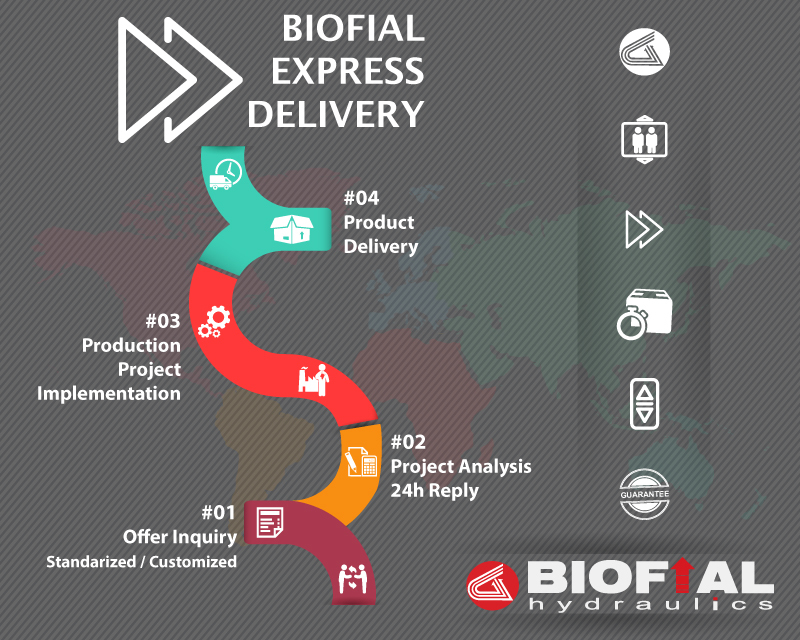 Our express delivery service, along with the known, consistent and friendly customer assistance we offer to all our clientele, former and new, proves how BIOFIAL HYDRAULICS understands and implements the importance of time for every customer, in every sector, in every market. Thus, when you need a reliable supplier to respond to your standardized or customized project demands within the same day, offering you a technically constant solution, in express delivery time, we challenge you to apply to BIOFIAL HYDRAULICS. Because while others claim that they offer quick delivery, we DO offer “Express Delivery” of premium hydraulic products! 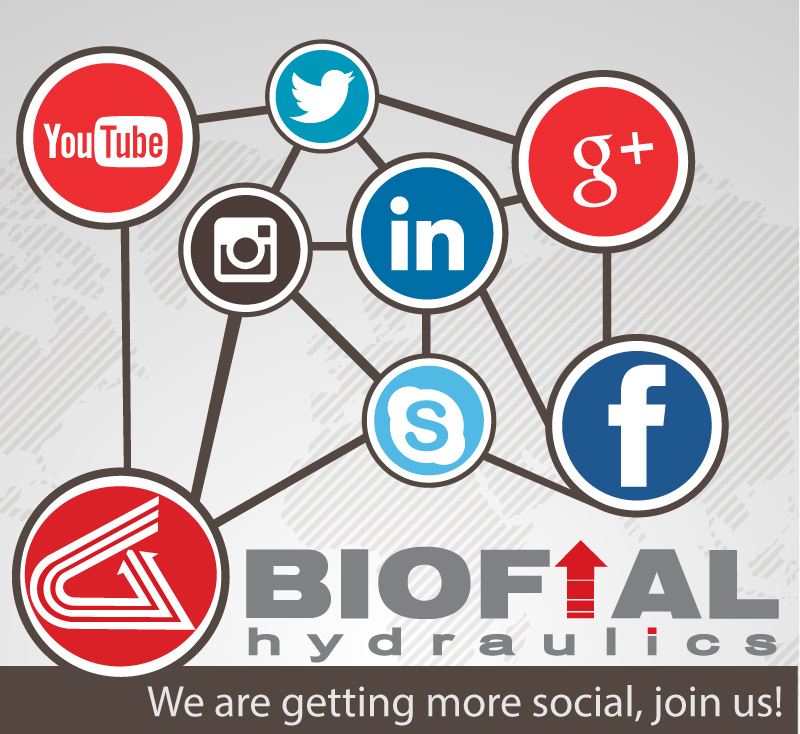 BIOFIAL Hydraulics has vigorously entered the social era and has gained massive brand awareness through its presence in the social media. Wanting to expand our reach even further and ease our contact with our international cooperators, we have opened accounts in all the major social platforms in the internet. Now you can view our official page also at Google+, where you can get to know us better and be informed about our latest news. Additionally, by following BIOFIAL HYDRAULICS in our new Instagram account (@Biofial.Hydraulics, #biofial) you can share photos and videos of our products installed globally! Also, more members of the BIOFIAL HYDRAULICS team have created and published their professional profiles in LinkedIn, so that you can view each of us individually and be able to contact us directly. 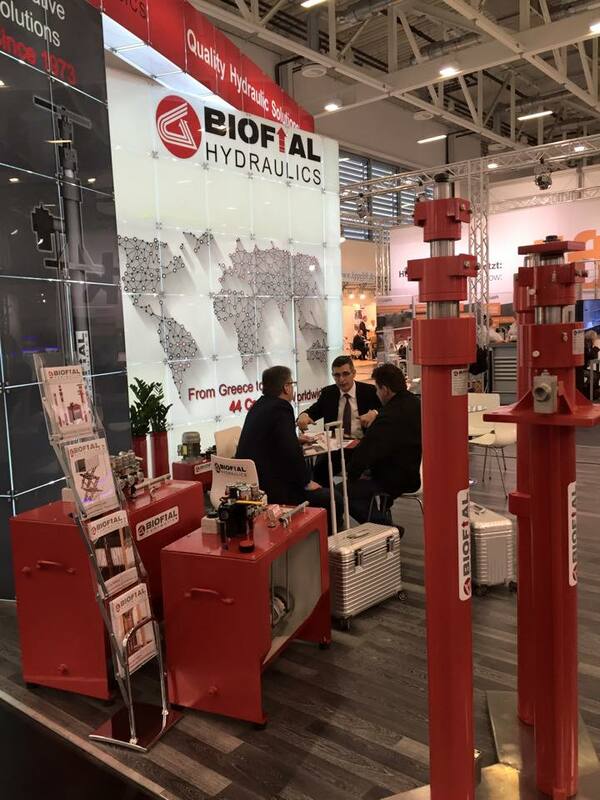 We invite you to connect with us, tag yourself, discuss with us issues of mutual professional interest, follow us and share with us photos of BIOFIAL HYDRAULICS installed in your international projects! We are pleased to announce that 2014 was the best year that we have ever had regarding both the offer inquiries and the order confirmations that were placed by our customers. Off course this reflected in the annual turnover of the company and the general profit, which was significantly risen from the previous years. Two of our main advantages have always been the company’s flexible production and its ability to address any kind of hydraulic project with precision, according to each demand. And this is appreciated by the customers that trust BIOFIAL HYDRAULICS. Another high achievement for us and mainly our export department, was that we managed to enter new global markets that we had been aiming. These were the markets of Hungary, Kosovo, Kuwait and the United Arabic Emirates. We have developed strong business and personal relations with strategic partners that support and promote the BIOFIAL HYDRAULICS brand in their regions. At the beginning of 2013 we introduced our newest addition to the series of products that we manufacture, the BIOFIAL Hydraulic Car Frame, the BIOFIAL Compact Cargo Lifts, the Car Platforms and last but not least, the Scissor Lift Platforms. Exactly two years after their launch we have successfully planed, manufactured and installed several hundreds of such projects throughout the globe and have received very positive feedback regarding their robustness, their precision to the specifications and their general operation. 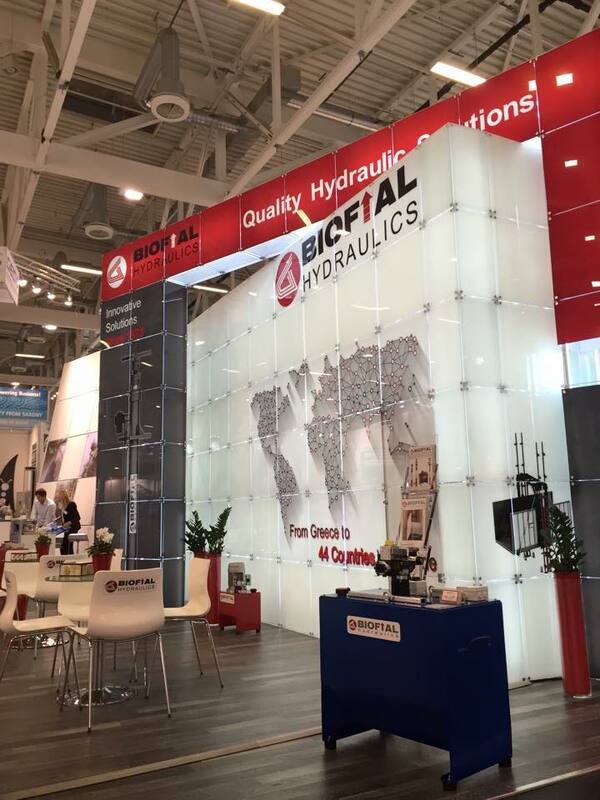 BIOFIAL HYDRAULICS has become a synonym of manufacturing quality hydraulic solutions for special, non-standardized projects that the international competition fail to assist. Our scientific personnel participated with its articles in well-known international magazines, portals and discussions for the hydraulic lift systems, their efficiency and the new innovations of the field. We strongly support their thoughts and believe that their actions reflect BIOFIAL HYDRAULICS as a respected company with actual knowhow within the engineering world. We have empowered our business and personal relationships with our international customers, suppliers and cooperators. Numerous persons, from India to Russia and literally from all over the world visited our company and our team at our premises in Thessaloniki. We were honored to welcome some long term clients that wanted to discuss some of their ongoing projects, but also several new business contacts that wanted to meet us in person and take a tour of our factory. Our team has also visited several cooperators mainly across Europe, in order to discuss various business issues. Thus, we would like to thank all of our valued clients and our respected suppliers for their time consumed in those meetings and their efforts to upgrade our cooperation. We like to be connected with our cooperators and with international market generally. Thus, this past year we enforced our presence in the social media. We had a belief that even though our products were well known, many people were not familiar with our company. Now, with the social media growth and our focus on promoting our company awareness through specialized marketing strategies, we have increased the BIOFIAL HYDRAULICS brand recognition. So, after referring to 2014 highlights, we would like to present our new year’s revelations for 2015. 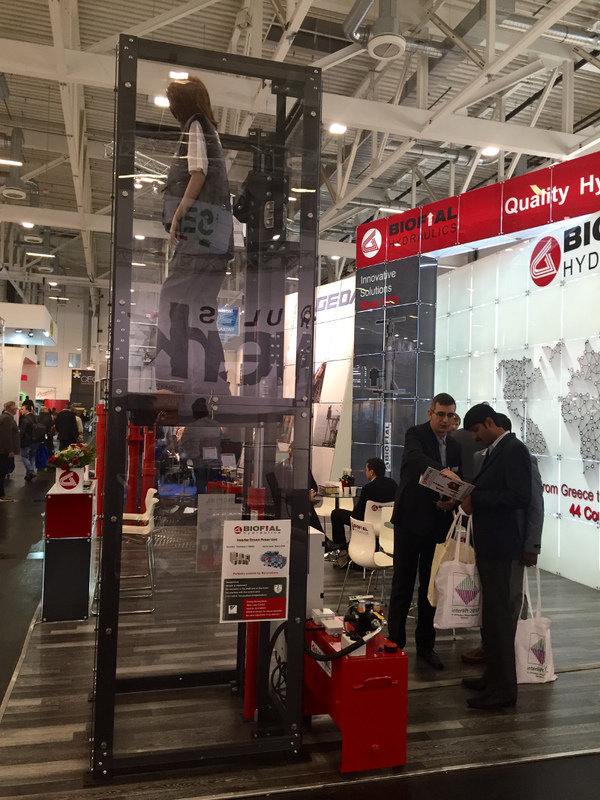 This year the main focus is on the two international exhibitions that BIOFIAL HYDRAULICS will participate. 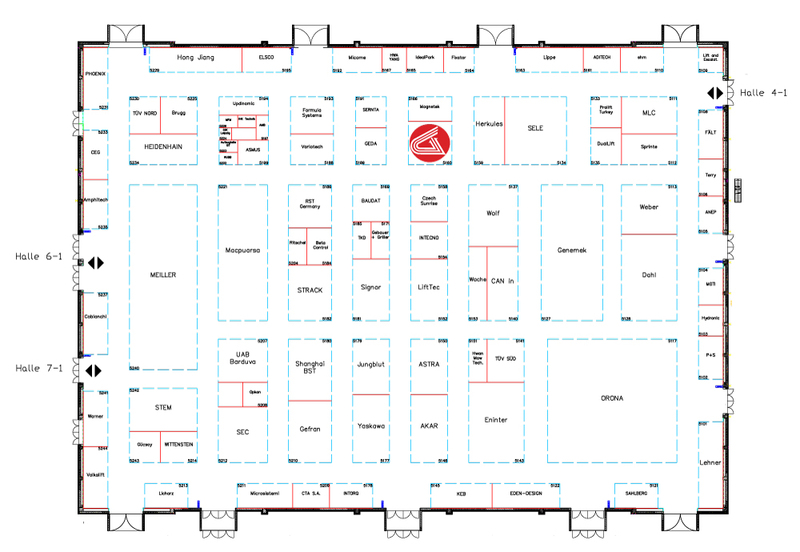 The 14th International Exhibition “ASANSOR ISTANBUL 2015” that will take place on Istanbul at 26th to 29th of March and the 2015 INTERLIFT exhibition will take place in Augsburg at the middle of October. Also our interest in the countries of the middle East and developing direct business relations with them, is a goal that we want to achieve and have every prospect of accomplishing. Moreover, this year we want to promote the specialized projects that we and our clients have implemented in the past years and have been operating continuously until now, after all that is the only way to evaluate the quality of our production right from the source. Last but not least, last July we announced that our R&D department had been renewed with highly qualified personnel in the field of hydraulics, in order to keep up with the new demands that we were receiving. Also in the same announcement we revealed that a new series of products would be launched that would expand our range of products drastically, but before giving out more information we have to manage all the details and finalize our designating and planning, so stay tuned. Finally we warmly thank all the BIOFIAL HYDRAULICS’ personnel that supported the company for yet another year in order to assist all our customers in the best possible way and always with a friendly and direct manner. Closing this post, we want to thank once more, our customers, old and new ones, for their year-old trust and preference, all our suppliers that have supported us in every way and all our cooperators and friends, with their positive attitude made business a pleasure. We are looking forward to a prosperous 2015, filled with new ventures, new connections across the globe and lots of successful business stories…. The first of our international appointments for this year is at the 14th INTERNATIONAL ASANSOR ISTANBUL 2015 EXHIBITION at the end of this month. To be more precise the exhibition will be held for the 26th of March until the 29th at Istanbul Turkey. It will take place at the Tüyap Fair and Congress Center, in İstanbul, in the heart of Turkey. Tüyap is located in Beylikdüzü / Büyükçekmece and it is easily accessible by bus or car. It takes nearly 25 minutes from the Istanbul International Atatürk Airport and is a 45 minute drive from Taksim Square, the city center. Except our long-lasting cooperations with Turkish leading elevator industries, since the past five years we have established strong business contacts with companies located in the East, like India, Kuwait and U.A.E. Thus, we consider that this will be the perfect opportunity to meet with all our Asian cooperators in a more personal level and develop even further our cooperation. Also, in such international exhibitions we always have the pleasure of making new business relations with respected companies from every part of the globe and expanding our brand name even further. 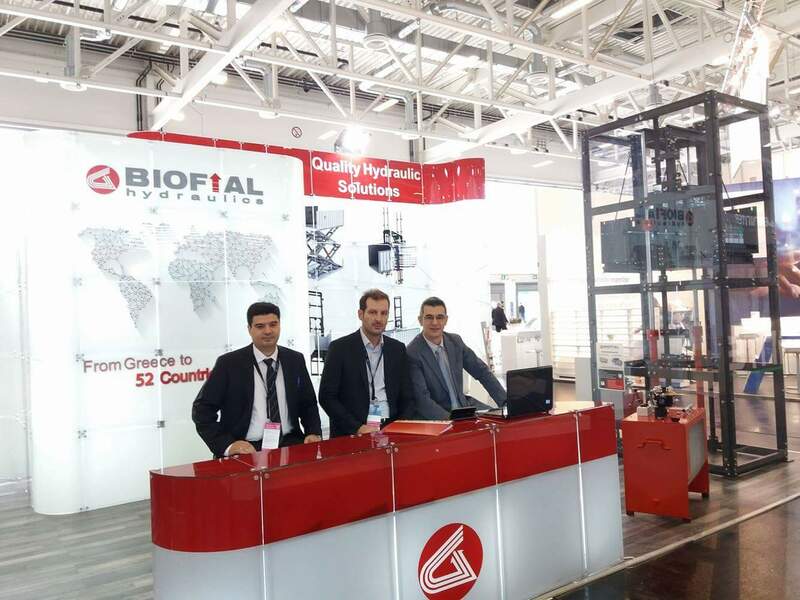 In case you wish to set an appointment in advance with our team or for any other help regarding your visit to 14th INTERNATIONAL ASANSOR ISTANBUL 2015 EXHIBITION, please do not hesitate to contact BIOFIAL HYDRAULICS. As we are always pleased to assist you, you can also follow this link and complete the online appointment registration form! We are looking forward to welcoming you at the International 14th INTERNATIONAL ASANSOR ISTANBUL 2015 EXHIBITION for yet another successful year! 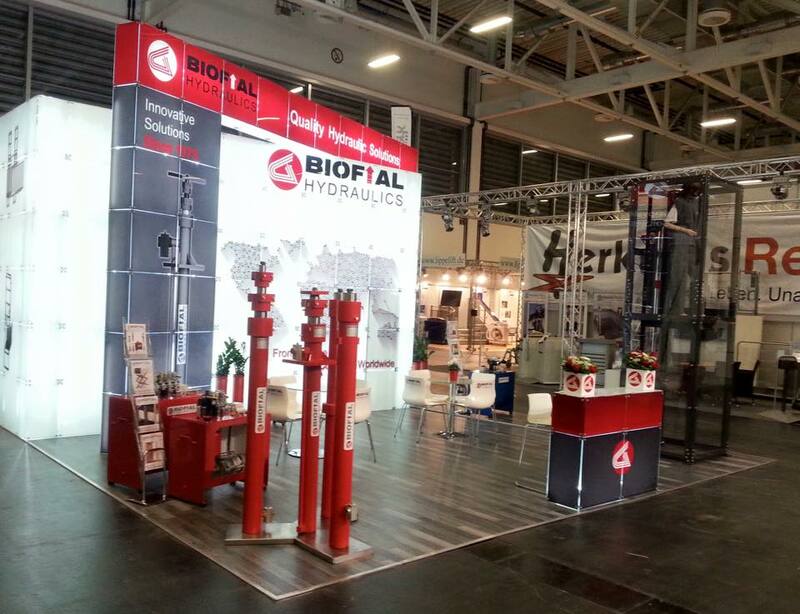 Be there with BIOFIAL HYDRAULICS…. 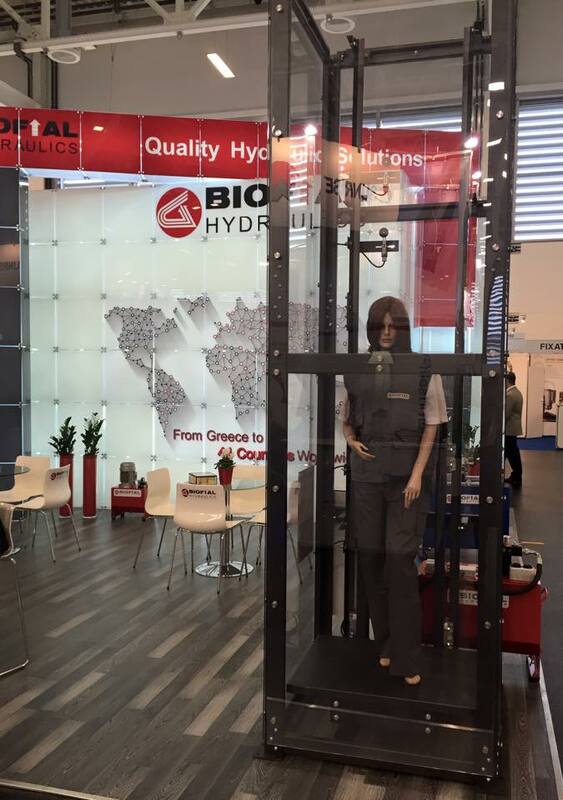 Year 2015 is going to be a very busy period for BIOFIAL HYDRAULICS and its people, as we are participating in the two major international elevator exhibitions held in Europe. 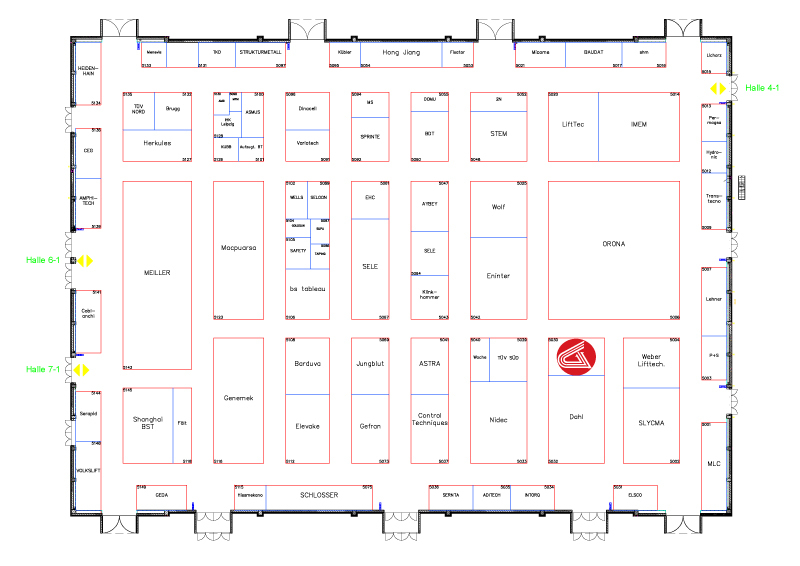 Our first appointment is for the 26th to 29th of March at the 14th International Exhibition “ASANSOR ISTANBUL 2015” and will take place in Turkey. This fair is organized every two years and this will be our second participation. 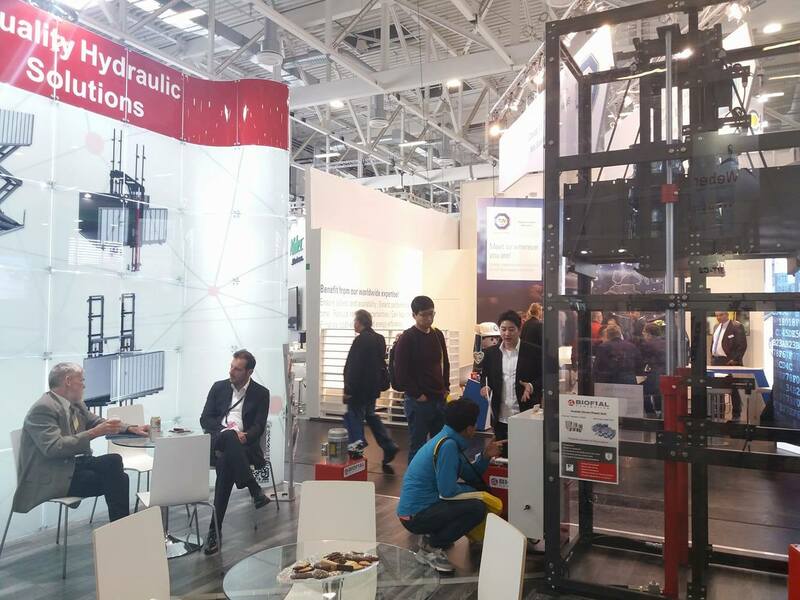 During our last visit we have made several interesting business contacts with other exhibitors and visitors and have developed more than a few cooperations with important companies in the field of hydraulic lift systems. Since this will be our second participation to “ASANSOR ISTANBUL” we are certain that our attendance will be even more successful one and that we will have the chance to recap with old customers and begin joint ventures with new ones. 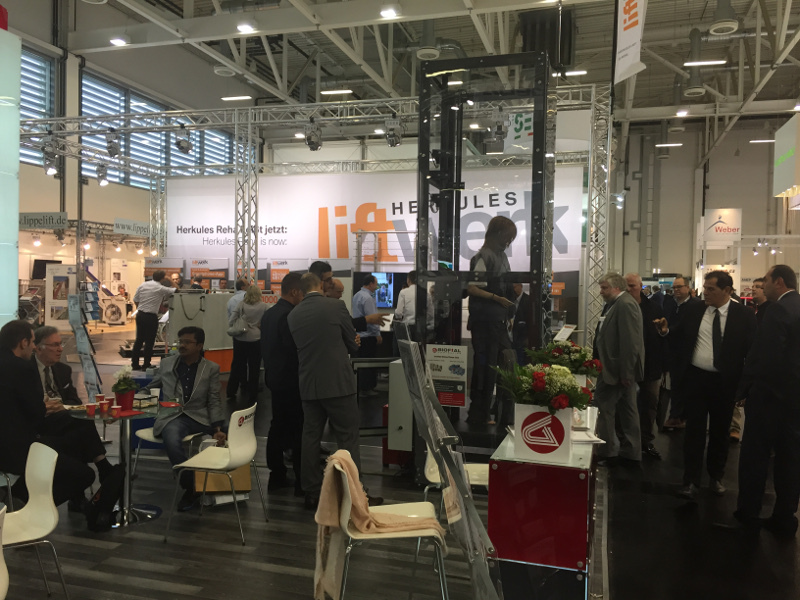 At the middle of October of the same year, the 2015 INTERLIFT exhibition will take place in Augsburg, Germany and it will be one of the most significant world meetings for the lift industry. 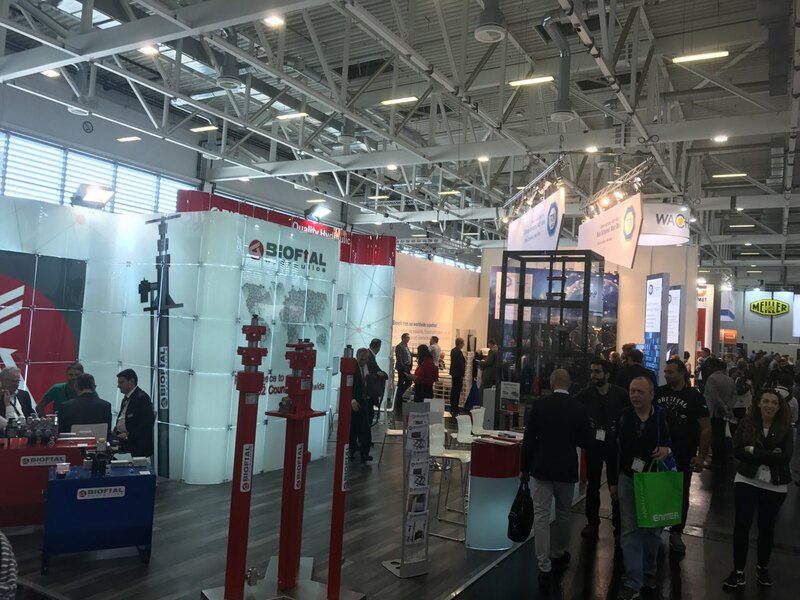 Every two years this exhibition attracts professionals from across the world and off course BIOFIAL HYDRAULICS could not miss it. As we have done in our two previous participations in INTERLIFT, the BIOFIAL HYDRAULICS team, will be present to welcome our year old cooperators and meet potential ones. 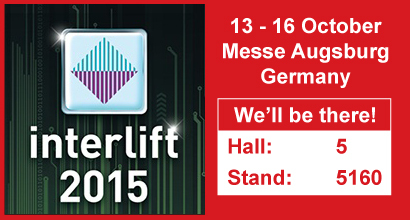 Looking forward to meeting you in both two most prominent international lift exhibitions of Europe! 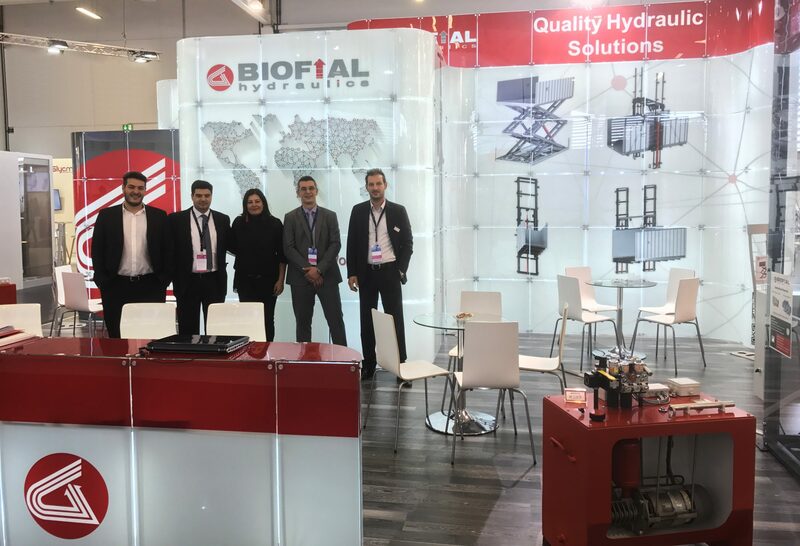 Here in BIOFIAL HYDRAULICS, our export department has a precise view both of the countries and the customers that our products are exported, but usually we do not know which is their final use, where they are installed and what need they serve. It is well known that BIOFIAL HYDRAULICS’ strongest asset is the ability to customize any hydraulic application. We can examine, calculate, design, produce and implement any project, no matter how unique its specifications might be. But having in our clientele more than 1000 active customers and exporting in 33 different countries worldwide, we cannot keep track of the final applications that the products are meant for. In this project our client wanted a twin system of hydraulic cargo elevators to be used in the major pharmaceutical warehouse “LIRI MED”. 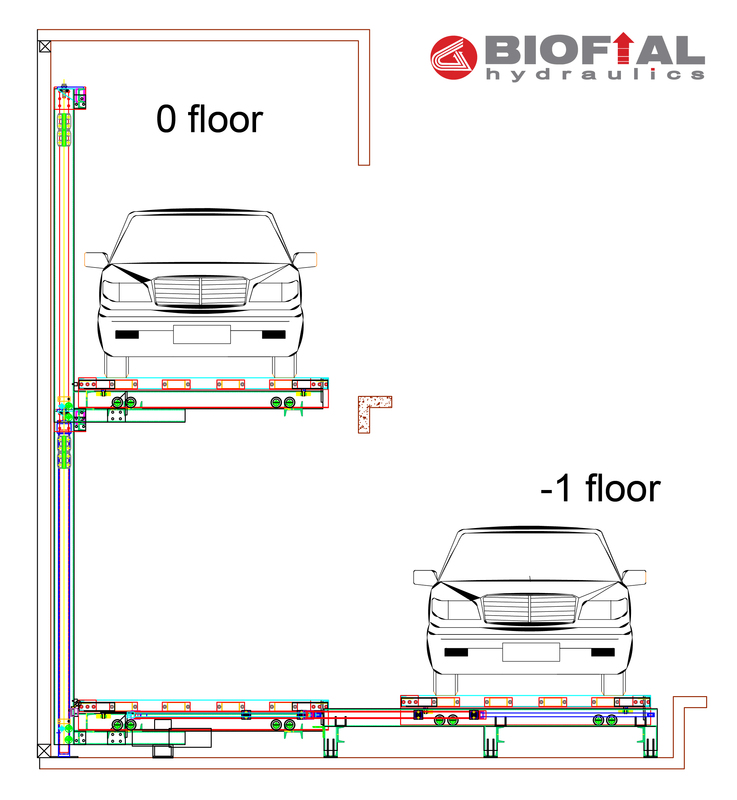 BIOFIAL HYDRAULICS undertook the whole production of those twin hydraulic cargo elevators, meaning the hydraulic cylinder, the power unit, the car frame, the steel construction, as well as the installation of the elevators. This project was a pleasant surprise for us! The Selexyz Bookstores is a well-known brand for Netherland’s booklovers. 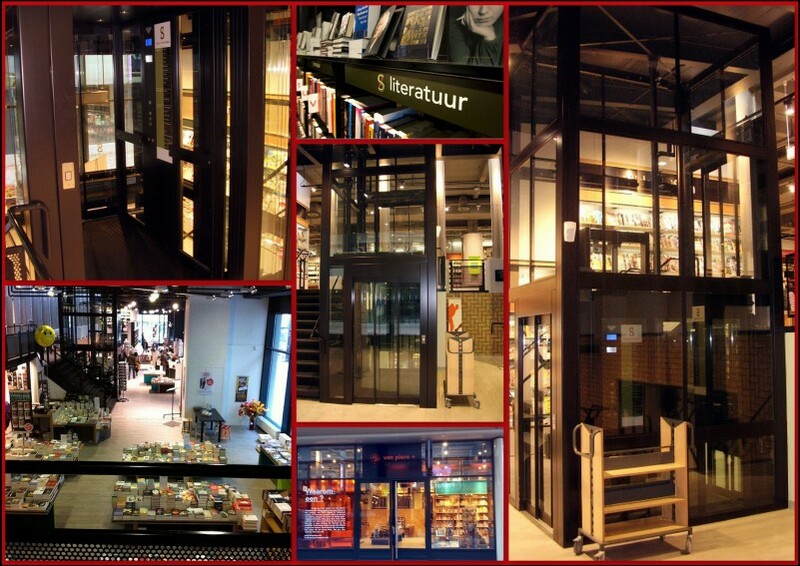 This project includes a customized hydraulics passenger elevator, located inside the store that takes the visitors to one of Eindhoven’s best coffee shops that is hidden downstairs! 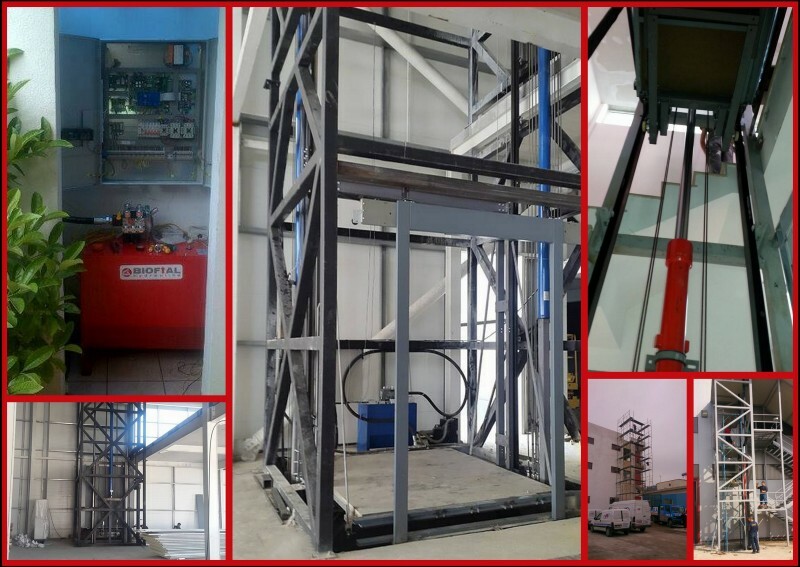 This installation has been made by our main cooperator in the area, LIPRO ENGINEERING b.v. and it is a 2:1 suspension hydraulic lift, operating with electronic valve power unit. In this case we have undertaken a project in one of Europe’s most competitive markets and have already produced several hydraulic scissor platforms for a well-known supermarket chain in Europe. Those hydraulic scissor platforms for cargo loading had to be designed individual for each installation under very strict regulations and our Romanian cooperator is installing them with ease, due to the ergonomic construction of our products. This application might seem like a simple hydraulic compact cargo platform, but there is more than meets the eye. It is used for the transport of freight containers via conveyor automatically. The elevator control system is specially designed so that the automation process communicates with the elevator controls. Via Modbus / TCP this elevator receives commands such as to reach a desired stopping point. Moreover, the process receives continuous feedback on the position of the elevator and its status so that the lift can be displayed and controlled through its software program. 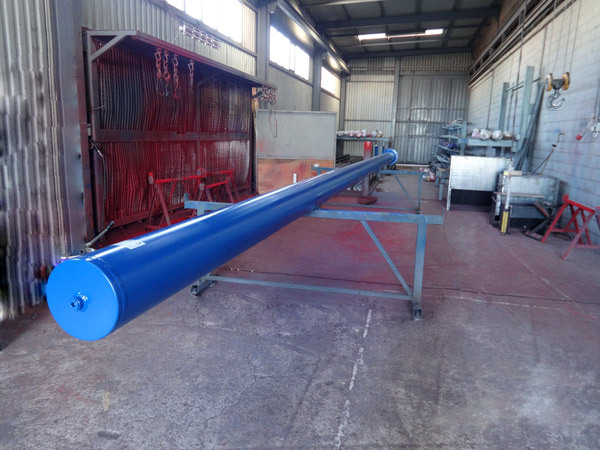 This version has a capacity of 2800 kg and the course of the BIOFIAL HYDRAULICS 3-stage telescopic cylinder is over seven meters. The BIOFIAL HYDRAULICS power unit operates with an EV4 Blain block of valves and this specific cargo platform is being used for the transport of containers. Another customized project that was undertaken by our client LIPRO ENGINEERING b.v. 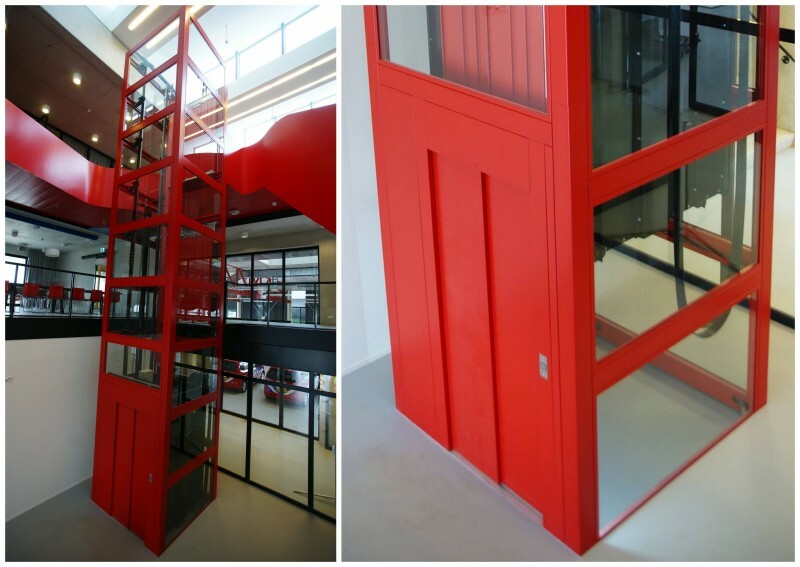 Yet another special project that was implemented in Netherlands is this one located in Sittard’s state fire station. As the pit of this elevator was only 15cm in height and a sleek glass shaft was to be installed, a meticulous attention to the esthetics of the whole project had to be considered. Also, this hydraulic passenger lift features a very quiet and energy-efficient hydraulic drive with frequency control. Moreover, this control provides continuous monitoring over the internet, which is significantly more efficient when the maintenance inspection is performed. It is a 2:1 suspension hydraulic lift, a special project that was also undertaken by our client LIPRO ENGINEERING b.v. in Netherlands. Besides the top quality hydraulic cylinders and the power units that BIOFIAL HYDRAULICS produces, our customized car frames are beyond comparison. And that is the reason that one of our numerous customers in Albania, LIFTECH Sh.P.K., has installed many throughout this territory. These car frames were custom made and specially designed for each installation by BIOFIAL HYDRAULICS, according to the specifications of the each project. One of the numerous hydraulic application that is in high demand at the moment in India is implemented by the use of BIOFIAL HYDRAULICS cylinders and power units. These kind of projects require specialized cylinders that can handle such loads and operate in precision with the whole construction. 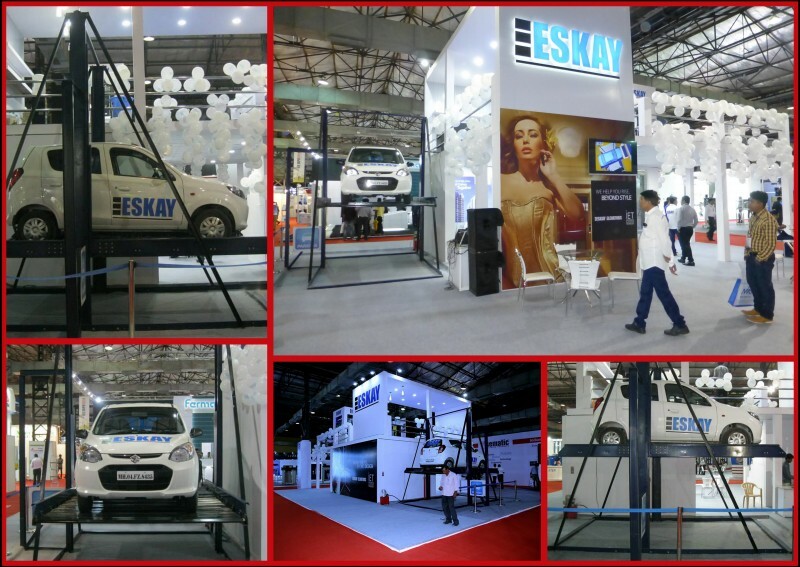 One of our greatest cooperator in the Eastern market, ESKAY ELEVATORS has been constructing such systems and has been showcasing them in the IEE EXPO 2014 MUMBAI fair. In the past 6 months, our export department has been noticing an interesting tendency in the Eastern Countries area. To be more precise, the Indian market and the Arabic Golf countries have increased their demand in BIOFIAL HYDRAULICS products more than 250% in these two trimesters. As a result, every other week we are having deliveries, usually of mass production of orders and therefore collective and combined exports to those two oversea areas. 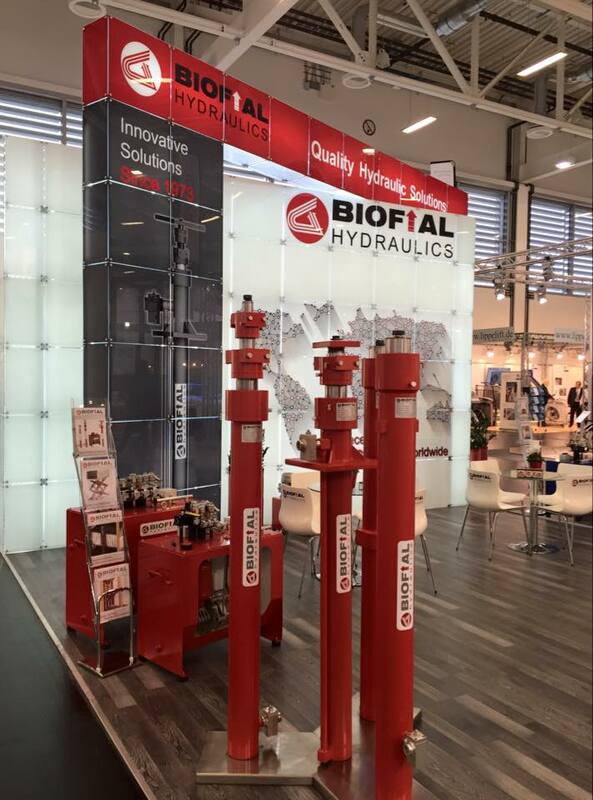 BIOFIAL HYDRAULICS products have entered these markets in the three years very intensely and the company itself has established its brand awareness even to the final consumers, by undertaking projects that require demanding and thorough planning, as well as impeccable manufacturing knowledge. We strongly believe that this rise in the demand will continue to flourish, enabling BIOFIAL HYDRAULICS to be considered as a top supplier in those regions. 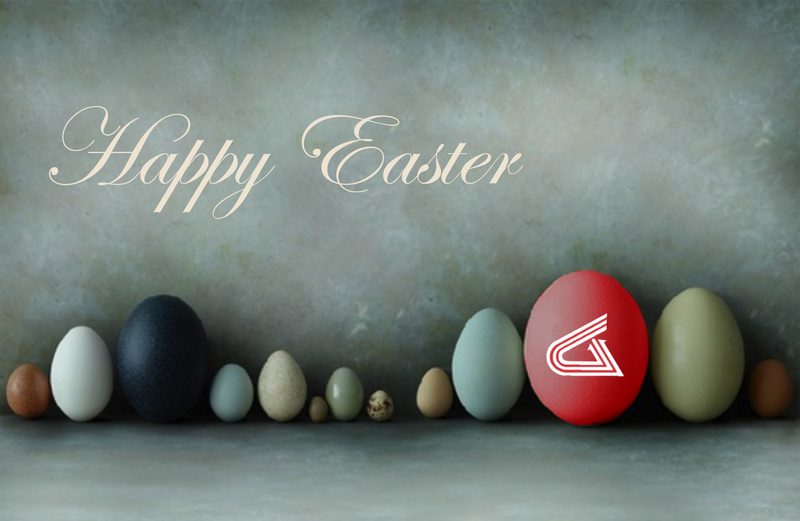 We would like to inform you that, as we do every year, our production department will be closed due to the Christmas-New Year Holidays, for the period from 24.12.2014 till 05.01.2015. In case you have any pending orders which you would like to be delivered until 22.12.14, we are kindly asking you to contact BIOFIAL HYDRAULICS production department soon. For anything additional we shall remain in your disposal, as always. Thank you for the cooperation so far! Wir möchten Ihnen informieren, daß, wie wir jedes Jahr, unser Unternehmen aufgrund der Weihnachtsferien geschlossen werden, für den Zeitraum vom 24.12.2014 bis 05.01.2015. Falls Sie alle ausstehenden Bestellungen, die Sie möchten bis 22.12.14 geliefert werden müssten, wir bitten Sie um die BIOFIAL Produktion zu kontaktieren. Für alles weitere werden wir in Ihnen unverändert zur Verfügung, wie immer. Vielen Dank für die Zusammenarbeit soweit! Bilginiz olsun ki, her yıl olduğu gibi bu yıl da 24.12.2014 yukari 05.01.2015 tarihleri Noel tatili nedeniyle şirketimizin geçici olarak faaliyetini durduracaktır. Bekleyen emirler 22.12.14 tarihine kadar sevk etmemizi istediğiniz her hangi siparişiniz var ise, lütfen imalat departmanı ile irtibata geçiniz. Icin ek bir şey her zaman olduğu gibi, bertaraf kalacaktir. Şimdiye kadar işbirliği icin teşekkür ederiz! Vi informiamo che la chiusura annuale per le vacanze di Natale sarà effettuata dal 24.12.2014 al 05.01.2015. Nel caso in cui avete ordini in attesa del quale si desidera essere consegnati fino al 22.12.14, stiamo chiedendo gentilmente di contattare il perarto di produzione. Per ulterior nulla ci rimane in vostra disposizione, come sempre. Ιt is always essential for BIOFIAL HYDRAULICS to keep in line with all the consecutive changes that happen in the field of hydraulics. Also, we follow our customers’ needs that require complete quality hydraulic solutions for every possible application and we adopt to their feedback. Furthermore, we indulge our demand for cutting edge innovation, high expertise and new product development. Under this scope, we have advanced our R&D department with new, but highly experienced personnel. 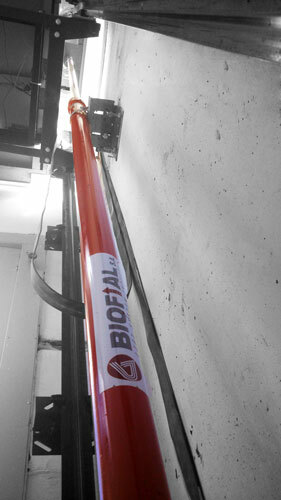 As a result, now we can reach even further our product range and expand the BIOFIAL HYDRAULICS brand to new activities. Knowing that our products are showcased at some of the most demanding markets internationally makes us feel proud and appreciative of the collaborations that we have developed over the years, even more when our customers present our products to their forwarding activities. 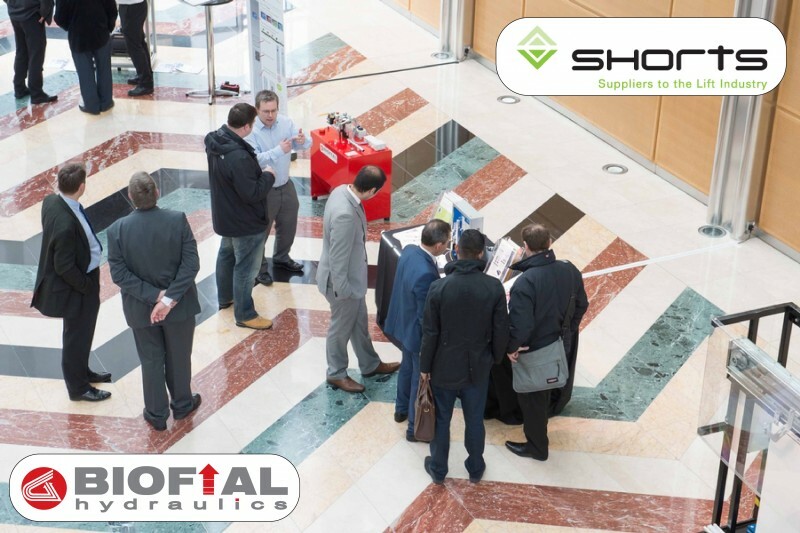 In this occasion a strategic partner of BIOFIAL HYDRAULICS that has grown to be a key cooperative in the northern Europe, SHORTS INDUSTRIES LTD has included our power units to present the renovation work that they do in UK territory. Having to refurnish a hydraulic elevator, so as to achieve higher efficiency and lower energy consumption, is a tricky operation that demands experience, knowhow, trustability and premium quality, that both BIOFIAL HYDRAULICS and SHORT INDUSTRIES require. In the two demonstrating events of SHORTS’ for 2014, the Shorts London Open Day (Canary Wharf 19.03.14) and the Shorts Northern Open Day “Tour de Shorts” (Bradford 25.06.14), BIOFIAL HYDRAULICS was present: our power unit range for the refurbishment market, has been showcased, attracting the visitors attention. We would like to inform you that, as we do every year, our company will be closed due to the summer holiday, for the period from 02.08.14 up to 17.08.14. In case you have any pending orders which you would like to be delivered until 01.08.14, we are kindly asking you to contact the BIOFIAL HYDRAULICS production department as soon as possible in order to make all the necessary arrangements. We wish you a happy and relaxing summer! Θα θέλαμε να σας ενημερώσουμε ότι, όπως κάθε χρόνο, η εταιρία θα παραμείνει κλειστή λόγω των καθιερωμένων καλοκαιρινών διακοπών, για την περίοδο από 02.08.14 ως και 17.08.14. Σε περίπτωση, λοιπόν, που επιθυμείτε να σας παραδοθούν παραγγελίες έως τις 01.08.14, σας παρακαλούμε να επικοινωνήσετε άμεσα με το τμήμα παραγωγής. Για οτιδήποτε περαιτέρω παραμένουμε στην διάθεση σας. Σας ευχαριστούμε για την μέχρι τώρα συνεργασία και σας ευχόμαστε καλό καλοκαίρι! Wir moechten Ihnen mitteilen, dass unser Bertrieb vom 02.08.14 zum 17.08.14 infolge Betriebsferien geschlossen ist. In Fall mussen Sie alle ausstehenden Bestellungen, die Sie mochten, bis 01.08.14 geliefert, wir bitten Sie um die Produktion zu kontaktieren. Vielen Dank fur die Zusammenarbeit! Wir wunschen Ihnen einen erholsamen Sommer! Bilginiz olsun ki, her yıl olduğu gibi bu yıl da 02 – 17 Ağustos 2014 tarihleri arasında yaz tatili nedeniyle şirketimizin geçici olarak faaliyetini durduracaktır. Eger 01.08.14 tarihine kadar sevk etmemizi istediğiniz her hangi siparişiniz var ise, lütfen imalat departmanı ile irtibata geçiniz. Her birinize hayırlı tatiller dileriz. Если у вас есть какие то заказы в ожидании, которые вы хотели чтобы они были поставлены до 01.08.14, мы любезно просим Вас связаться с отделом производства. Мы желаем Вам хорошого отдыха. Spett.le Ditta,Vi informiamo che la chiusura annuale per ferie sarà effettuata dal 02.08.14 al 17.08.14 (compresi). Nel caso in cui avete ordini in attesa del quale si desidera essere consegnati fino al 01.08.14, stiamo chiedendo gentilmente di contattare il perarto di produzione. Vi auguriamo un estate rilassante! 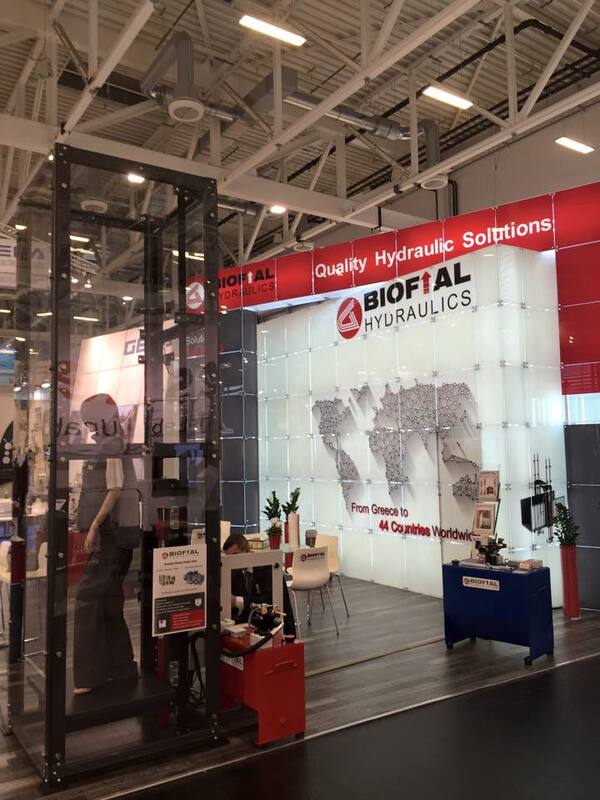 It has always been one of BIOFIAL HYDRAULICS’ strategic decisions to introduce our high quality products to new markets and establish long lasting collaborations with leading companies all over the world. 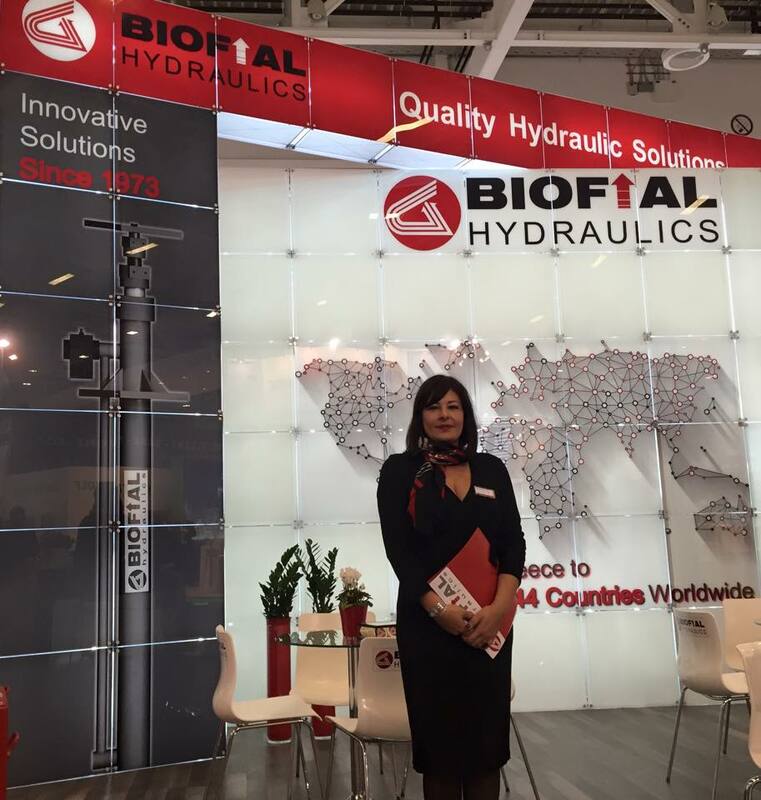 Having extended our range of products and launched superior complete hydraulic solutions for almost every industrial application, our aim is to expand our international supply chain and make known globally the BIOFIAL HYDRAULICS brand. For our team, entering a new market means persistence, careful planning and intent understanding if every market’s demand and differentiation. This is something that BIOFIAL HYDRAULICS people knows well, having exported its products more than 20 years, directly to 30 countries and through its cooperators to all 7 continents. 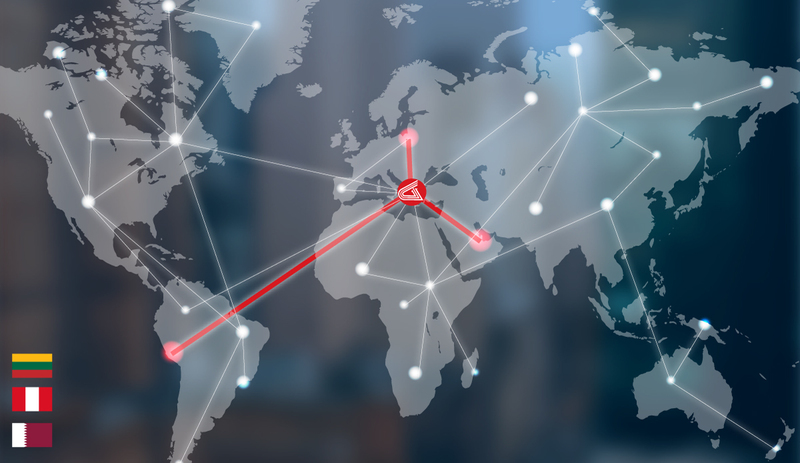 Thus, today we are proud to announce that four new markets, Kuwait, Hungary, United Arabic Emirates and Kosovo have been added to our directly exported markets as a result of our premium product quality, our reliability and our expertise. 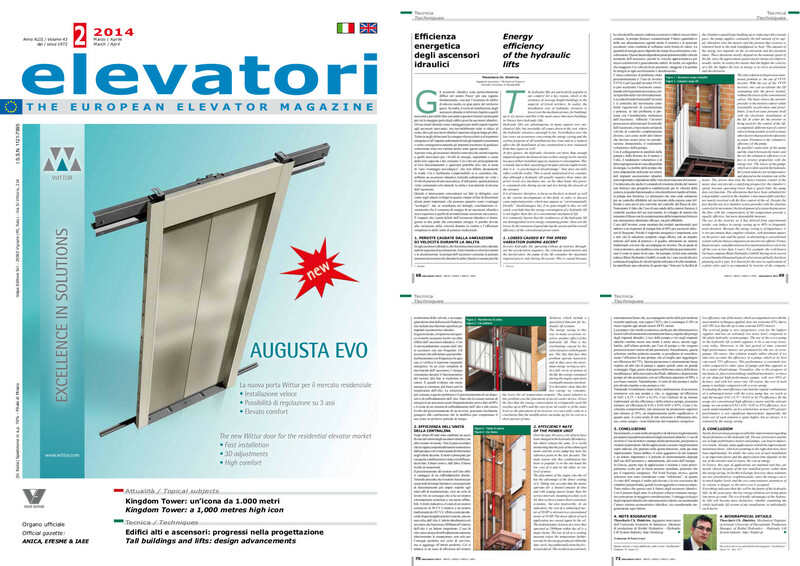 One more publication from the scientific personnel of BIOFIAL HYDRAULICS, in one of the most reknown magazine of the lift industry in Europe, ELEVATORI magazine in Italy. The following link shows the article as it was published in both italian and english. BIOFIAL HYDRAULICS brand name may be linked with the manufacture of high quality hydraulic cylinders, that can operate in any hydraulic lift applications, but it is not the only product that stands out in its commodities. The BIOFIAL HYDRAULICS power units are one of those. The company has been producing high efficiency power units for more than 20 years. Having gained the valuable knowhow and expertise through this course of years has had a huge impact in company’s production line. Their block of valves are from the prominent German company BLAIN, that has decades of experience in the production of top quality valves. All the other power unit’s accessories, such as the ball-valves, the hand pumps and the lock-valves are original BLAIN components and not imitation or no-name products. Thermostats for low and high temperature are included. They have exceptional product robustness with thick metal sheet. Ergonomic design that offers ease during maintenance. Having a power unit that is complete with original components from globally known brands, is a factor that not many companies in the world can boast about and if the economical aspect is also taken into account there is no room for comparison. BIOFIAL HYDRAULICS believes that the power units are essential to any hydraulic lift project and thus, insures that they are fully equipped to operate with ultimate safety and consequence. All the above points are not just stated, they are fulfilled in every product that we manufacture and we challenge you to discover it. As we were wandering from time to time, where else could the custom-made cylinders and power units of BIOFIAL HYDRAULICS been used, a long-lasting cooperator of us send us the below photos, where a new hydraulic application of our qualitative products is introduced. BIOFIAL HYDRAULICS cylinders and power units are being included in the construction of a completely mobile concrete mixer system, manufactured by the global known brand “NISBAU GMBH” in Germany. Their model EUROMIX 60 is ideally suited for frequent changes of location, providing a perfect entry-level option with an output of 60 M3/H. 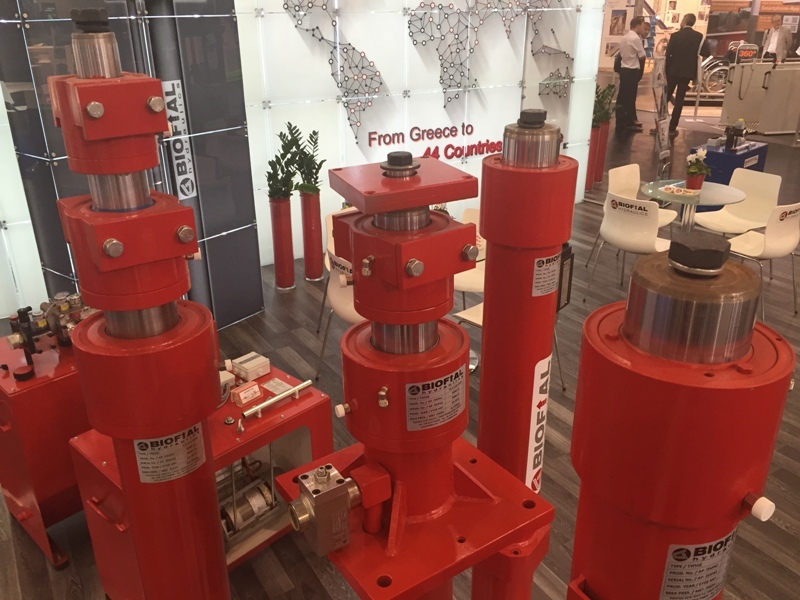 The hydraulic cylinders and power units that BIOFIAL HYDRAULICS produces are ideal for this kind of constructions, due to their robustness, their zero-leakage tolerance and their unique technical and mechanical characteristics. As a company that produces custom-made construction applications for more than 40 year, we feel obligated to support by any way possible the construction industry and their novelty projects with products that can cope in such heavy load implements. That is one of the reasons that one can find BIOFIAL HYDRAULICS products in every step of the construction process. BIOFIAL HYDRAULICS is always fascinated by new and demanding projects that require careful planning and intensive design, thus this recent request that we have undertake. Our goal this time was to manufacture a hydraulic cylinder of 10 meters length in one piece specifically made for a public inclined tramway installation here in Greece, required in a canyon located in Crete. This was a project that required meticulous planning from the first step. Having in stock raw material in suitable diameters and in 10m lengths, is an issue that only a couple of industries in the field can have. BIOFIAL HYDRAULICS indeed possesses an inventory that can cope in such high demands. Also processing such a cylinder is something that needs proper industrial machinery and flawless technical planning, something that we are known for, throughout the years. Last but not least, the personnel that handles those projects is required to be familiar with such challenging constructions, in order to achieve top quality products. It took us just one week from receiving the order to having the hydraulic cylinder ready for collection. This reflects the commitment that BIOFIAL HYDRAULICS has to its customers and the determination of its personnel to high quality products in demanding projects. 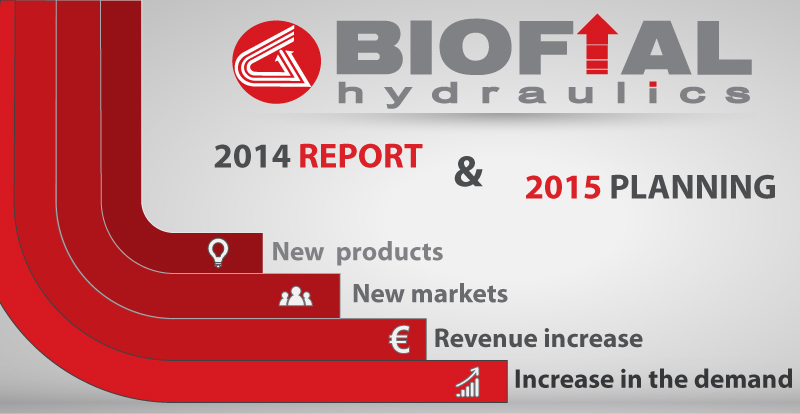 At the beginning of 2013 BIOFIAL HYDRAULICS launched its newest addition to the product series that already existed in its catalogues. The BIOFIAL Hydraulic Car Frame concluded the set for complete hydraulic set for passenger elevators. The BIOFIAL Compact Cargo Lifts, the Car Platforms and last but not least, the Scissor Lift Platforms offer to our worldwide customers qualitative complete solutions for all hydraulic applications. 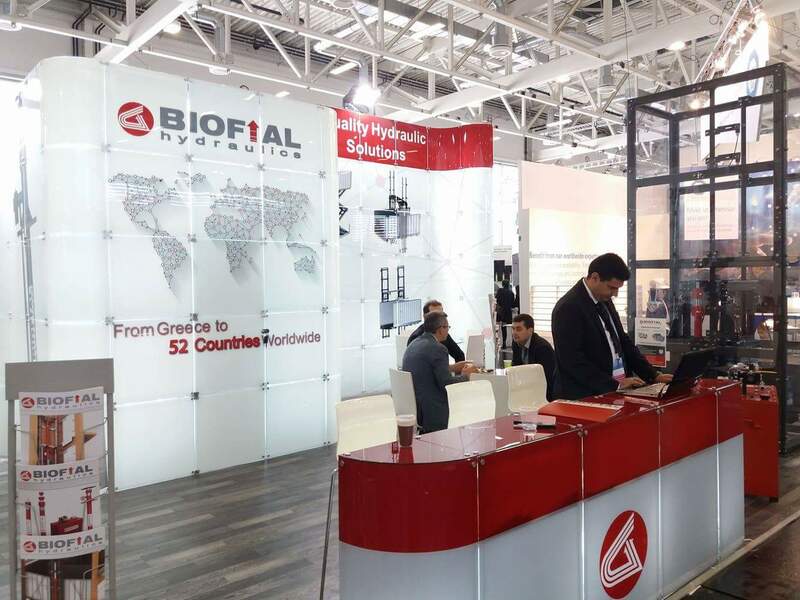 At a time of distrust towards the Greek companies, BIOFIAL HYDRAULICS through its consistency, its strategic commitment to extroversion and mainly its qualitative products and its superb services, managed to enter into 4 new markets worldwide. These new markets are Poland, Romania, Oman and across the Atlantic, Brazil. Getting into these markets was a goal, but maintaining them is both a challenge and a promise that BIOFIAL HYDRAULICS is more than willing to make. Trying to reinforce the brand name BIOFIAL HYDRAYLICS through web campaigns and other miscellaneous projects, achieved the introduction to new countries as mentioned above. But those actions also served as the means to convey many more cooperations in the existing 23 markets worldwide, grow a more uniform and thorough company profile and engage strategic partnerships with the most well known companies of their regions. 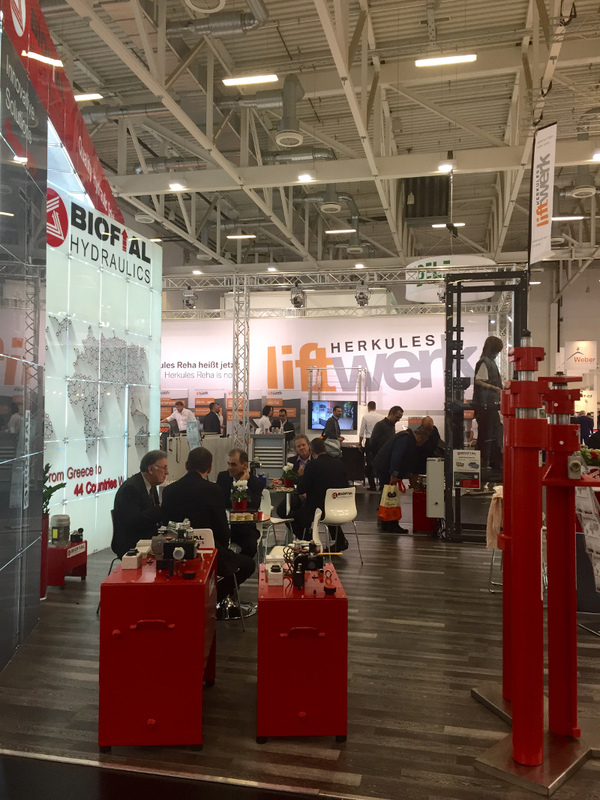 BIOFIAL HYDRAULICS stayed true to its commitment and participated at the top international lift exhibition INTERLIFT 2013 that took place in October at the Augsburg, Germany. The success of this participation was beyond our most optimistic expectations. BIOFIAL HYDRAULICS celebrated its 40th year of nonstop operation this November. In that note and also because staying up to date with the products only was not totally satisfying, we wanted to make a small “face-lift” of the company’s image. So, we began from our logo and expanded this renovation to our webpage and social media presence, with very rewarding outcome. Despite the “grey economical environment” BIOFIAL HYDRAULICS invested in the “green energy” of photovoltaic. Wanting to improve the ecological imprint of the industry, BIOFIAL invested more than 150.000€ in the PV energy. It is a necessity for the hydraulic industry to be up to date with the latest machinery and the engineering breakthroughs that occur. For that reason BIOFIAL renewed some of its machinery with the latest in the market, so as to be able to serve every need of its customers. Closing the retrospective of the year that has pasted, we want to thank once more, our customers, old and new ones, for their 40-years-old trust and preference. We value our cooperations and committee ourselves that with hard work, with perseverance and with direct and open communication, we can build an even stronger collaboration of mutual benefit. We also want to thank all our outdoor and indoor suppliers that have supported us in every way and all our cooperators and friends that with their attitude made business a pleasure. 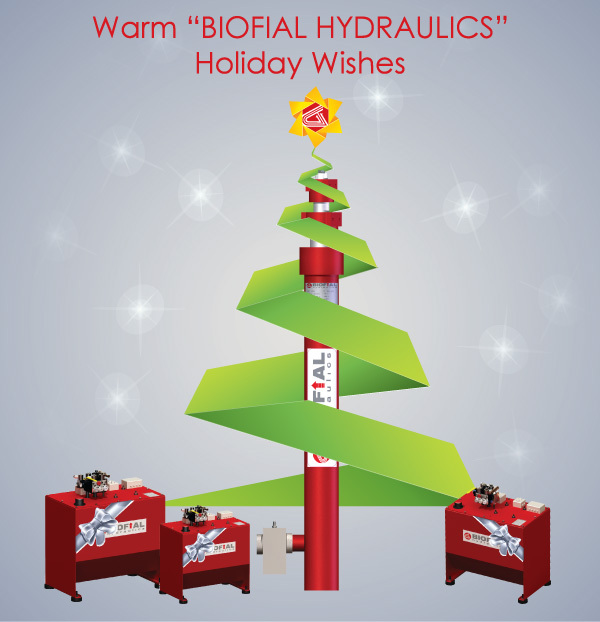 Last but not least, we warmly thank all the BIOFIAL HYDRAULICS’ people that gave their best self in order to manage in a difficult year, to overcome any problems and to assist all our customers in the best possible way and always with a friendly and direct manner. There are many plans and many new ideas for 2014. 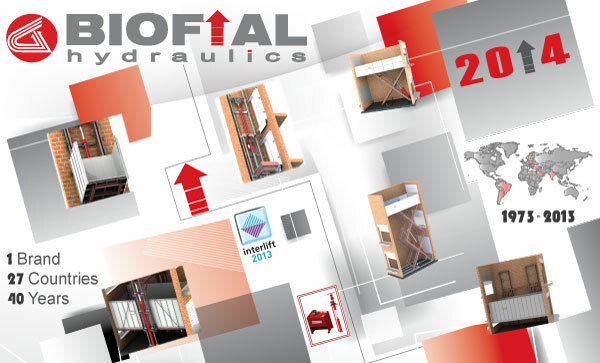 BIOFIAL HYDRAULICS is certainly looking forward a prosperous 2014, filled with new ventures, new connections across the globe and lots of successful business stories. The hydraulic lifts are particularly popular in our country for a key reason, which is the existence of average height buildings in the majority of Greek territory. In reality, the installation cost of hydraulic elevators is lower over the mechanical ones, for buildings up to six storeys and this is the main cause that most buildings in Greece have hydraulic lifts. Hydraulic lifts are advantageous in many aspects over mechanical lifts, but inevitably all comes down to the cost, where the hydraulic elevators outweigh by far. 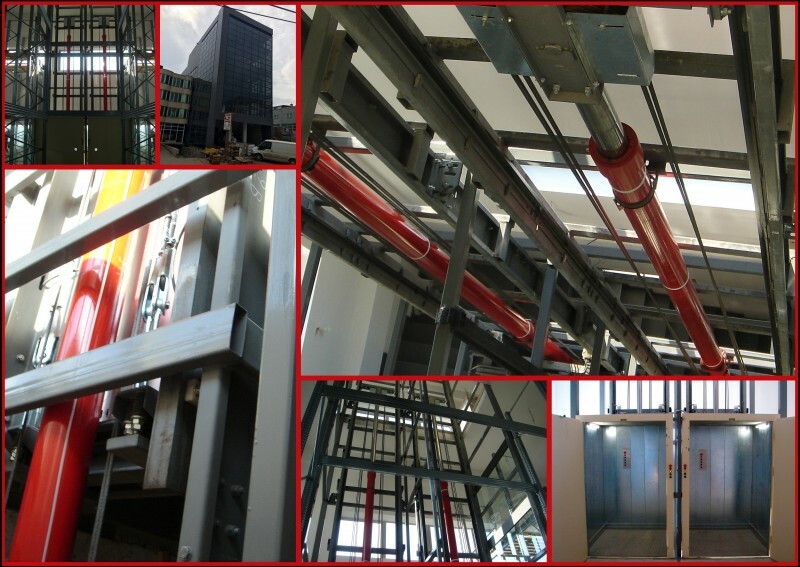 Nevertheless over the last years an awareness concerning the energy saving and the carbon footprint of all installations has risen and as a natural effect the lift installation of any construction is now evaluated from that aspect as well. 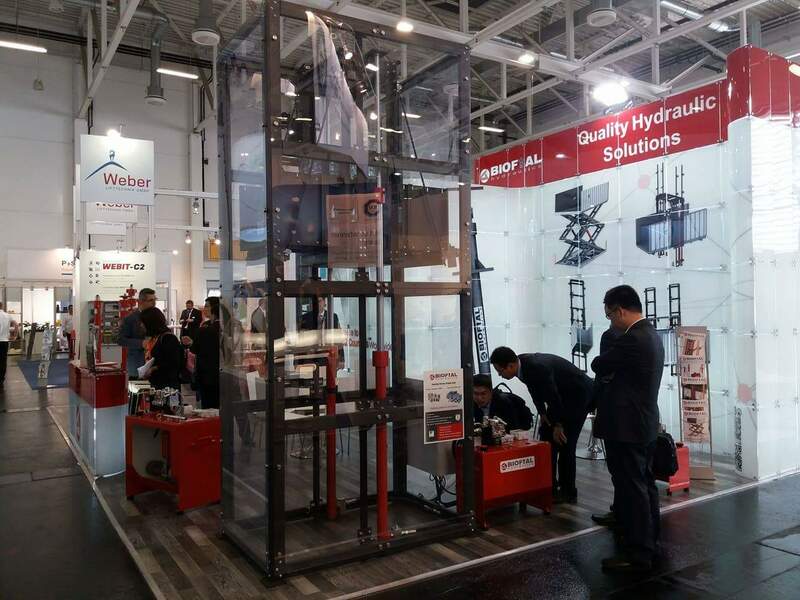 At first glance, the hydraulic elevators are more than enough impaired against mechanical ones at their energy levels, mainly because of their installed capacity and power consumption. This is mainly due to their operating principals and one might invoke that it is “a psychological disadvantage” that does not fully reflect with the reality. This is easily understood if we consider that although a hydraulic lift usually requires three times the power levels of a mechanic one, on the other hand, this power is consumed only during ascent and not during the descent of the elevator. Is of interest, therefore, to focus on the facts in detail, as well as the current developments in this field, in order to discern some important points, which may appear as “environmentally friendly” disadvantages, but, if we gain insight to this, we will surely conclude that the energy consumption of a hydraulic lift is not higher than this of a conventional mechanical lift. 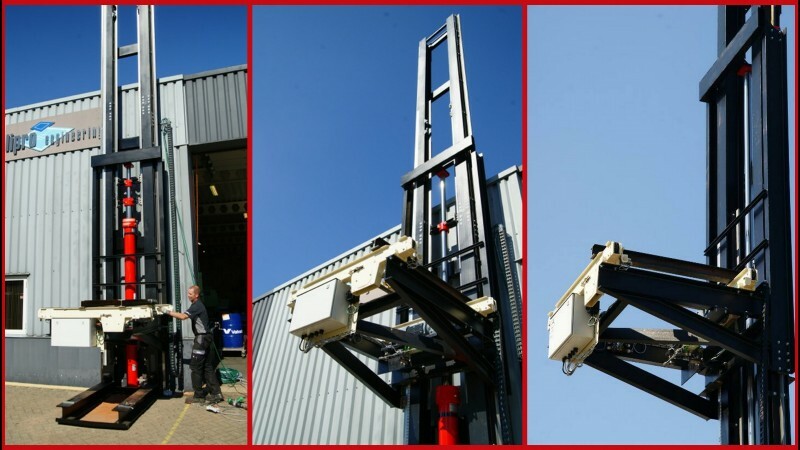 It is commonly known that the weaknesses of the hydraulic lift are distinguished in two energy consuming points: These are the losses by the variation of speed during the ascent and the overall efficiency of the conventional power units. Α. Losses caused by the speed variation during ascent. In every hydraulic lift, operating without an inverter, throughout the acceleration sequence, the constant velocity motion and the deceleration, the pump of the lift consumes the maximum required power only during the ascent. This is caused because the chambers velocity keeps building up or reducing with a steady pace, the pump supplies constantly the full amount of its supply (therefore also the motor) and the portion that excesses is returned back to the tank transfigured as heat. The amount of the energy lost depends on the acceleration and deceleration times. These durations are mostly depended on the nominal speed of the lift, since the approximate speed rate for means of comfort is usually stable. In reality this means that the higher the velocity of a lift, the higher the loss in energy is in every acceleration and deceleration. The only solution to the previous mentioned problem is: the use of VVVF inverter. With the use of the VVVF inverter, one can accelerate the lift consuming only the power needed, without the losses of the conventional valves. The basic choice the inverter provides is the motion control within reasonable acceleration and power limits, if such an issue presents itself with the electronic installation of the lift. In order for the inverter to being used for the control of the lift, a completely different type of control valve is being needed, as well as many other factors that need to be taken into account. Foremost is the volumetric efficiency of the pump. By parallel connection of the pump and the clutch between the motor and the oil, the volumetric efficiency is in fact in reverse proportion with the energy loss. The losses of the pumps which are widely used in the hydraulic lift system industry are of importance and depend on the rotation rate of the motor. This proves that even the direct rotation control of the motor does not provide a satisfying prospect for the chamber’s speed, because operating lower than a speed limit, the pump does not function. The alterations that have been submitted for a dependable control in the chamber’s movement differ and they are mostly involved with the flow control of the oil. Despite the fact that the use of a chamber sensor provides with the absolute control of its movement, the development of systems that measure the flow with the compensation of the temperature provide a equally effective, but more dependable measure. The use of the inverter, as it has derived from experimental results, can induce in energy saving up to 60% in frequently used elevators. Because the energy saving is of importance, it is not uncommon that complete solution, with minimum impact on the power unit and the panel, in alternating a conventional system with one that accompanies an inverter are offered. From a financial spec, a modification such as mentioned above can write off the cost in less than 3 years. For example, the well known German company Blain Hydraulics GmbH, having on its record several hundred thousand typical valves in use globally, has been planning such a type. It is known for the ease in replacement of a plain valve and is accompanied by inverter of the company Yaskawa, which include a specialized function for hydraulic lift systems. The energy saving in this way in many occasions resolves another effect of the hydraulic lift. That is the overheating caused by the oil in elevators with frequent use. The lifts that face that problem operate massively and in that cases the maximum energy saving occurs. In a full circle of motion of the lift, the energy consumed during the engine operation eventually mutates into heat. It is therefore clear that the less energy we consume, the lower the oil temperature remains. The usual solution to this problem was the placement of an oil-cooler device. Given the fact that the energy conservation in a frequently used lift reaches up to 60% and the cost of an oil-cooler is of the same level as the placement of an inverter, we can easily come to a conclusion that the modification can make up for its cost in a short period of time. Over the past 40 years a lot of facts have been changed in the hydraulic lift industry, but others remain the same. It is worth mentioning that the pair of the submerged motor and the screw pump has been the reference point in the last decades. The main reason why this combination has been so popular is on the one hand the low cost of it and on the other, its low level of noise. The placement of the engine into the oil has the advantage of the direct cooling of it. Taking into account that the motor operates for a limited amount of time and with staging spaces larger than the service intervals, meaning in a duty cycle S4, then we have a motor that is extremely economic, but also trustworthy. As an indication, the cost of a submerged motor of 30 HP is relevant to a conventional motor of 10 HP. The down effects of such application are caused again by the oil. The hydrodynamic friction of a rotor that operated at 2800rpm within the oil is a major factor. The use of oil as a cooling measure raises the temperature further, not only by the energy produced within the duty circle, but additionally from the friction produced. This results in an extremely low efficiency rate of the motor, which accompanied even with the most modern techniques applied, does not overcome 82%, that is still 10% less that the up to date external EFF2 motors. The screwed pump is very inexpensive, even for the highest supplies and has an extremely low noise level, compared to the plain hydraulic system pumps. The use of the screw pump in the hydraulic lift systems appears to be a one-way-street, even today. Moreover, in the last period of time, external high performance motors are promoted for the use of screw pumps. Of course, this solution sounds rather absurd, if we take into account the efficiency of a pump, which at its best can reach 75% efficiency. This performance is extremely low when compared to other types of pumps and thus appears to be a major disadvantage. Nowadays, due to the progress of mechanical, physical metallurgy and fluid mechanics, we have at our disposal high performance pumps, with over 90% efficiency, and with low noise rate. Of course, the cost of such pump is multiple compared with a screw pump. Evaluating the total efficiency rate that the regular combination of a submerged motor with the screw pump has, we reach at tops the meager 0,82 x 0,75 = 0,615 or 61,5% efficiency. By the usage of a conventional high efficiency motor and the relevant pump, we can achieve 0,92 x 0,92 =0,85 or 85% efficiency. As is easily understandable, such a solution has at least 38% greater performance, a very significant improvement. Apparently, the total cost of such solution is quite higher, but as always, it is returned by the energy saving. Surely, there are many prospects of further improvement regarding the performance of the hydraulic lift. The use of inverters and the use of high-performance motors and pumps, can lead to impressive results. Already, many applications with all the improvements mentioned above, which are pointing to the right direction, have been implemented. No doubt, the extra cost of such installation is an important factor and the depreciation time depends on the use of the elevator and of course, the cost of energy. In Greece, this type the applications are minimal and they are mostly chosen because of the low installed power, rather than the energy saving. In Northern Europe, however, these solutions are not considered as «sophisticated», since the energy cost is in much higher levels and the eco-consciousness awareness of its citizens is deeper, so the extra cost is accepted. Everything indicates that this will be the future of the hydraulic lifts. As the years pass, the low energy solutions are being taken into more account. The eco-friendly advantages of the hydraulic lifts will became more distinctive, whether examining the whole hydraulic lift system of any installation, or individually each factor. In this link you can read the article as it was published. BIOFIAL HYDRAULICS’ first and foremost commitment is the production of high quality products which comply even with the strictest global derivatives. That is the reason why every product, before leaving our establishments to be exported in one of the 28 countries that BIOFIAL is present, is being submitted to thorough functionality and quality testing. 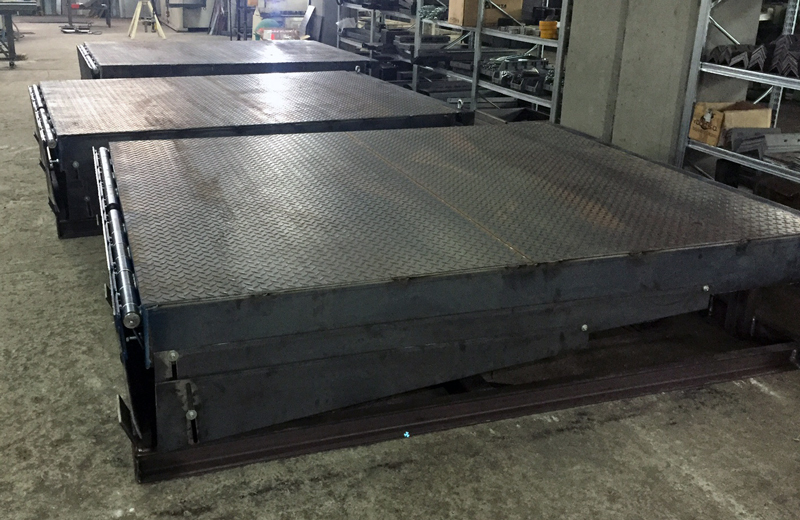 Wanting to share this experience with you, we are presenting a testing procedure of one of the BIOFIAL HYDRAULICS lift scissor platform, that can uphold with security cargo up to 2 tons weight. 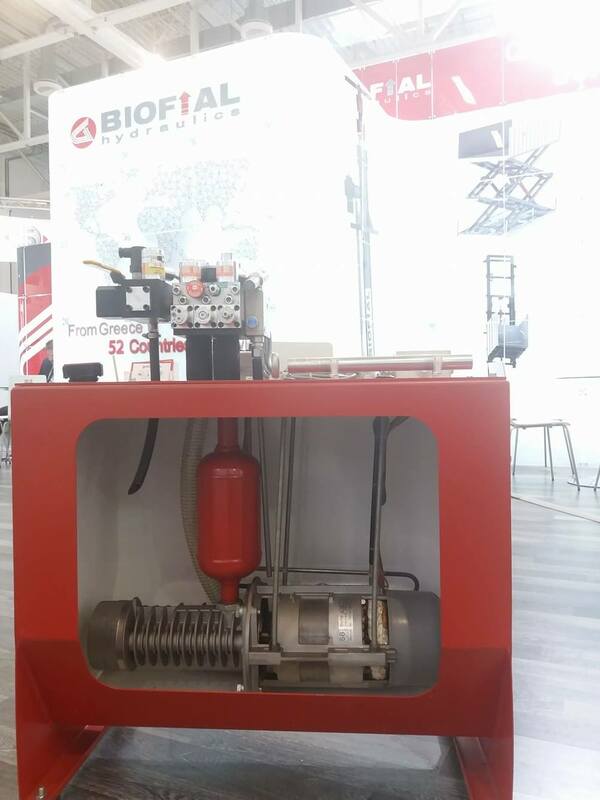 As we have been informed by our clients and cooperators, this was not the first time that the BIOFIAL HYDRAULICS products enter the Polish market as a parts of complete hydraulic lifts or other machinery. 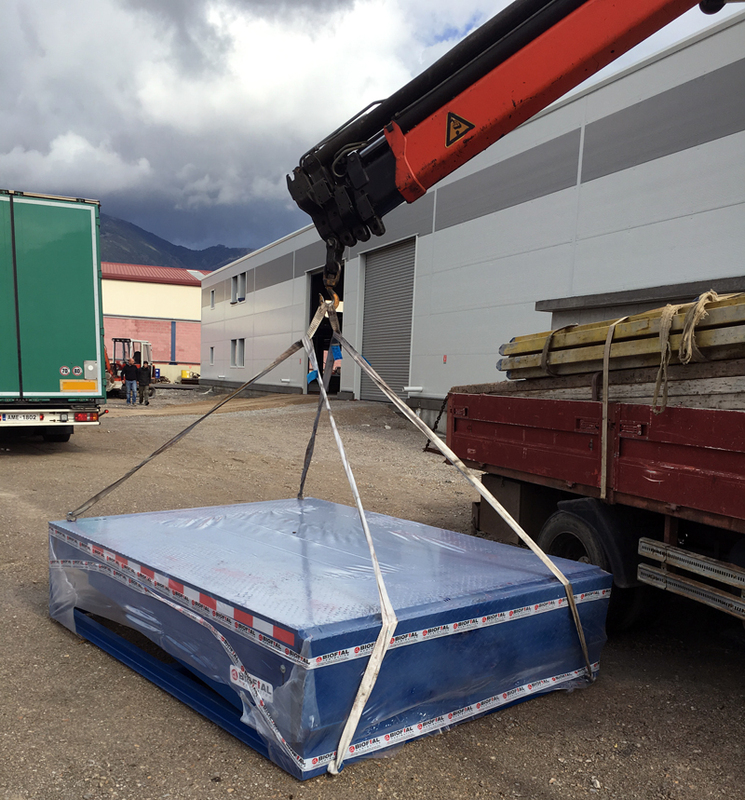 Our Greek and foreign clients have been included them for many years now, as separate parts of the their final products, mainly for the passenger or cargo lifts. But this time a complete hydraulic system has been shipped from our headquarters to reach its final destination in Poland. 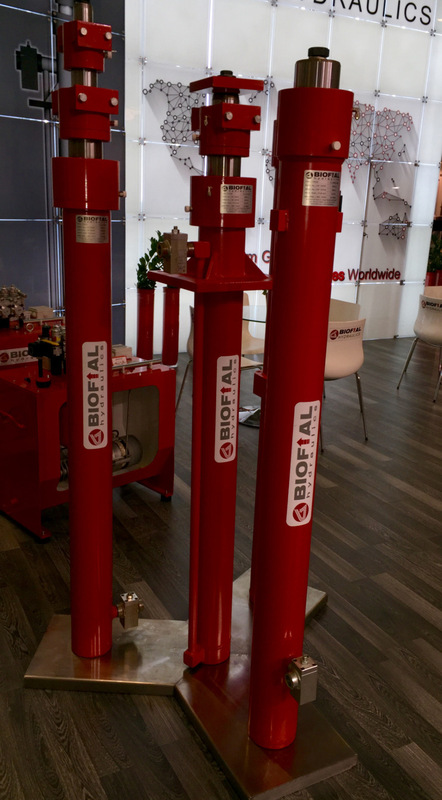 BIOFIAL HYDRAULICS has entered the Polish market not only to offer individual qualitative components of any hydraulic project, but also complete hydraulic lift solutions for any application required. 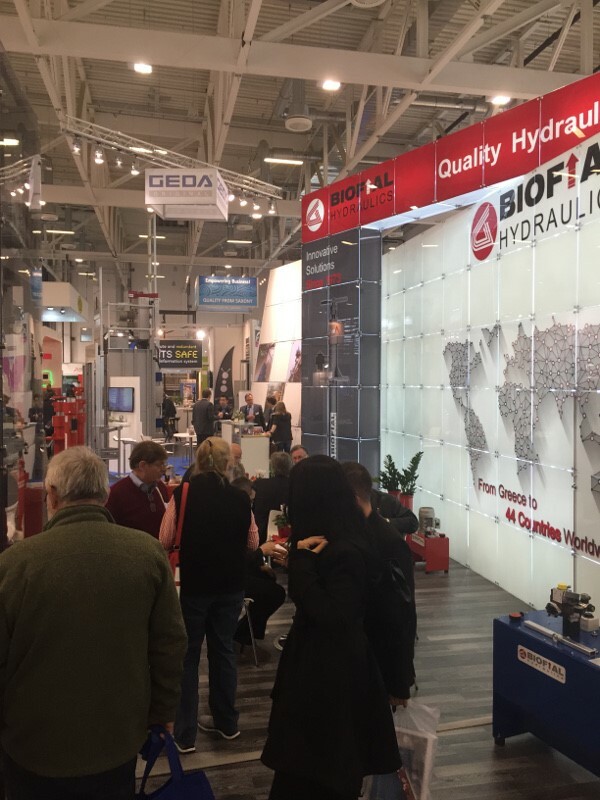 Thus we are pleased that our direct export activity to Poland testify the success of our export policy, which is the building of new strategic partnerships and the establishment of the BIOFIAL HYDRAULICS brand even further in the European Community. we thank you very much for the good collaboration so far. 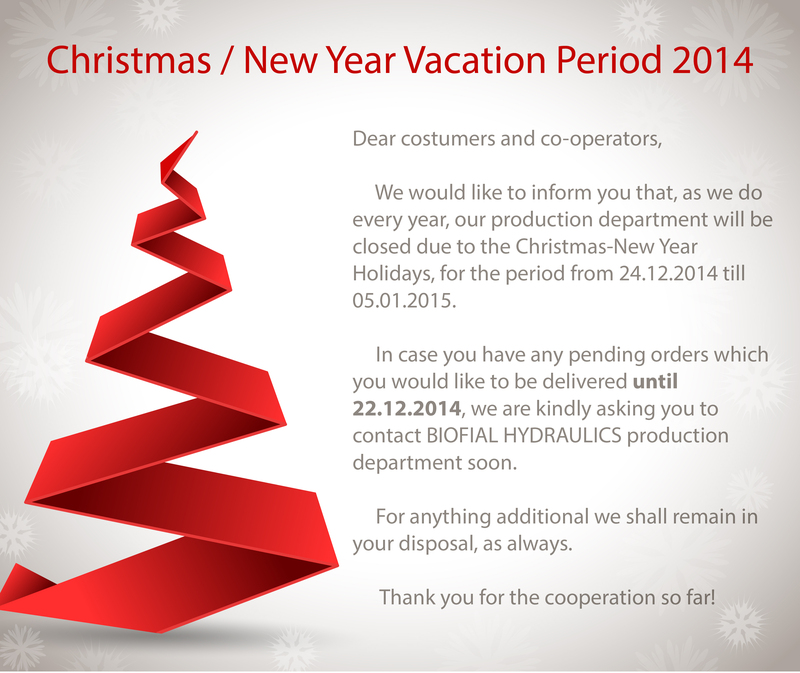 We kindly inform you that BIOFIAL HYDRAULICS will remain closed for the season holidays from 22-12-2013 till 02-01-2014. 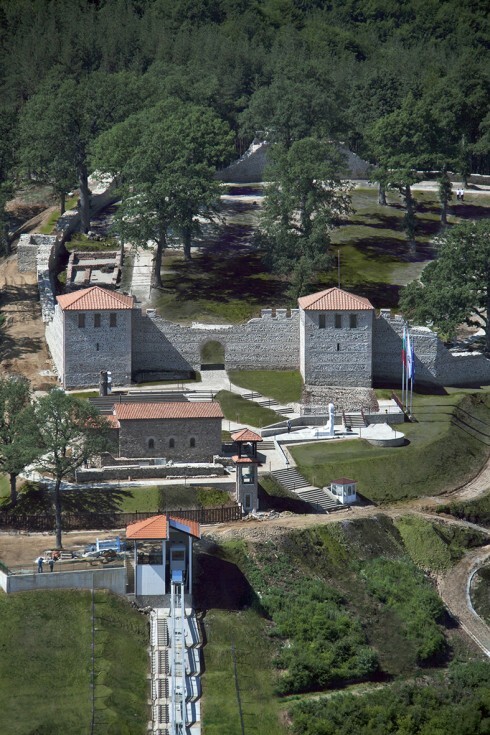 The first fully restored Roman fortress in Bulgaria in the village of Belchin near the mountain town of Samokov has opened its doors for visitors. The ribbon was cut by Regional Development Minister, Desislava Terzieva. The Mayor of Sofia, Yordanka Fandakova, who in her youth has been a teacher in Belchin, also attended the ceremony. Culture Minister, Petar Stoyanovich, and the Mayors of Belchin and Samokov were present as well. The construction of the fortress has started during the rule of Emperor Valentinian I in the 4th century AC. The location has been selected because it is strategic and allows monitoring of the entire valley and protection of its western side. The settlement itself is also related to the mineral springs, the deposits of magnetite sand and the strategic junction of two ancient roads. Until recently, the fortress has never been used by the Bulgarian State. Several years ago, archaeological excavations revealed that it was huge and covered an area of over 14 decades. 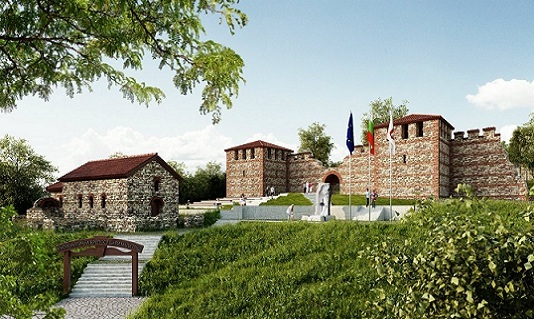 The EU funded the restoration project with BGN 5.5 M. The Tsari Mali Grad Fortress Tsari Mali Grad was chosen as Bulgaria’s most significant archeological discovery in the new millennium in Standart’s Wonders of Bulgaria referendum finale. 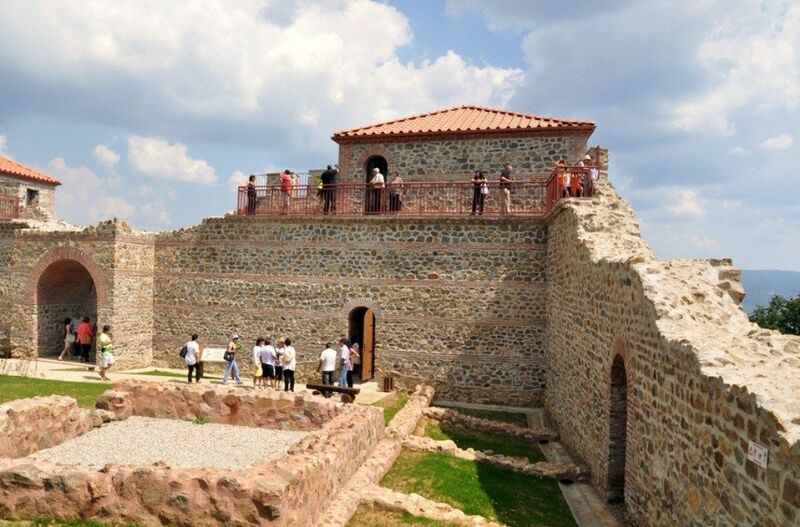 The project included the rebuilding of the fortress walls, and the construction of a museum and a church. 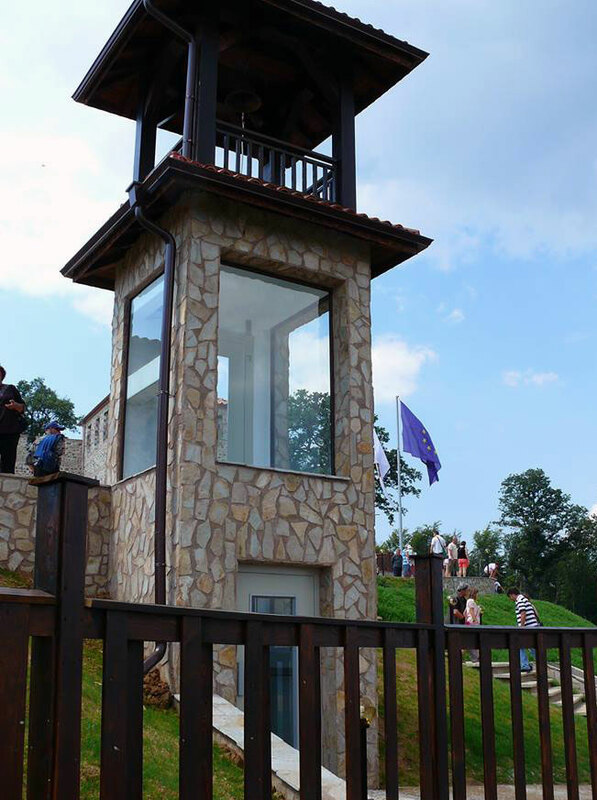 In one of the fortresses towers an elevator with BIOFIAL HYDRAULICS products was installed for the convenience of the visitors. A specials thanks to “LEONLIFT Ltd” company and personally to Mr. Milen Hazday, one of our dozen customers in Bulgaria, who has successfully undertaken this specific project and provided us all the information. We would like to inform you that, as we do every year, our production department will be closed due to the Christmas-New Year Holidays, for the period from 21-12-2013 till 01-01-2014. 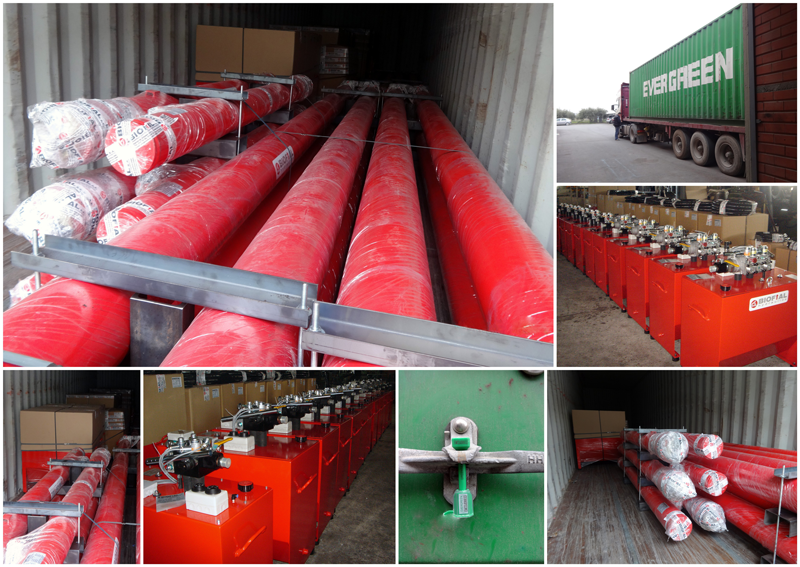 In case you have any pending orders which you would like to be delivered until 20-12-2013, we are kindly asking you to contact BIOFIAL HYDRAULICS production department soon. 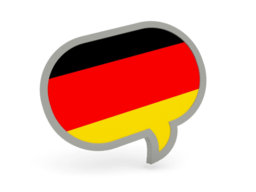 Wir möchten Ihnen informieren, daß, wie wir jedes Jahr, unser Unternehmen aufgrund der Weihnachtsferien geschlossen werden, für den Zeitraum vom 21-12-2013 bis 01-01-2014. Falls Sie alle ausstehenden Bestellungen, die Sie möchten bis 20-12-2013 geliefert werden müssten, wir bitten Sie um die BIOFIAL Produktion zu kontaktieren. Bilginiz olsun ki, her yıl olduğu gibi bu yıl da 21-12-2013 yukari 01-01-2014 tarihleri Noel tatili nedeniyle şirketimizin geçici olarak faaliyetini durduracaktır. Bekleyen emirler 20-12-2013 tarihine kadar sevk etmemizi istediğiniz her hangi siparişiniz var ise, lütfen imalat departmanı ile irtibata geçiniz. Vi informiamo che la chiusura annuale per le vacanze di Natale sarà effettuata dal 21-12-2013 al 01-01-2014. Nel caso in cui avete ordini in attesa del quale si desidera essere consegnati fino al 20-12-2013, stiamo chiedendo gentilmente di contattare il perarto di produzione. 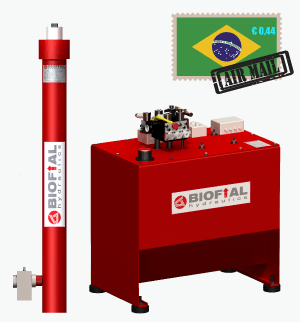 BIOFIAL HYDRAULICS has acheived a new goal by crossing the Atlantic sea once more and initiating a B2C collaboration with a well known and dominane elevator company in Brazil. By entering a new region BIOFIAL HYDRAULICS will attemp to make many new stratigic partnerships so as to strengthen its brand awarness to new nations worldwide. 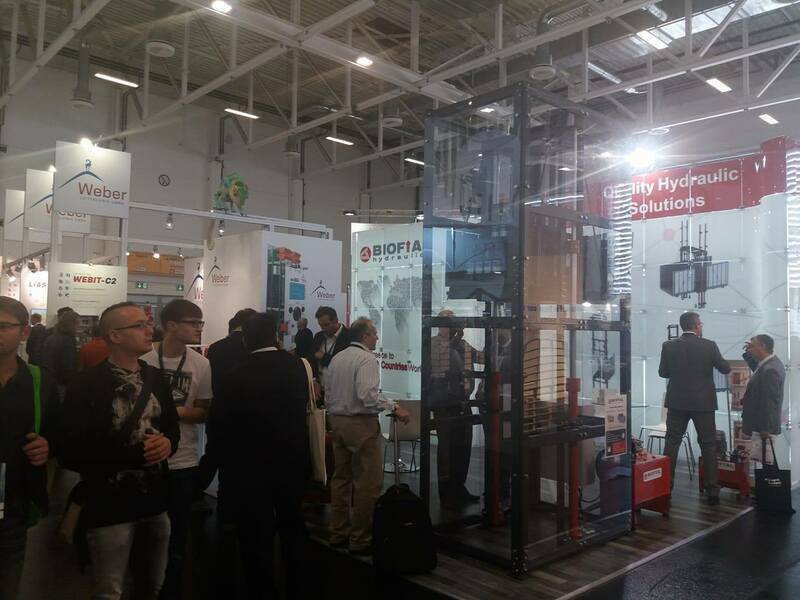 For the second time BIOFIAL HYRDAULICS has participated in Europe’s most important B2B event for the Elevator Industry, the INTERLIFT 2013 Exhibition! The participation of BIOFIAL HYRDAULICS may have been discreet, matching the company’s profile, but yet consistent, friendly and successful. 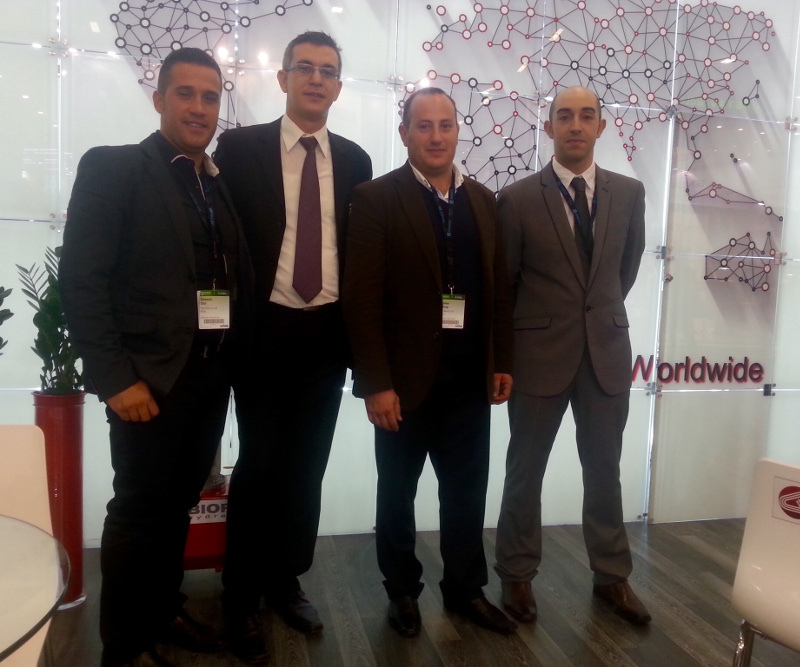 Our team has presented in INTERLIFT 2013 the new BIOFIAL HYDRAULICS products, attracting the interest of numerous international visitors and gaining lot of positive feedback. 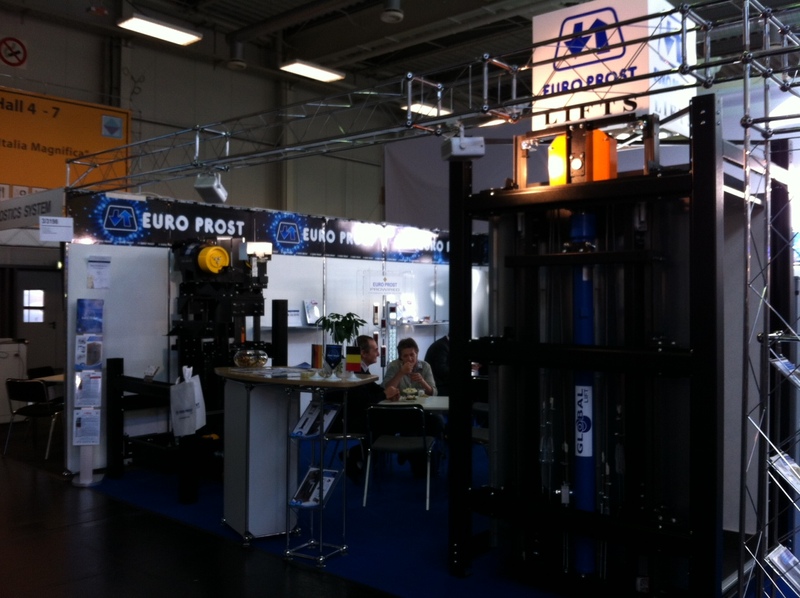 Thus, BIOFIAL HYDRAULICS would like to thank each and every one who has visited us in INTERLIFT 2013 Exhibition in Augsburg-Germany from the 15th to the 18th of October at our stand No 7154, located in hall 7. Once again the exhibition was a wonderful experience, as it gave us the opportunity to meet with companies from all over the world and discuss fresh ideas and new projects. 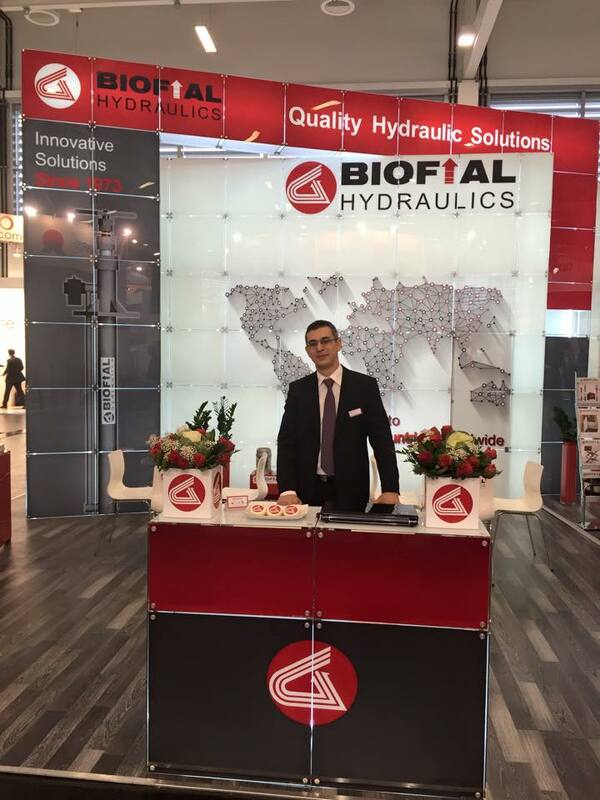 We would will to say a special thanks to all our worldwide partners, the existing and the potential ones, that honored us with their presence this year at our stand, as the personal and direct communication is always a top priority for BIOFIAL HYDRAULICS. 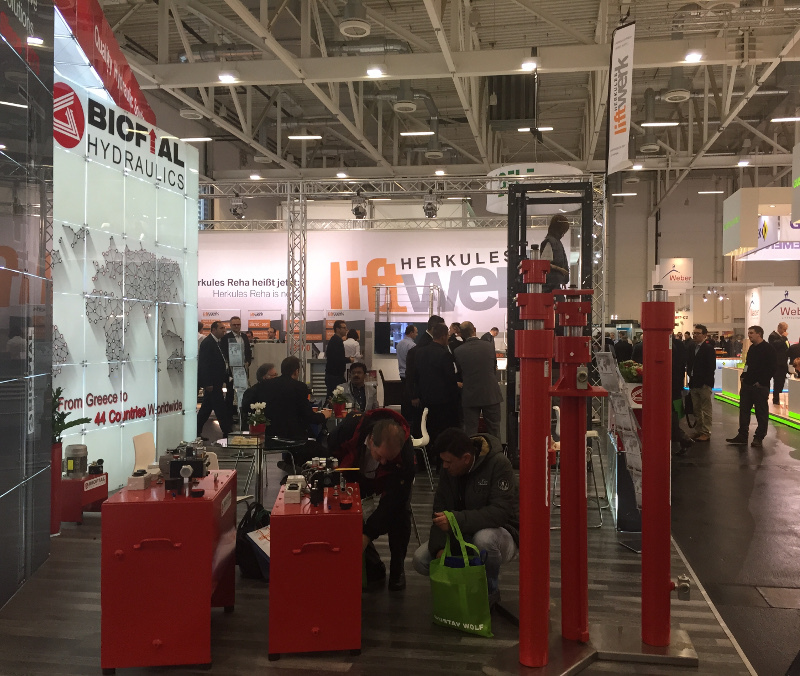 We renew our commitment to participate at the INTERLIFT 2015, but hope to see you sooner at the next big international exhibition that BIOFIAL HYDRAULICS will participate! Till then, BIOFIAL HYDRAULICS is always in your disposal to provide you with the most qualitative hydraulic lifting solutions, the most prompt and friendly assistance, along with the most competitive economical terms. 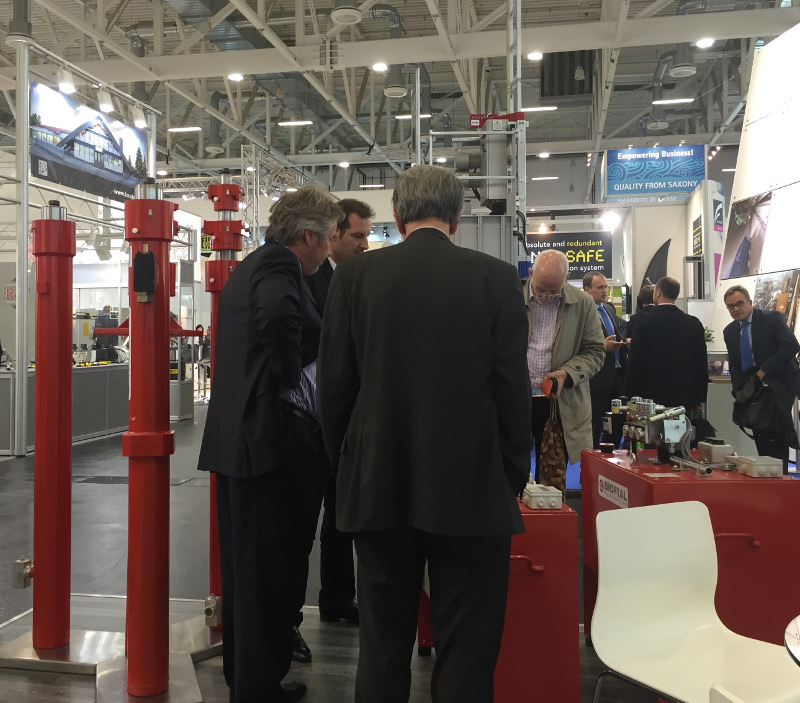 Virtual visit to BIOFIAL HYDRAULICS stand. 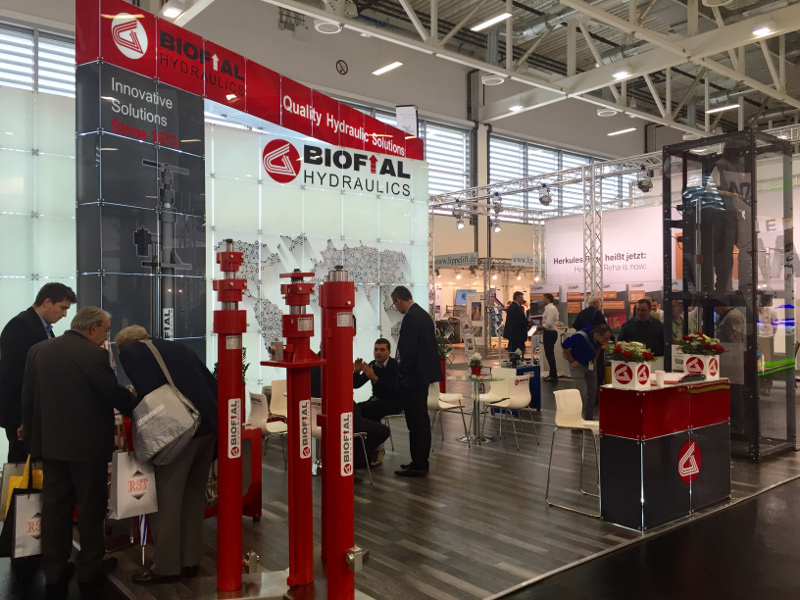 In INTELIFT 2013 Exhibition in Augsburg-Germany, the qualitative and innovated products of BIOFIAL HYDRAULICS are not only displayed in our stand (No.7154)! 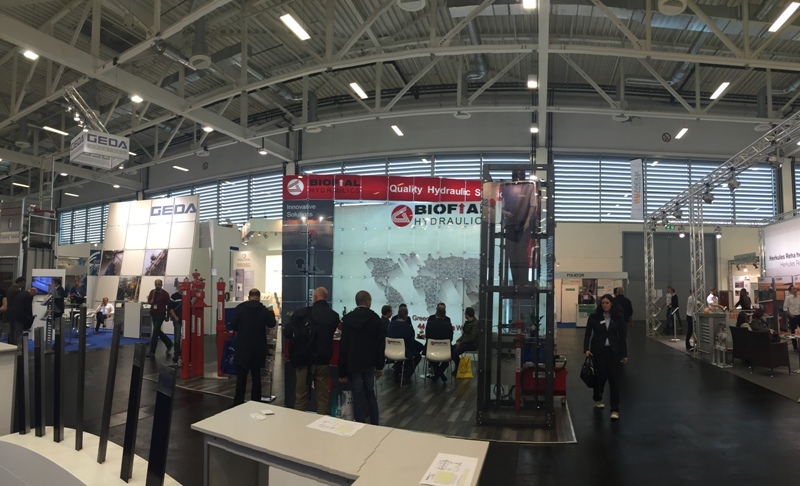 The thousands of international visitors from all over the world can find the BIOFIAL HYDRAULICS products both in our customers stand! 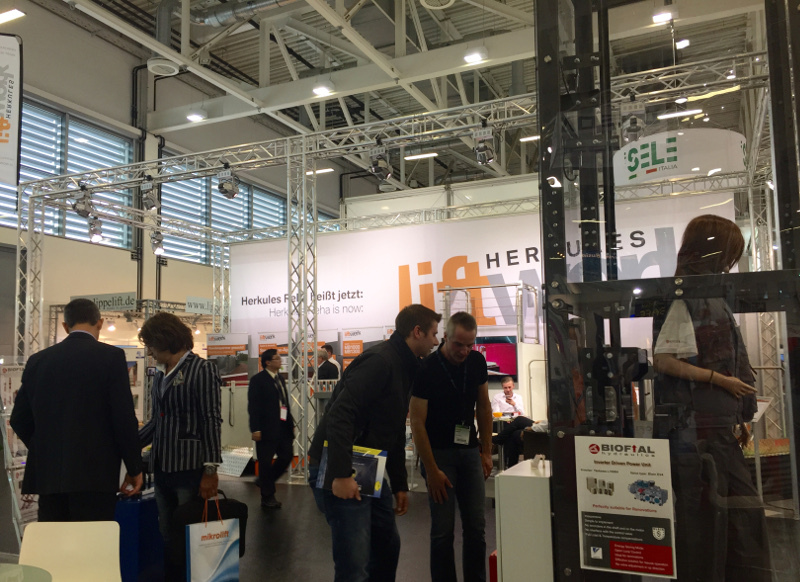 Our respective customers, the leading Bosnian lift manufacturing company EURO PROST and the new Belgian company GLOBALE LIFT, are presenting in INTERLIFT 2013 a home lift solution with BIOFIAL piston and power unit! We wish to our partners EURO PROST and GLOBALE LIFT every success! 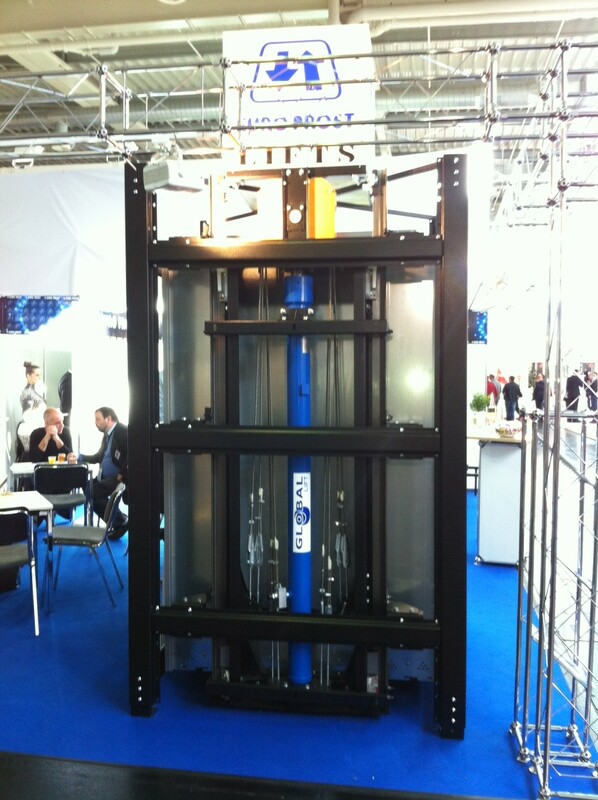 Once more BIOFIAL HYRDAULICS participates in Europe’s most important exhibition for the Elevator Industry, the INTERLIFT 2013! 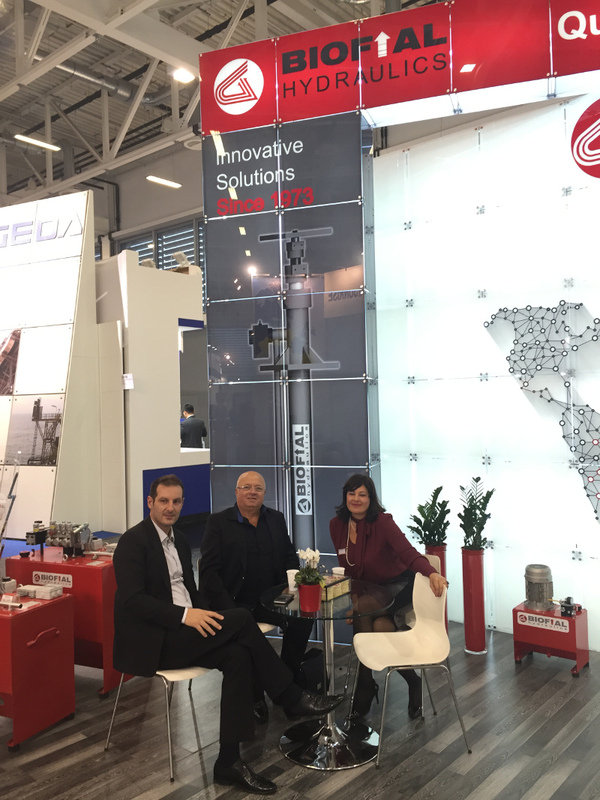 BIOFIAL HYDRAULICS team is in Augsburg-Germany exhibiting in INTERLIFT 2013 Exhibition, presenting our new products and waiting for our foreign customers and cooperators in stand 7154 / hall 7. You can see in the pictures below our stand at the exhibition and some of our representatives. BIOFIAL HYDRAULICS would like to inform its foreign cooperators that the company will remain closed on Monday the 28th of October 2013. 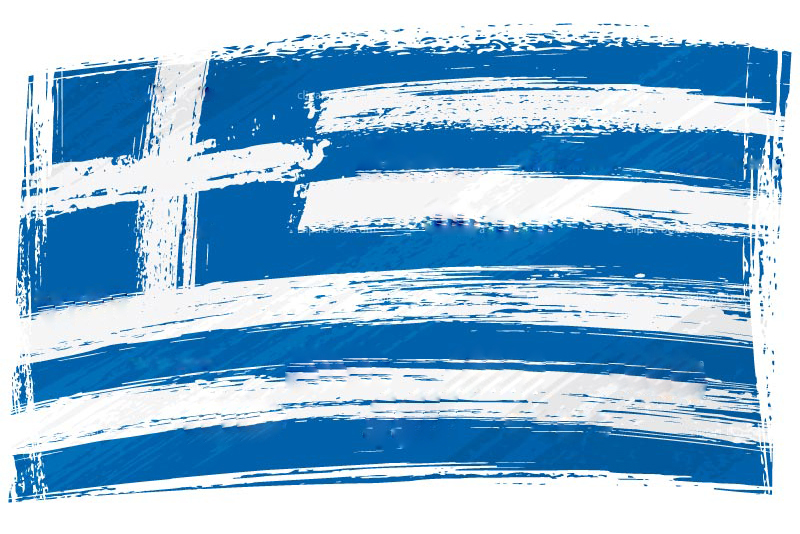 The 28th of October is a Greek public holiday, in observance of the ultimatum to occupy Greece on that day in 1940. BIOFIAL HYDRAULICS will be in your disposal again on Tuesday, October 29th. On Wednesday the 25.09.13 the new U.S. Consul General in Thessaloniki, Mr. Robert Sanders, hosted a reception at the consular residence, with local businessmen invited in a friendly evening of acquaintance where the main subject was the culture of entrepreneurship. BIOFIAL Hydraulics was among the few selected companies invited by the consular authorities and was represented by Mrs Chatziefstratiou K Fotini. We would like to inform you that, as we do every year, our company will be closed due to the summer holiday, for the period from 03-08-2013 till 19-08-2013. In case you have any pending orders which you would like to be delivered until 02-08-2013, we are kindly asking you to contact the BIOFIAL production department. We wish you a relaxing summer! Wir moechten Ihnen mitteilen, dass unser Bertrieb vom 03-08-2013 zum 19-08-2013 infolge Betriebsferien geschlossen ist. In Fall mussen Sie alle ausstehenden Bestellungen, die Sie mochten, bis 02-08-2013 geliefert, wir bitten Sie um die Produktion zu kontaktieren. Bilginiz olsun ki, her yıl olduğu gibi bu yıl da 03-19 Ağustos 2013 tarihleri arasında yaz tatili nedeniyle şirketimizin geçici olarak faaliyetini durduracaktır. Eger 02 Ağustos 2013 tarihine kadar sevk etmemizi istediğiniz her hangi siparişiniz var ise, lütfen imalat departmanı ile irtibata geçiniz. Если у вас есть какие то заказы в ожидании, которые вы хотели чтобы они были поставлены до 02-08-2013, мы любезно просим Вас связаться с отделом производства. Vi informiamo che la chiusura annuale per ferie sarà effettuata dal 03-08-2013 al 19-08-2013 (compresi). Nel caso in cui avete ordini in attesa del quale si desidera essere consegnati fino al 02-08-2013, stiamo chiedendo gentilmente di contattare il perarto di produzione. The Hydraulic Lift System Industry BIOFIAL S.A. yet for another year stays true to its commitment with all the international clients and associates and will participate in the most significant to the elevator industry European exhibition INTERLIFT 2013 in Augsburg, Germany, which will be held from 15 to 18 October 2013.
the «Car Sling for Hydraulic Elevators (Chassis) BLHI-6, BLHI-10 & BLHI-13». 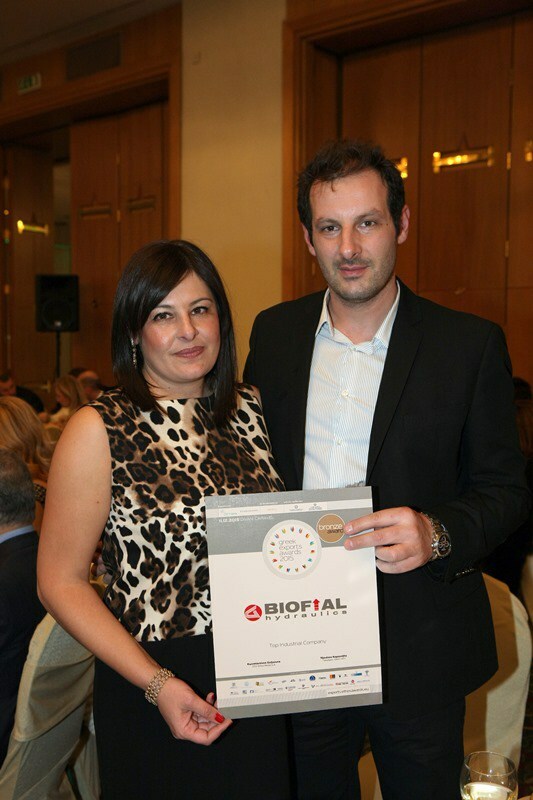 Also this year BIOFIAL and its personnel celebrate along with all customers and partners, the 40th year of a successful business history in the Greek market, but also the 23-years presence in the international market. Having established itself in the Greek and European region, BIOFIAL now focuses even more vigorously to new overseas markets, such as those in India, Argentina, the Sultanate of Oman, Canada and others, always maintaining the highest criteria of quality of products and impeccable personal service. 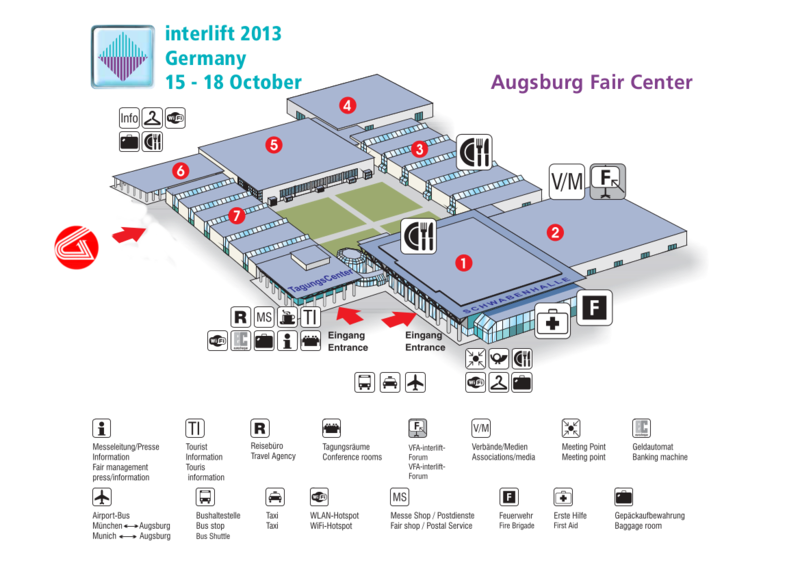 For additional information about the INTERLIFT 2013 exhibition you can visit the website www.interlift.de, as well as contact BIOFIAL directly. 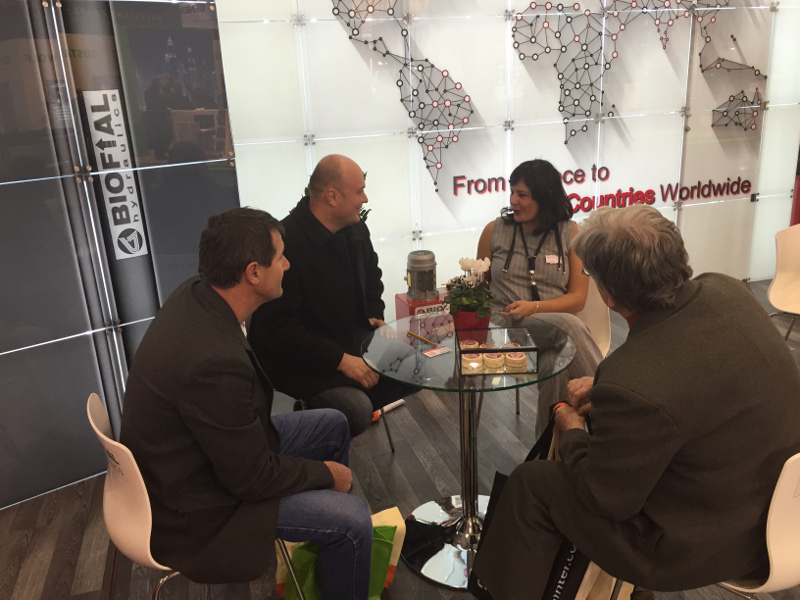 Miss Leontaridou Vasiliki (imports-exports@biofial.gr) will be at your disposal. 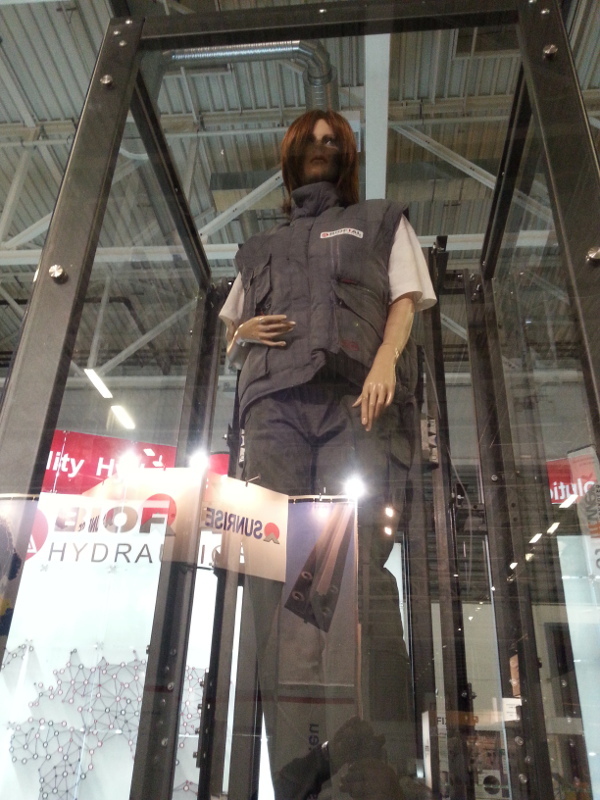 A safe, easy-to-install complete solution for lifting cargos from BIOFIAL HYDRAULICS. 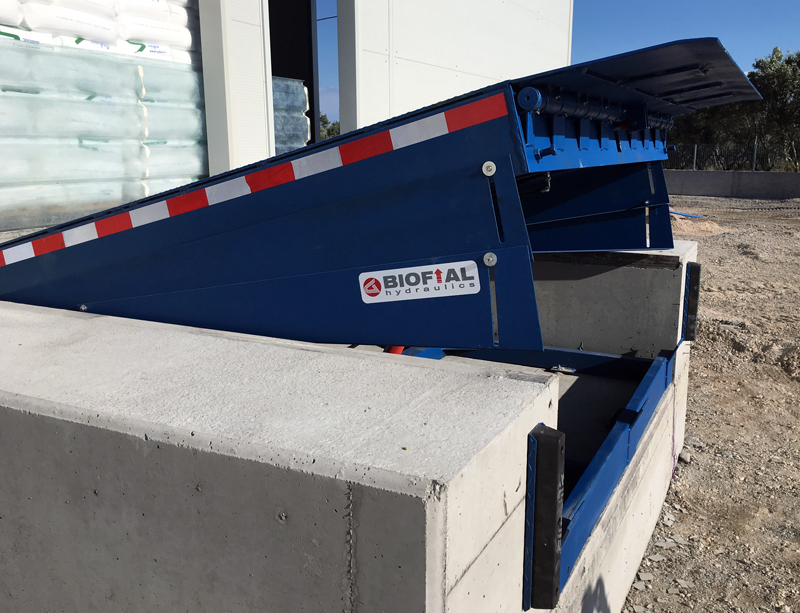 BIOFIAL, besides the qualitative hydraulic systems (pistons & power units), that produces the last 36 years, is now launching its new product line, the “BIOFIAL Compact Cargo Lifts”! The new product line, offers a safe, easy-to-install complete solution for lifting cargos, mainly for industrial and logistic applications/projects, where there is a need of a hydraulic lifting solution that provides safety in use, durability in heavy cargo lifting and reliability in intense working conditions. BIOFIAL successfully participated in the 12th International Exhibition ASANSOR ISTANBUL 2011 which took place in Istanbul, Turkey. One of the most widely known exhibitions of eastern Europe that promotes the elevator industry was open to public from 14 to 17 April 2011. The ASANSOR ISTANBUL 2011 exhibition was for another year the ultimate meeting point for professionals of the industry, with the participation of more than 300 exhibitors from 70 different countries to attract the interest of visitors from around the world.BIOFIAL welcomed in addition to its existing customer, visitors from all the major companies in the industry, coming from Turkey and many other countries worldwide, earning very positive impressions and achieving valuable new partnerships. 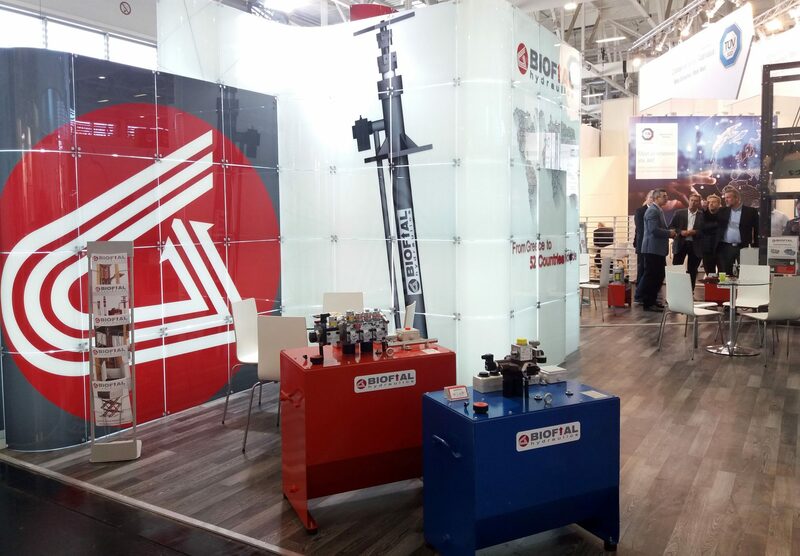 BIOFIAL commits to the participation in other international exhibitions of the same range, reinforcing its active presence among the leading manufacturers of hydraulic systems in the world. In the photos and video below you can see BIOFIAL’s stand and watch a brief interview by the companies executives Ms. Hatziefstratiou Fotini and Mr. Theocharis Dimitrios in SKYTURK TV & TGRTHABER TV Turkish TV channels.